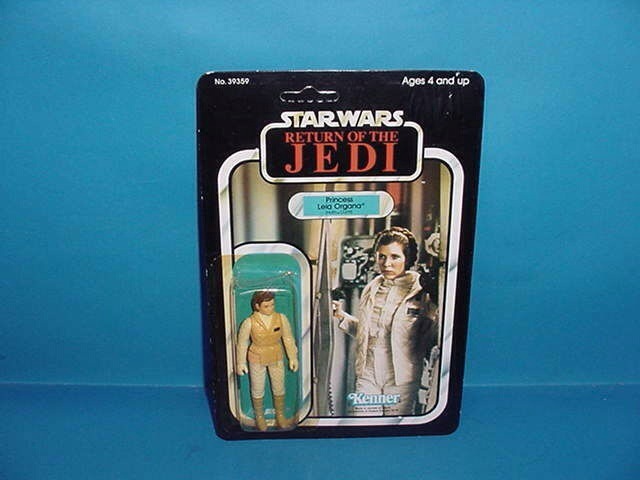 After a lengthy update on the ROTJ line in October we’re ready to keep plugging away on our series by series review. 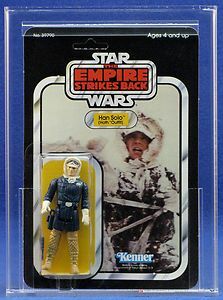 This month the focus is all things Episode 5 as we take a deep dive into the Empire Strikes Back toy line. 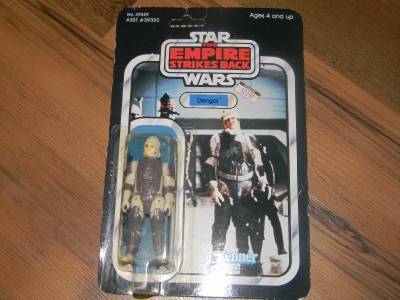 Much like the movie itself this is regarded as one of the best; if not the best series of toys to come out in the original trilogy. 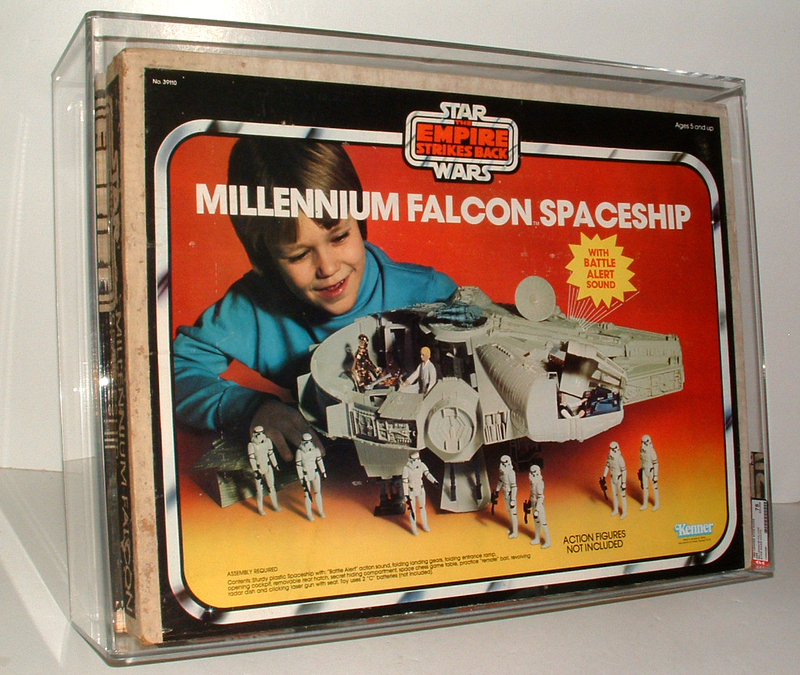 We have a lot of cross over with the original Star Wars series with such favorites as the Falcon and X-Wing being re-branded for the new movie, and newbies such as the At At and Slave 1 that have become fan favorites. 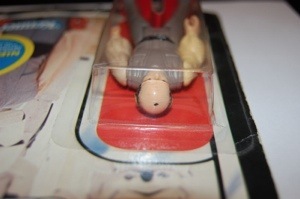 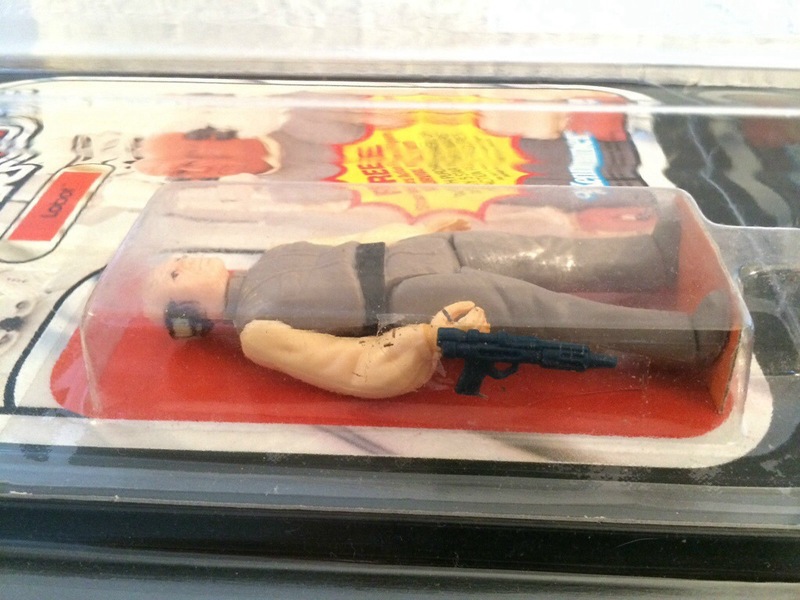 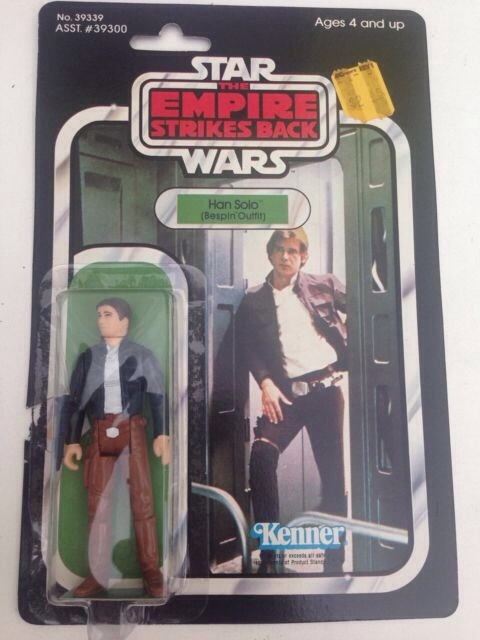 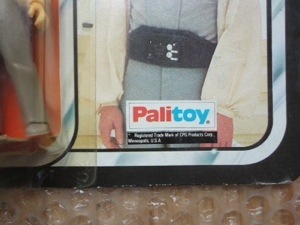 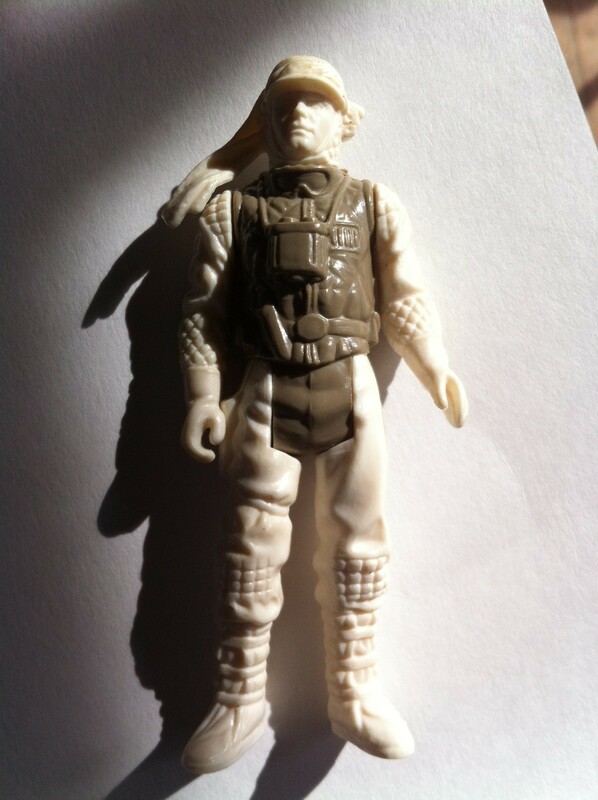 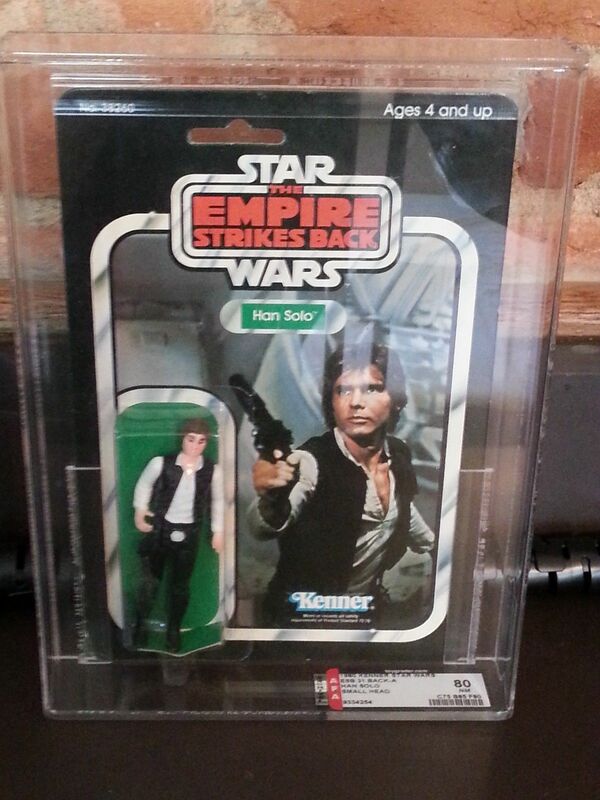 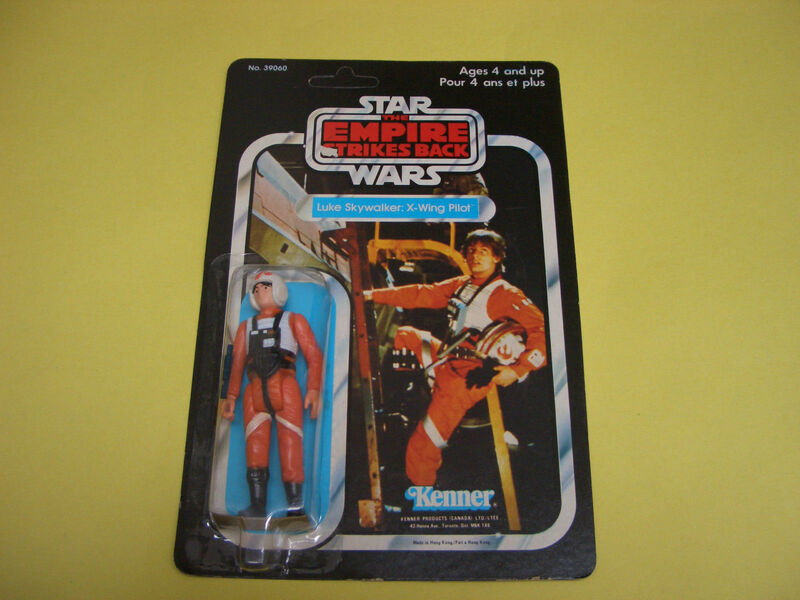 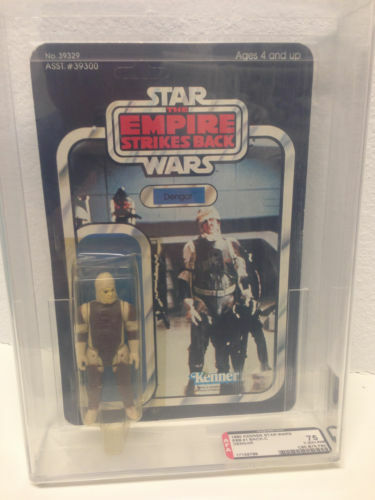 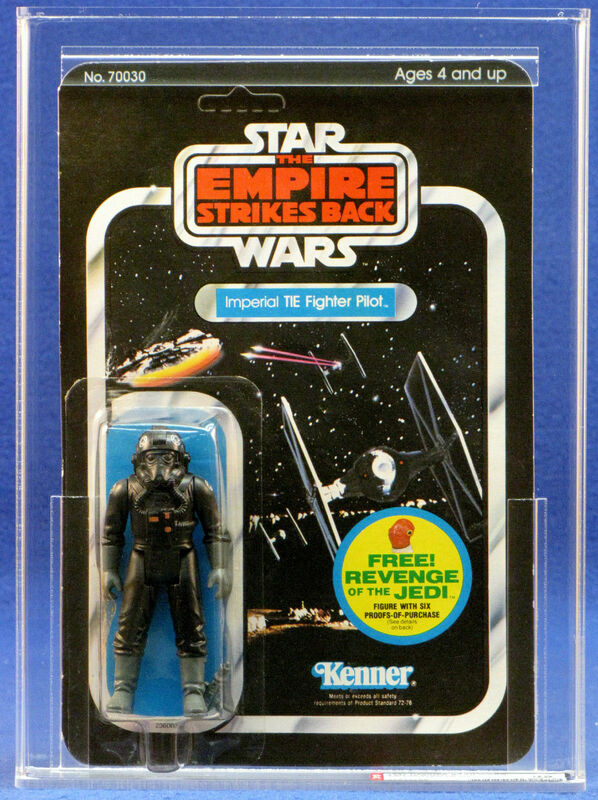 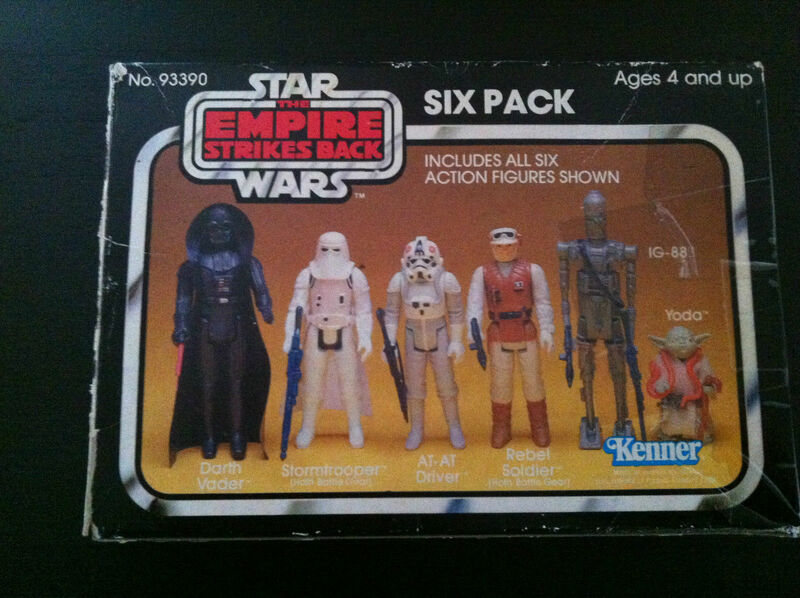 In addition to the main 3 ¾ inch line we also saw some cool and unique concepts that were only seen with the ESB release such as the Micro Series, a Puppet and the infamous Yellow and Red 6 packs. 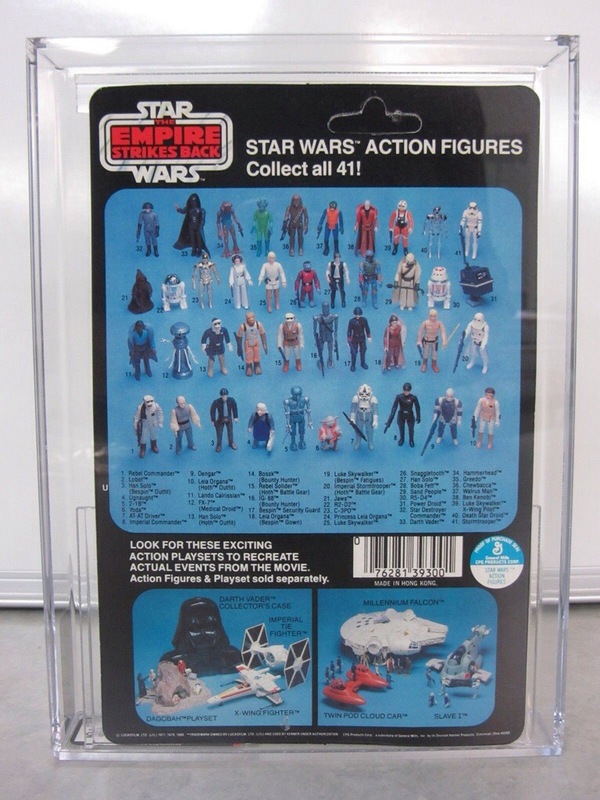 With so much to choose there are a lot of directions we can go, sadly we don’t have any recent 3-Pack sales and some areas are a bit limited due to lack of sales activity. 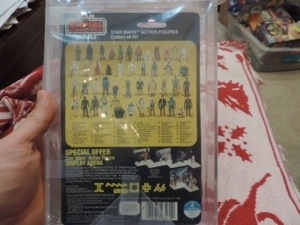 Thus we are just offering a sample of some of the key items seen with this release from the main areas including, MOC, MISB Boxed Items, Micro Series, Die Cast and a few truly rare and unique items that came up in the market over the past few months. 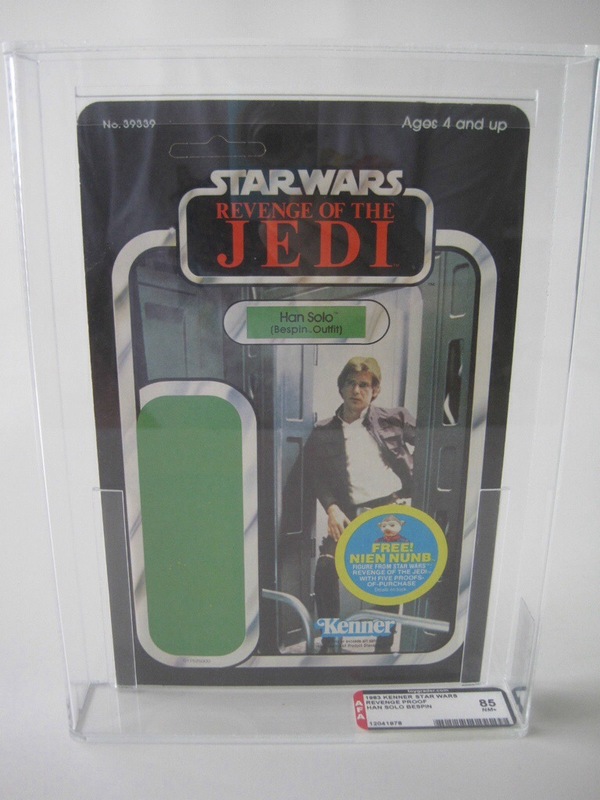 The post was updated on 12-1-13 in order to incorporate some recent auctions with items from the early part of the Holiday season that weren’t covered in our original post. 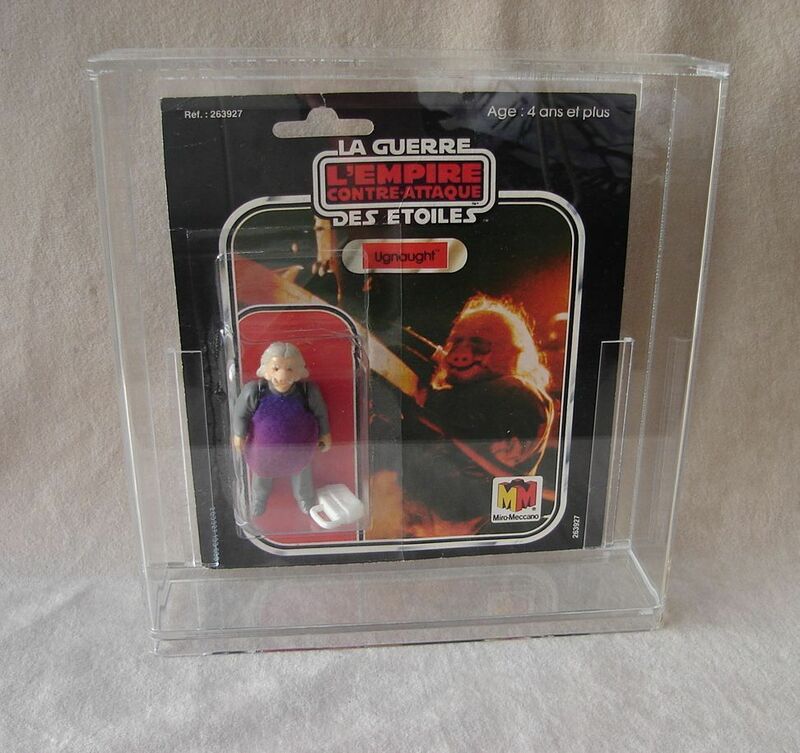 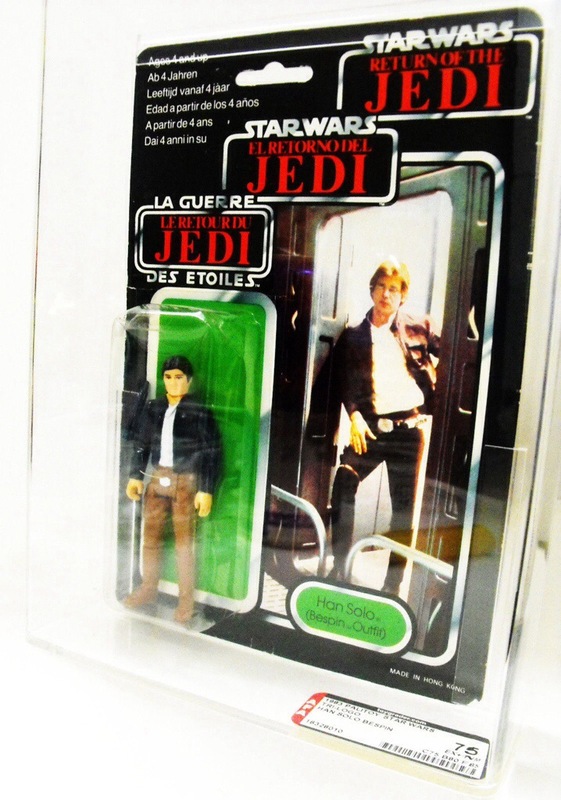 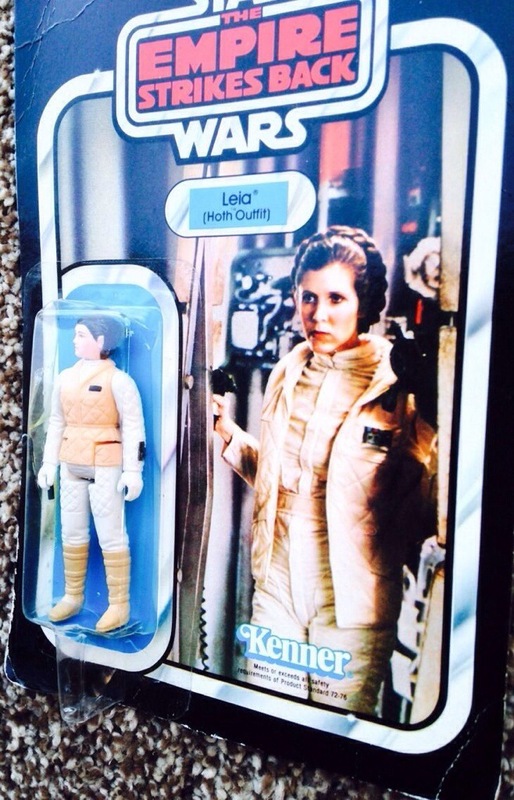 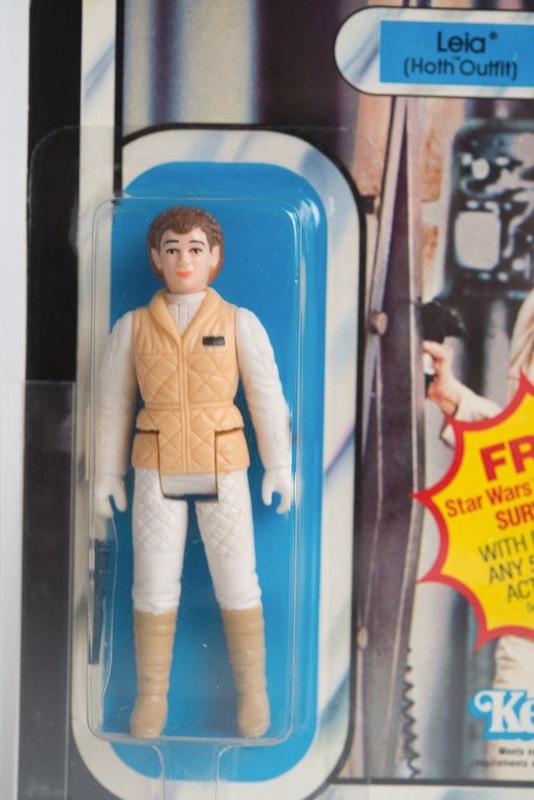 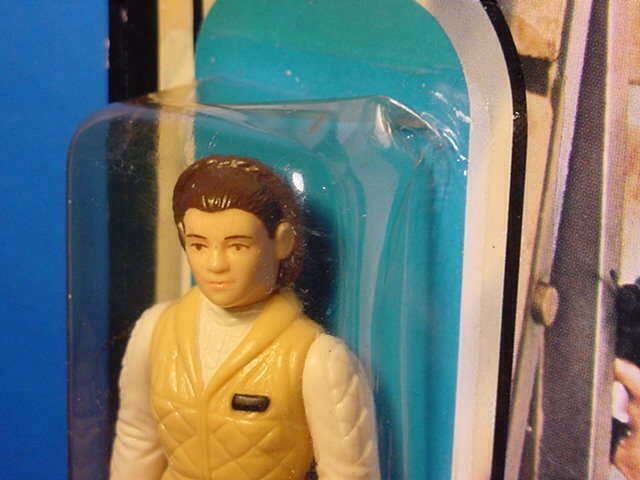 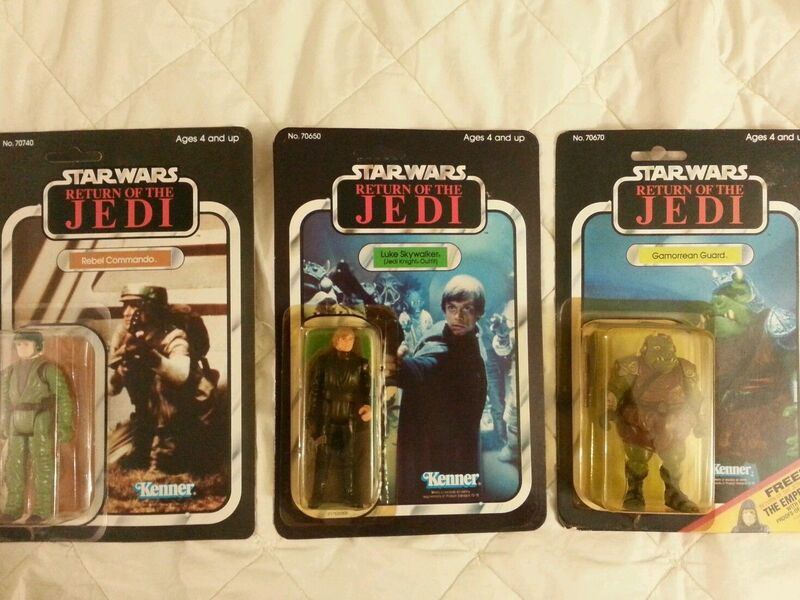 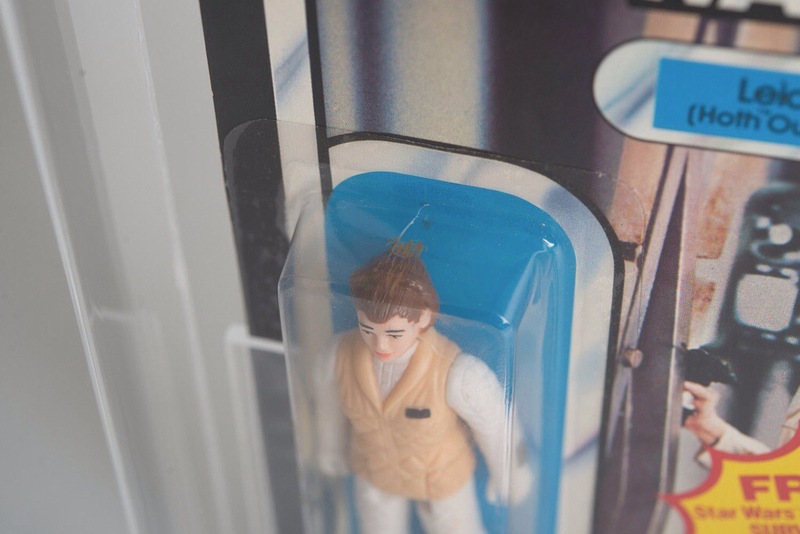 We kick off our review of the ESB line with the core of the vintage toy line, the figures. 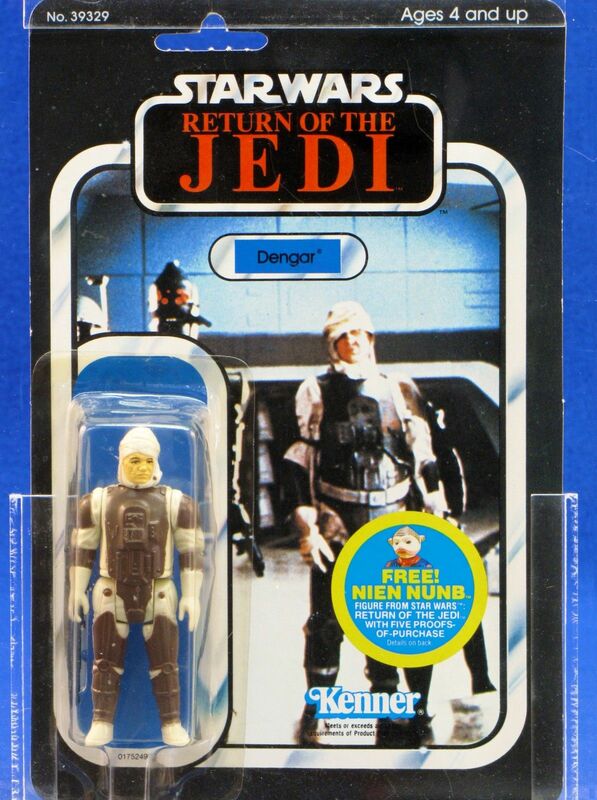 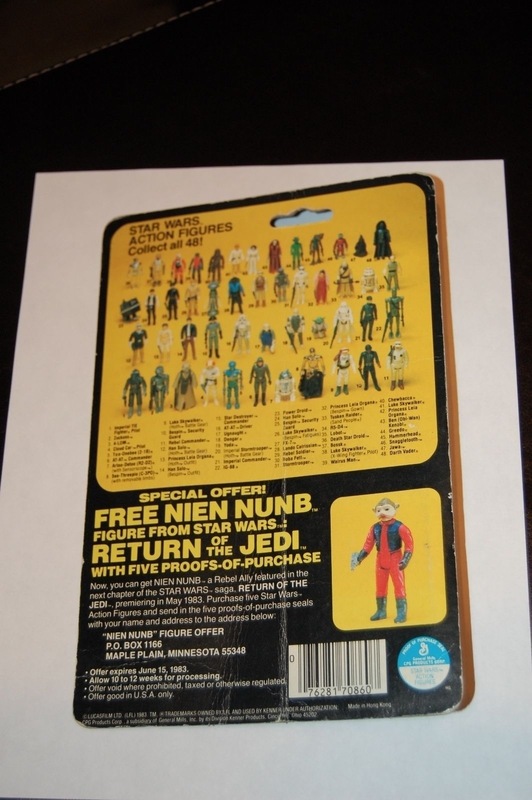 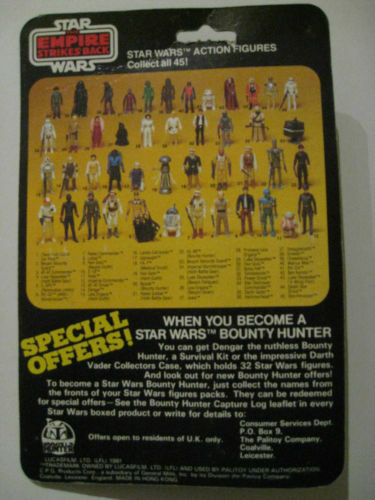 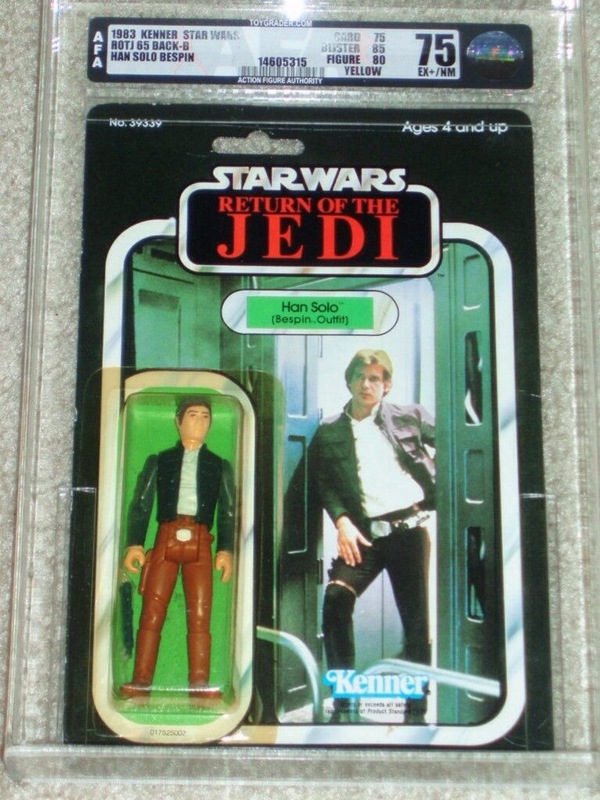 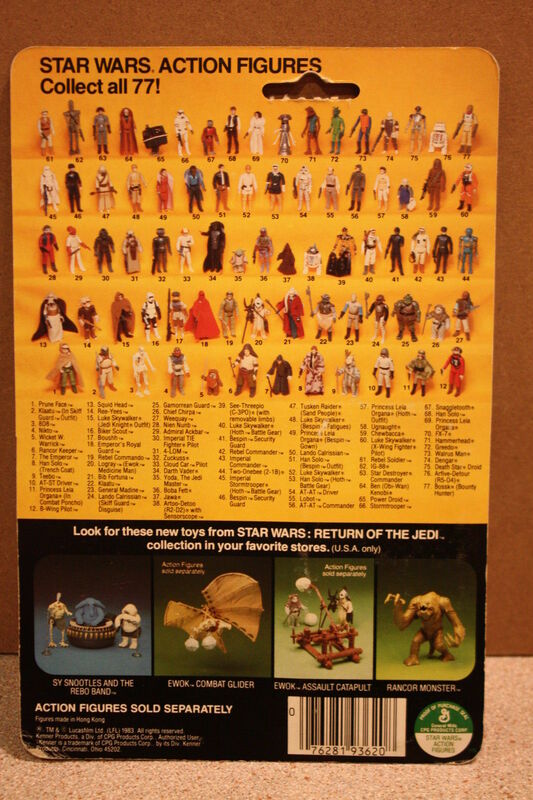 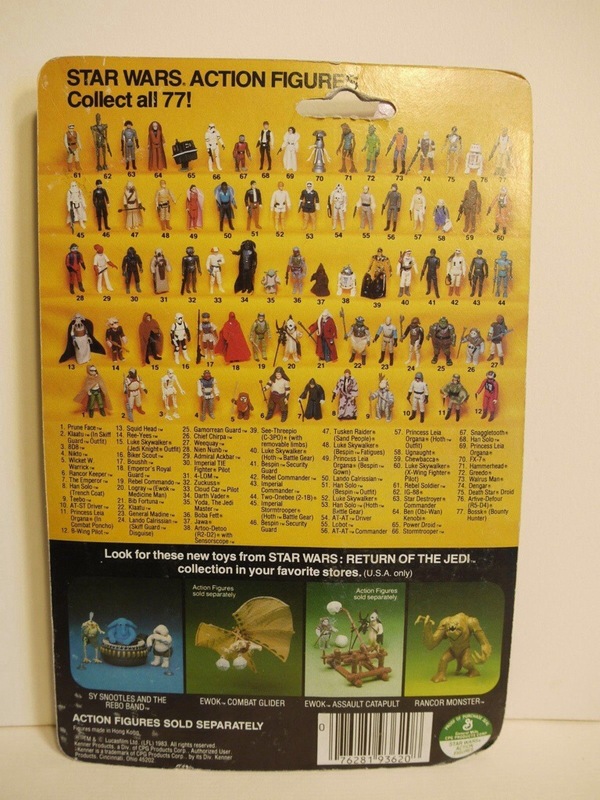 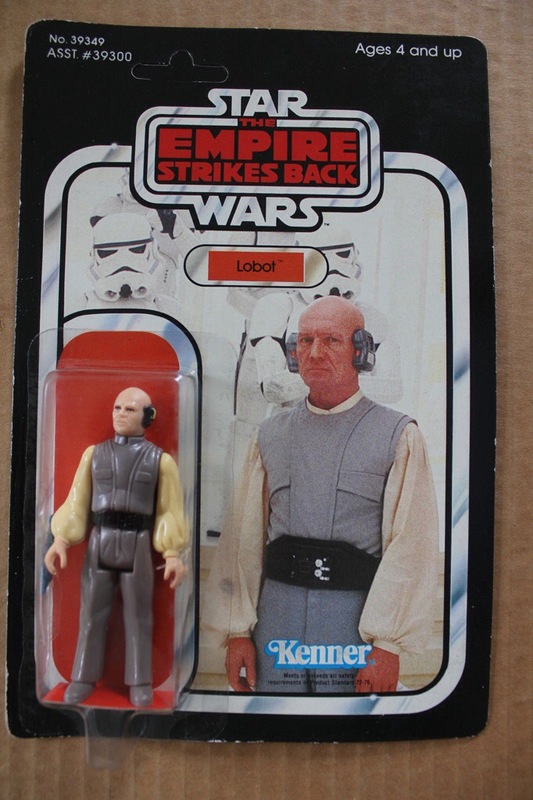 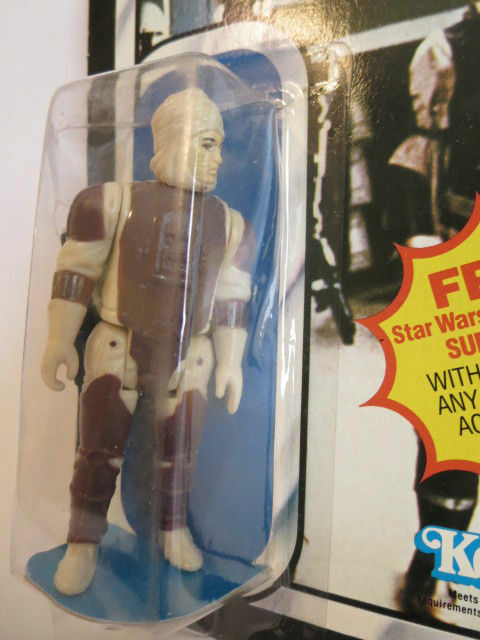 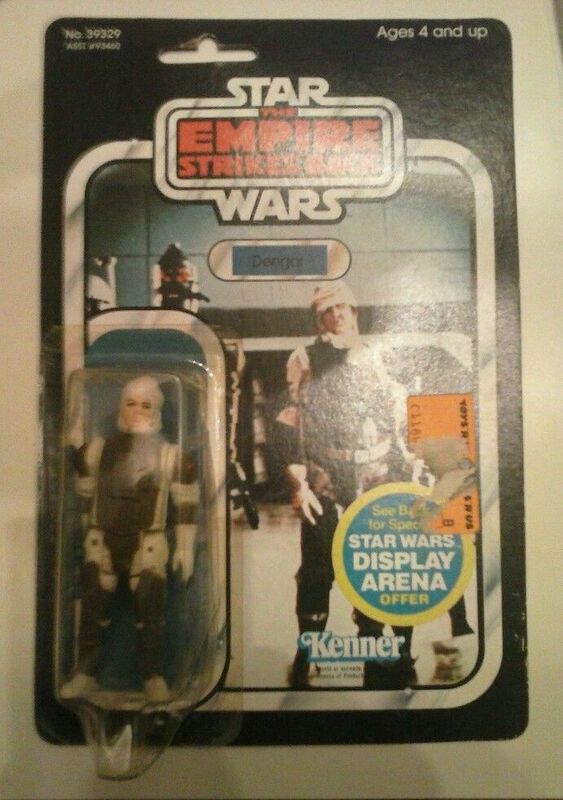 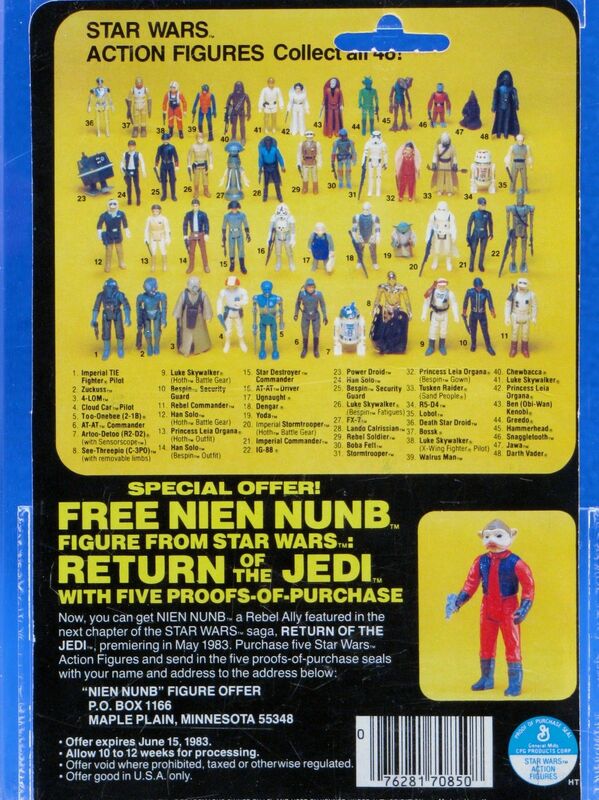 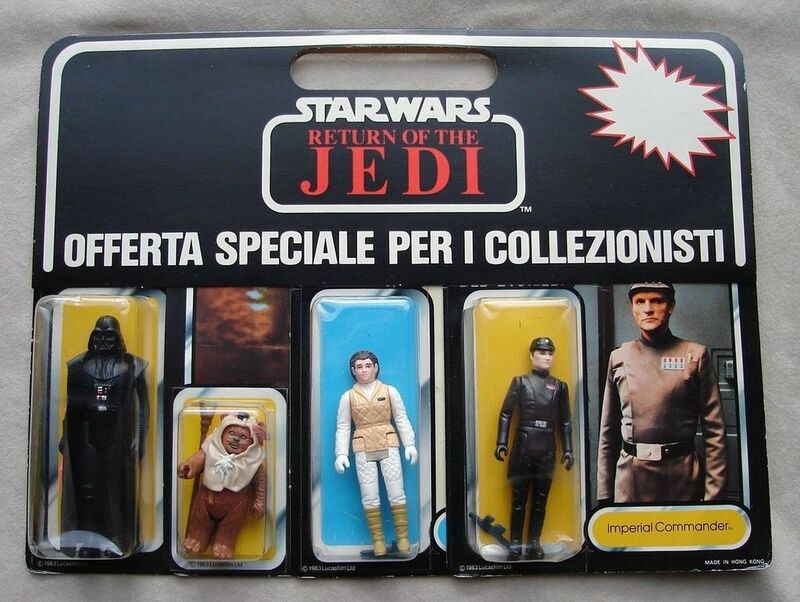 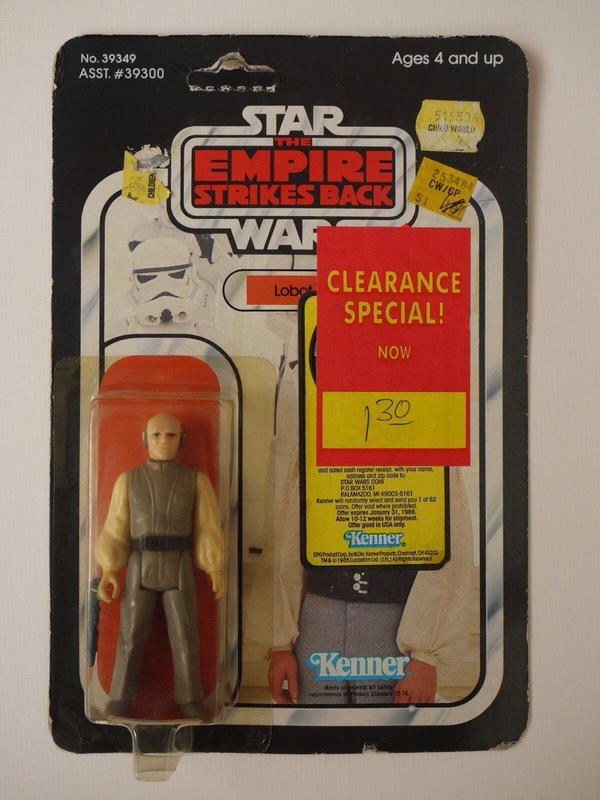 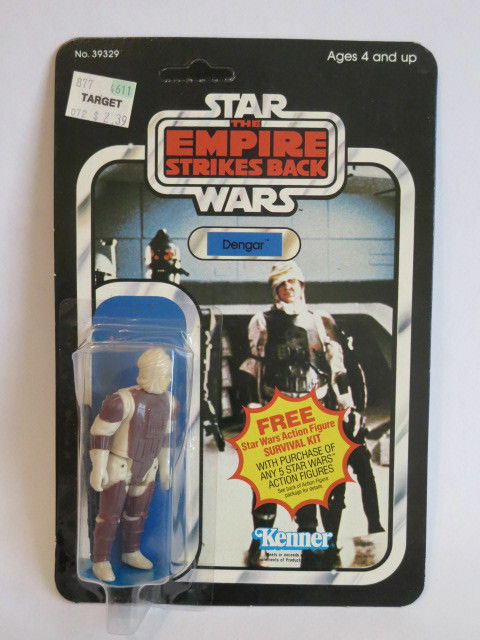 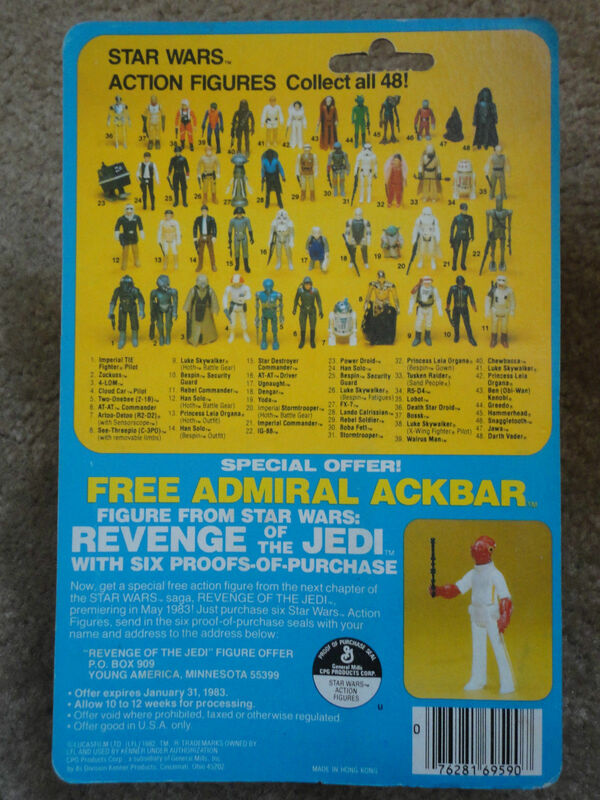 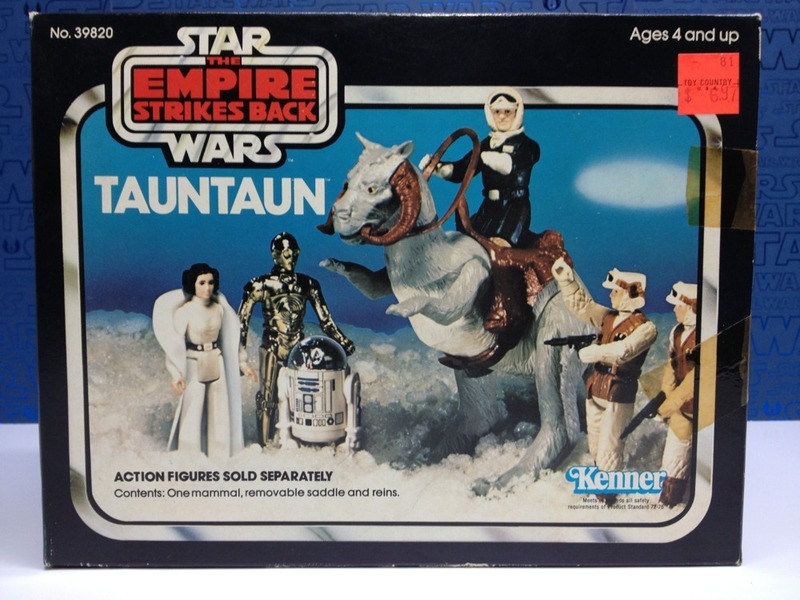 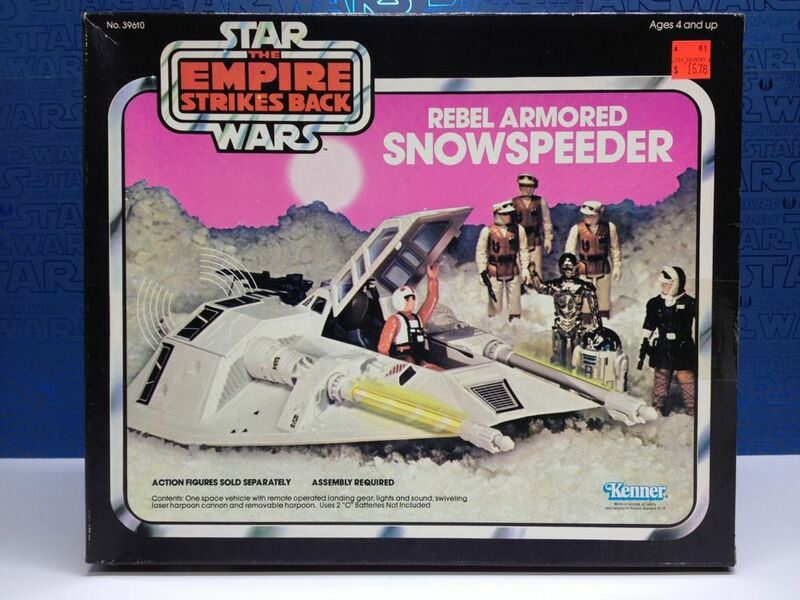 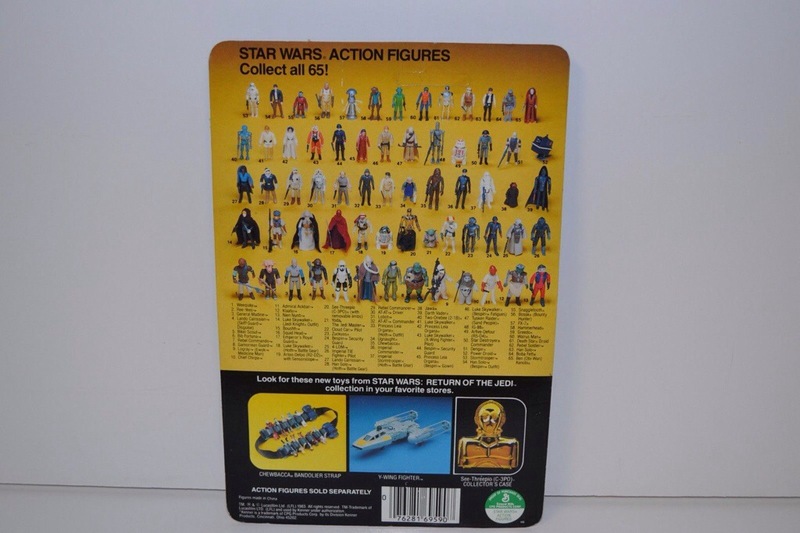 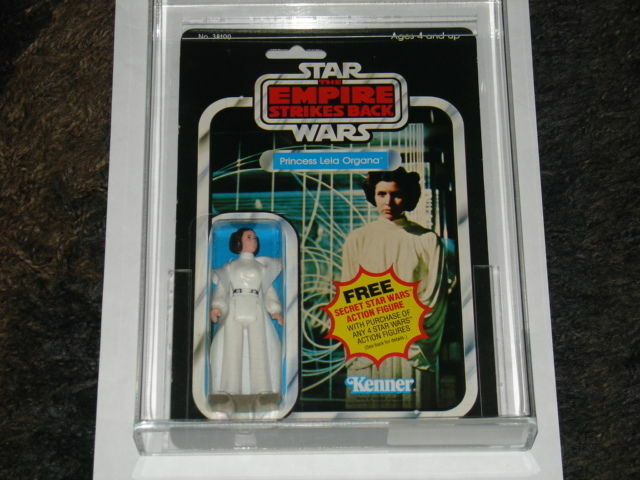 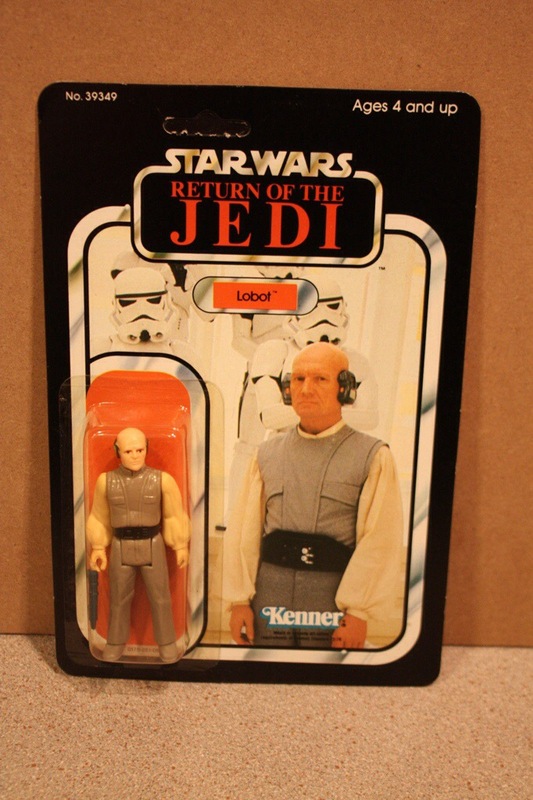 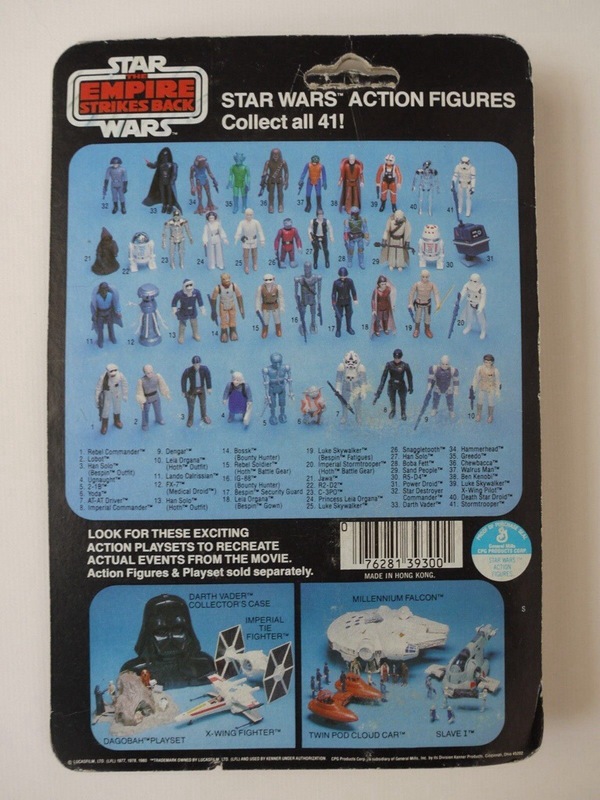 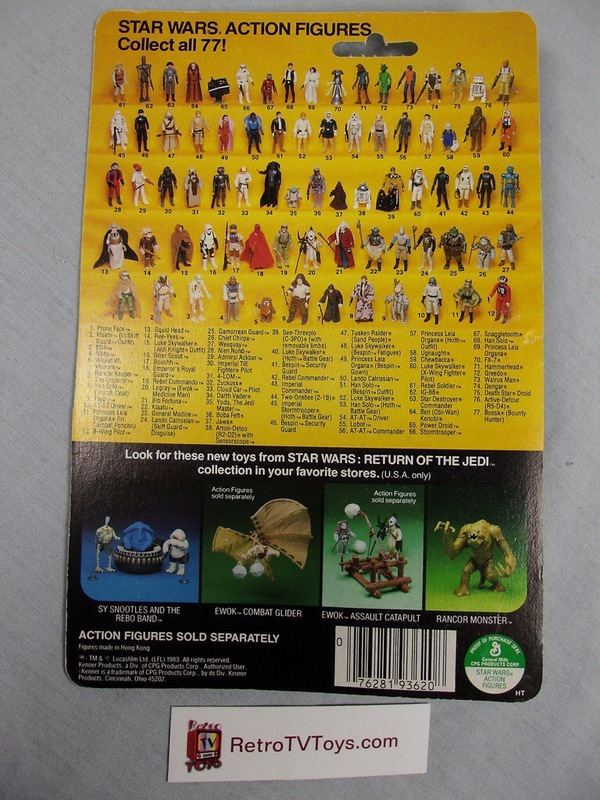 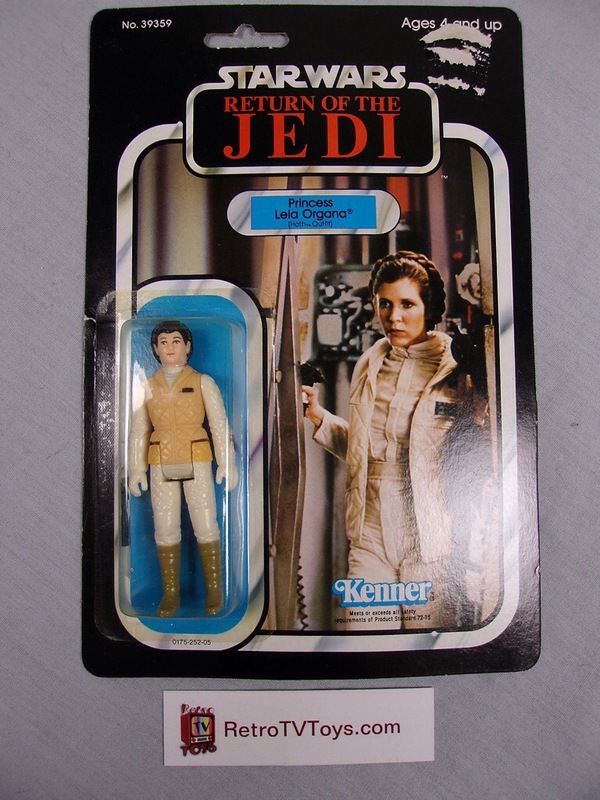 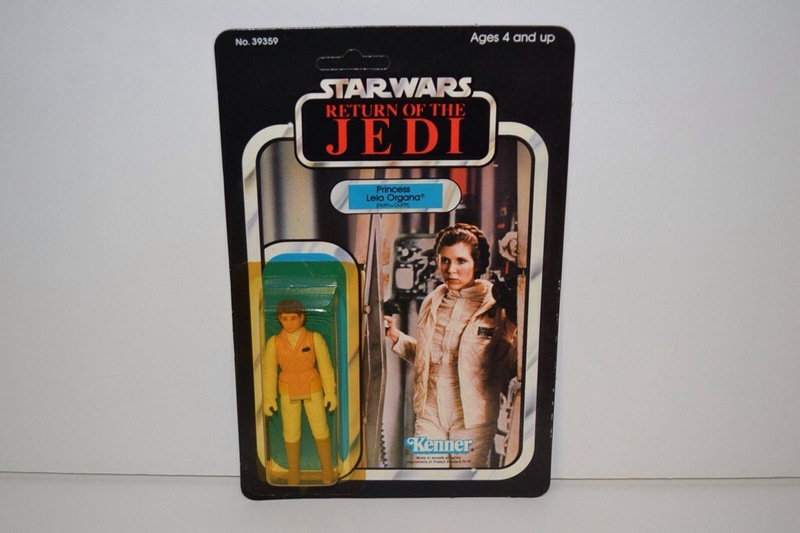 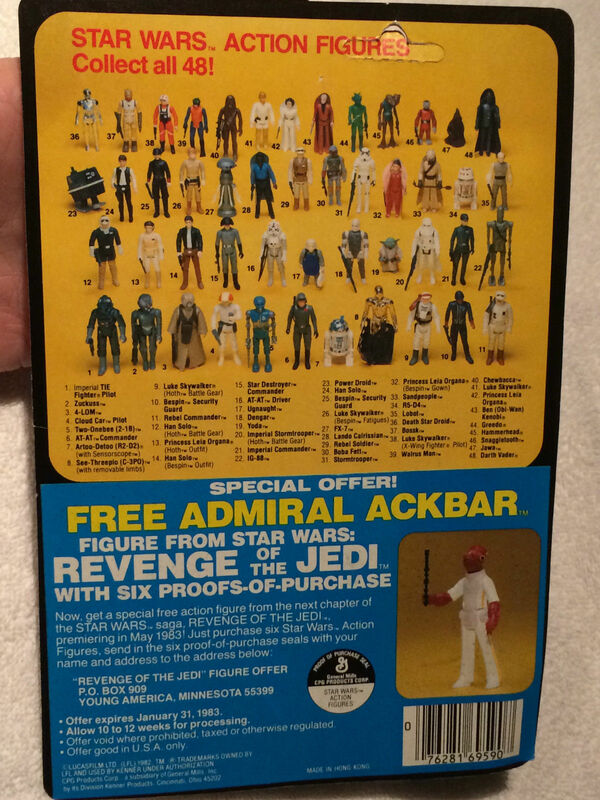 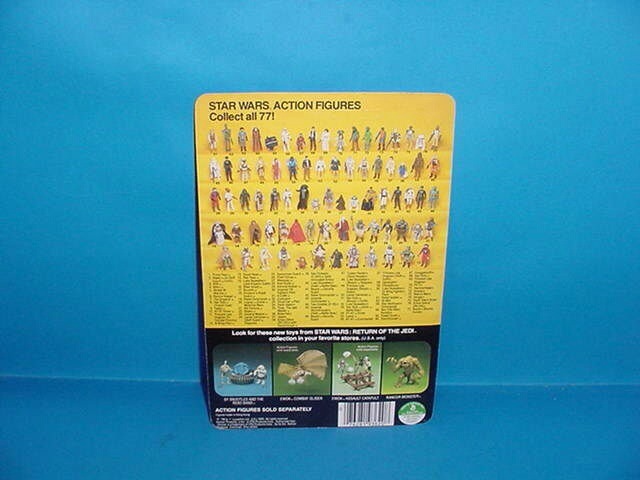 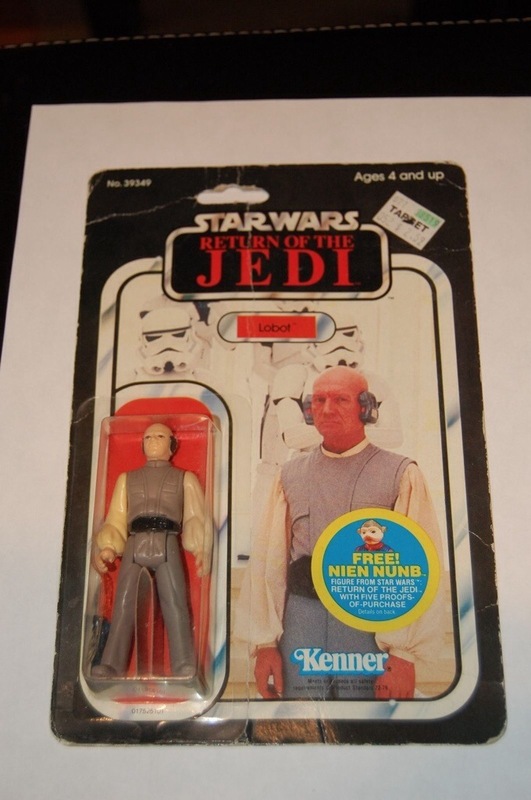 With 27 new figures released for the movie this was the second largest release for any of the Vintage Star Wars toy lines. 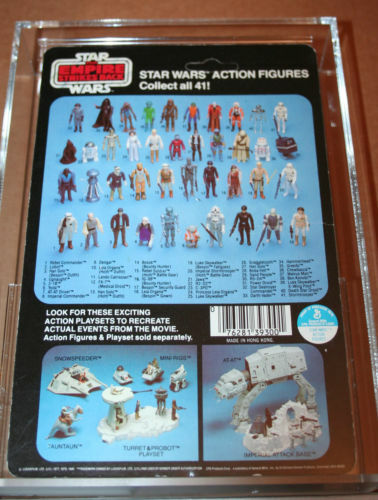 Here we saw variations of Hoth and Bespin put on the key leading characters, and an expansion to some great ideas that were missed in the original release such as releasing the generic soldiers and other ancillary but very present staples from the background of the movies. 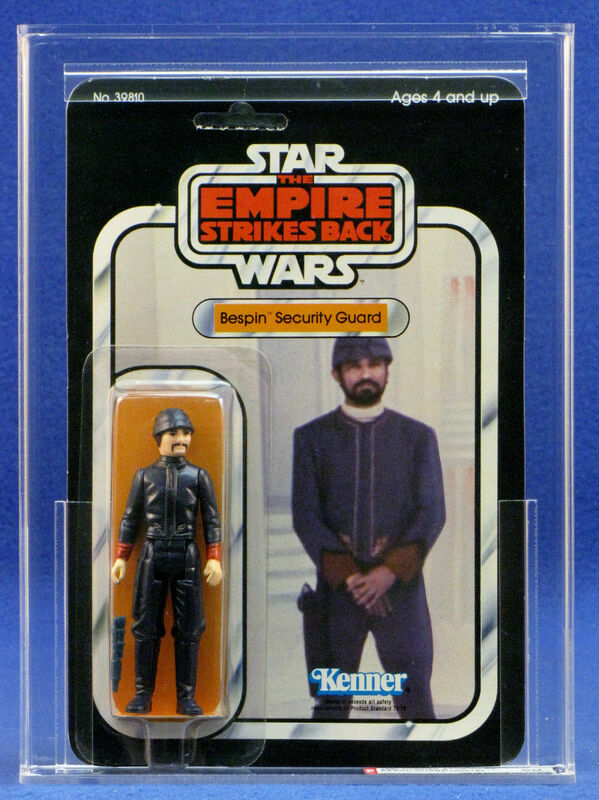 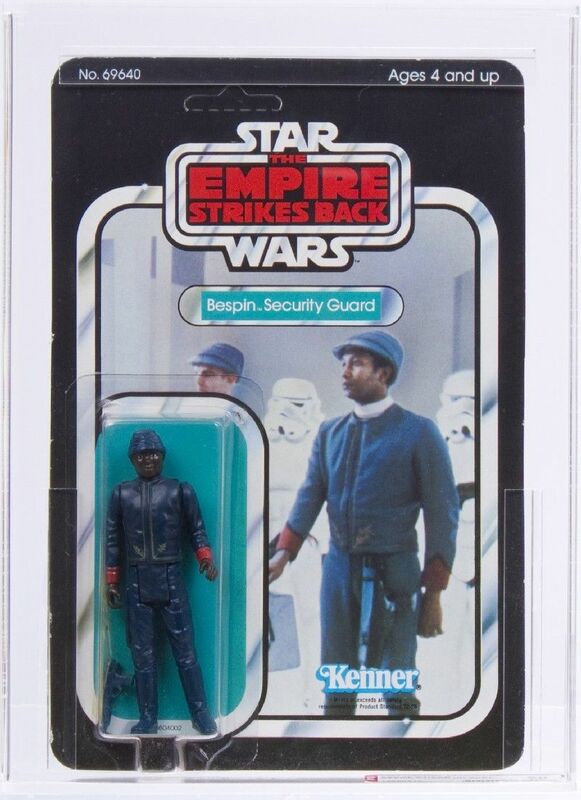 We saw the first and only double release of a figure based on skin color (Bespin Security Guard), the bounty hunters and of course new characters such as Lando and Yoda. 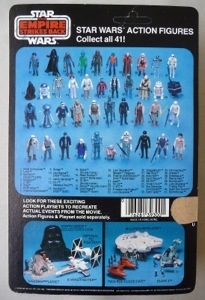 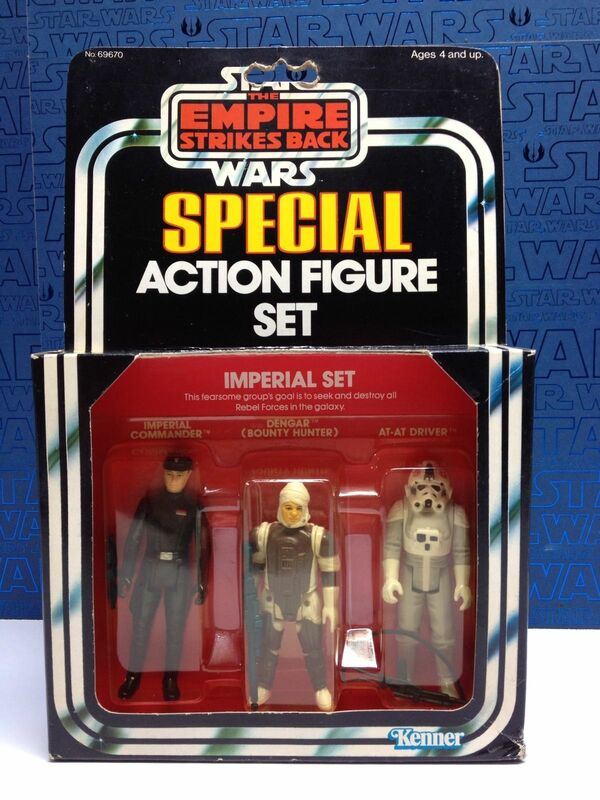 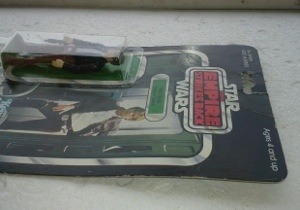 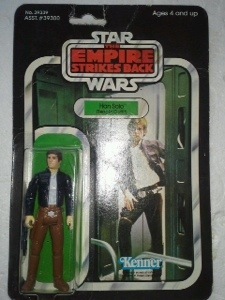 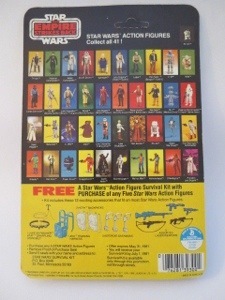 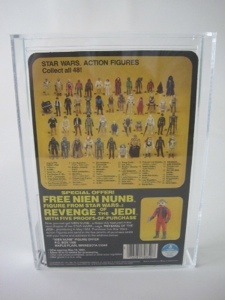 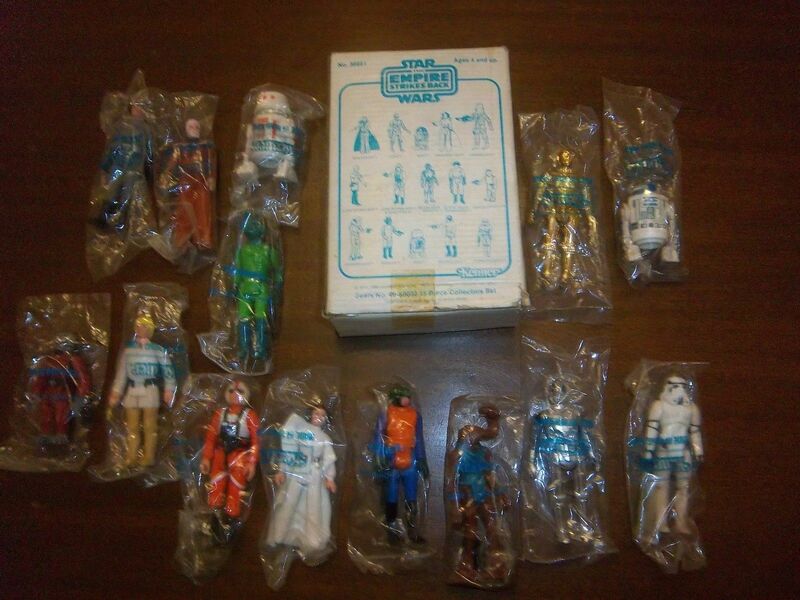 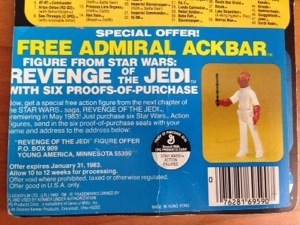 All in all these moves made the ESB line a great second movement in the Vintage Star Wars toy line. 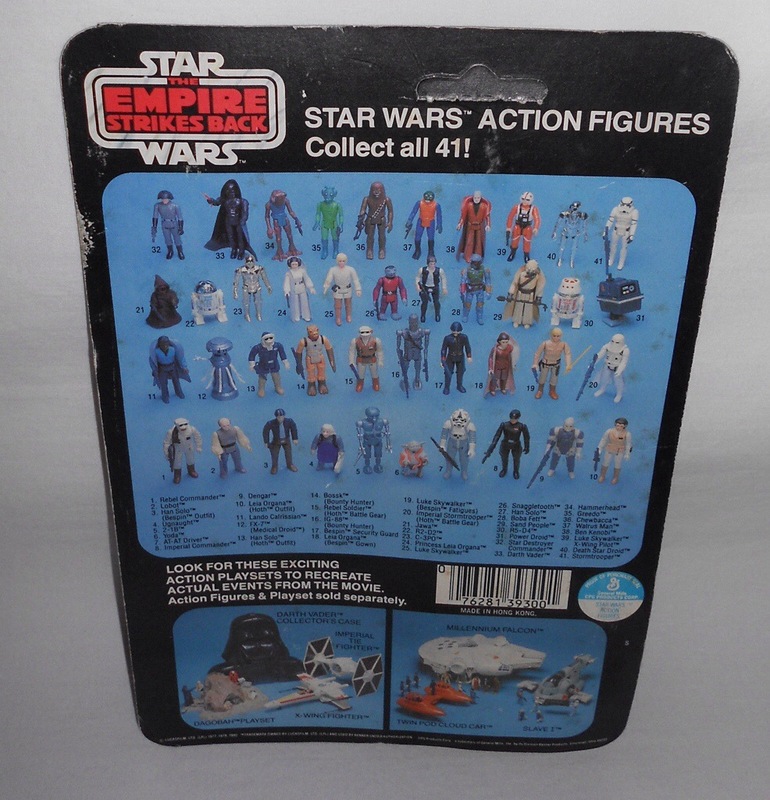 In our examples this month we find a great variety of items to discuss, all in all the prices on this line remain very strong, especially for higher grade examples. 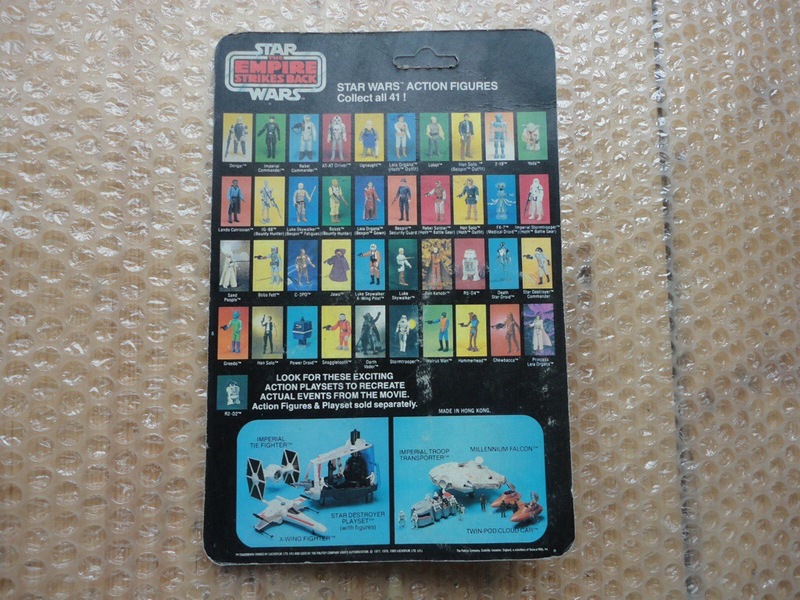 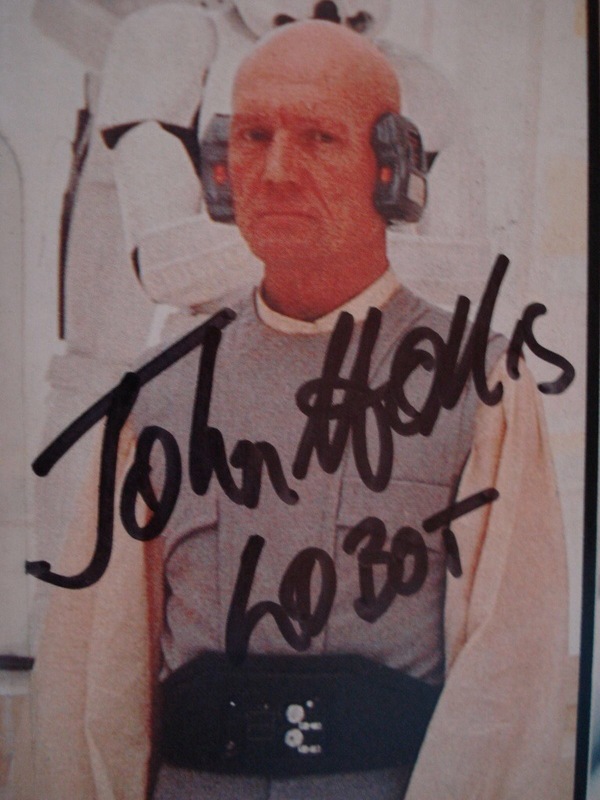 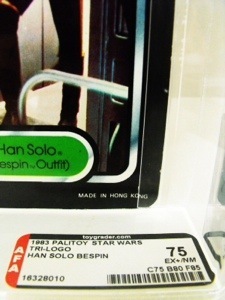 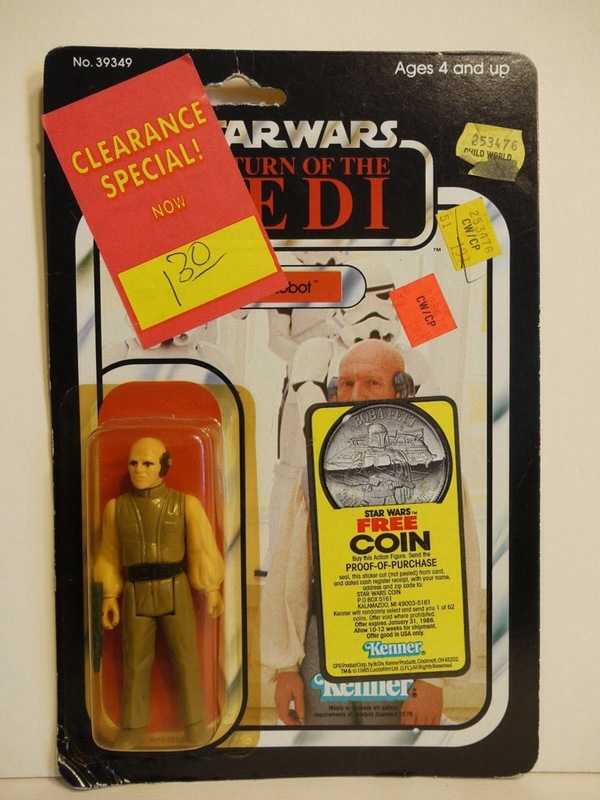 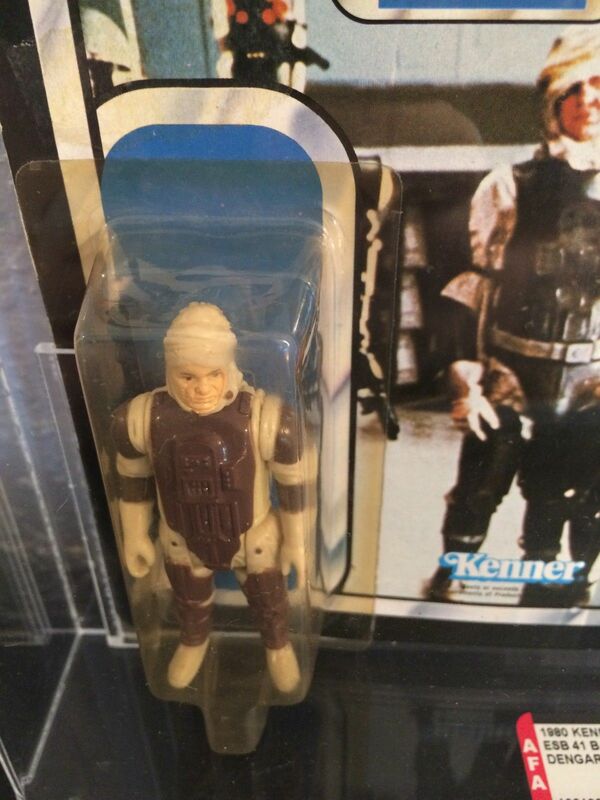 Some of the key highlights include a 21 Back (Rare) Stormtrooper, an Orange Hair Luke Tatooine, and two very high priced items in the form of Han Bespin and Luke Hoth which both saw ending prices above the $1000 mark. 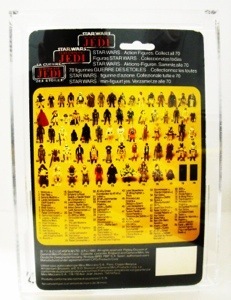 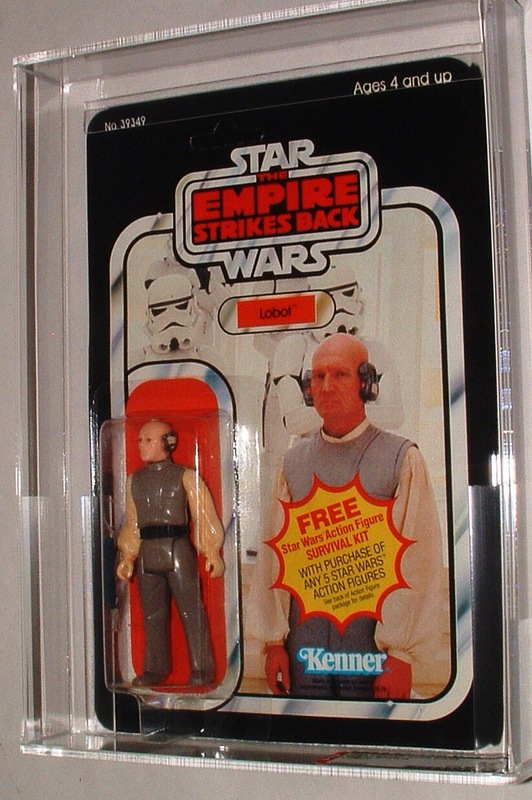 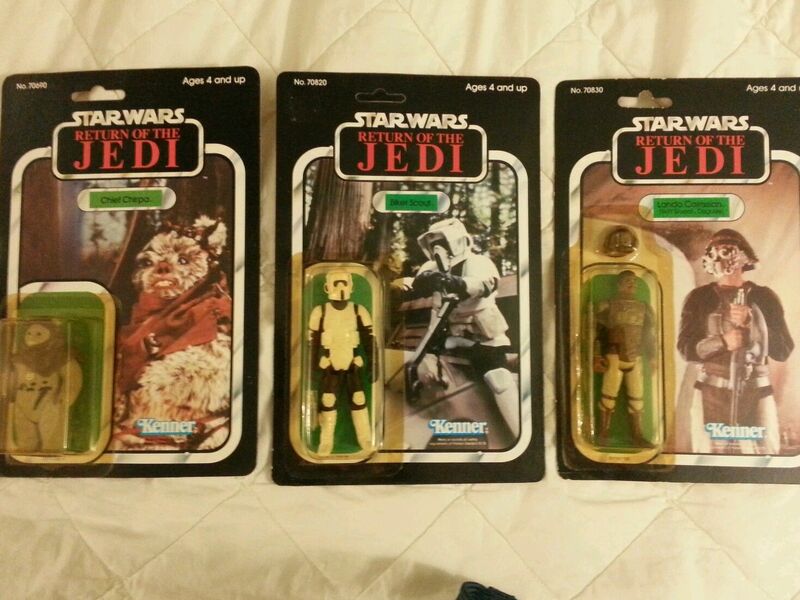 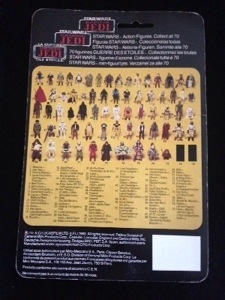 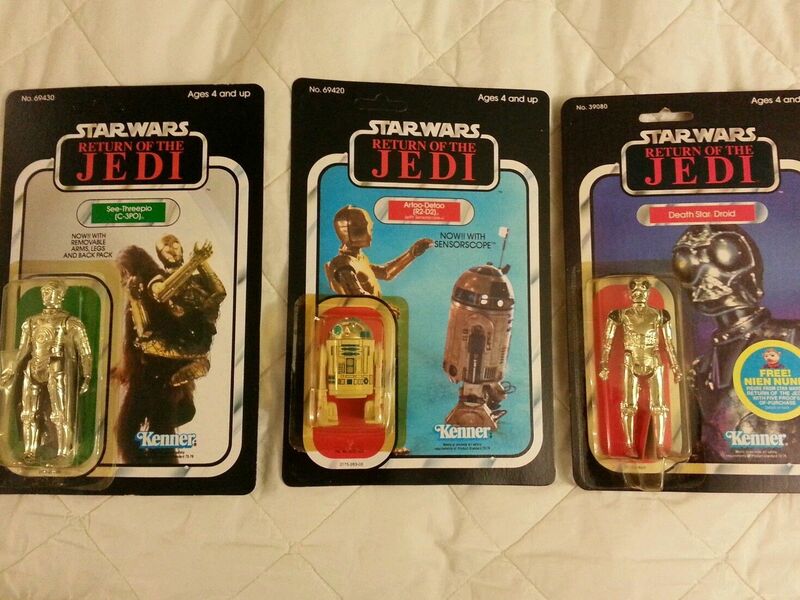 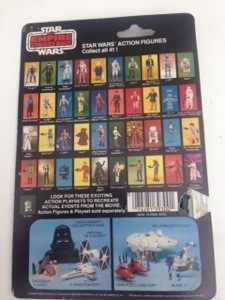 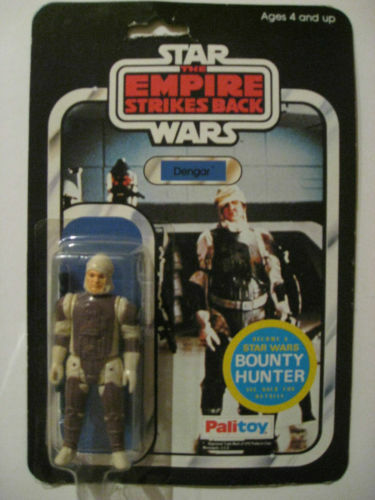 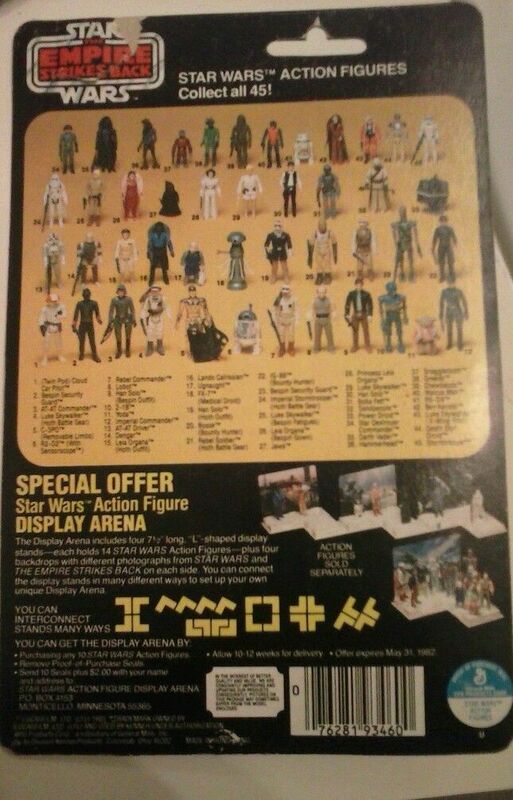 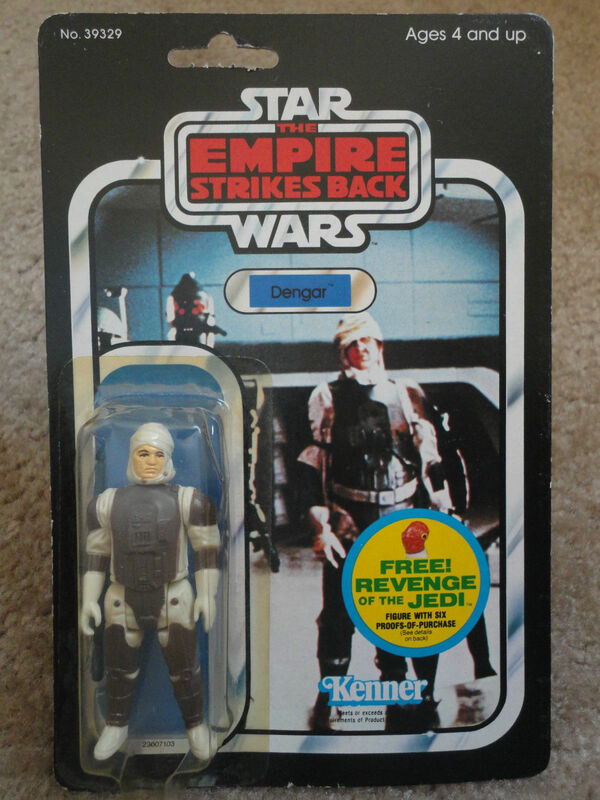 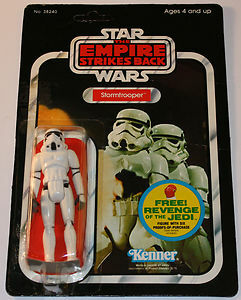 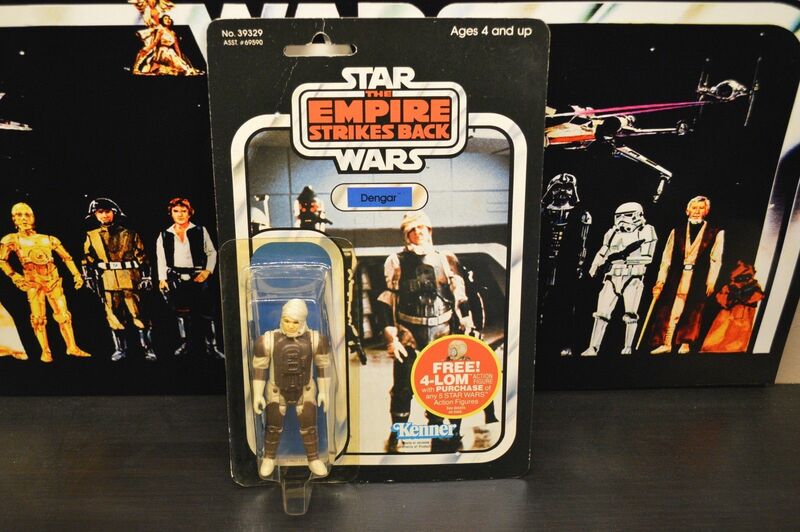 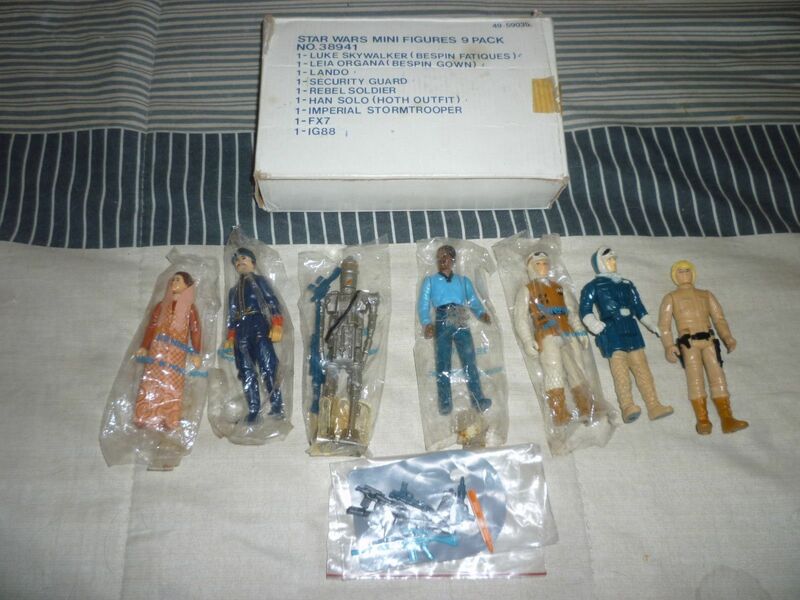 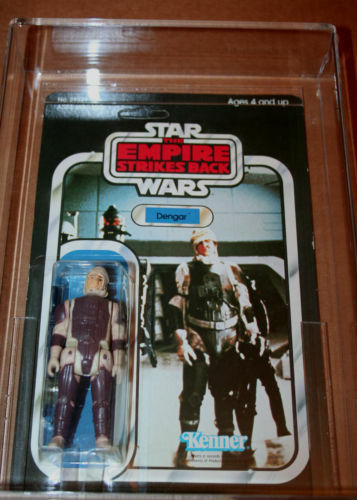 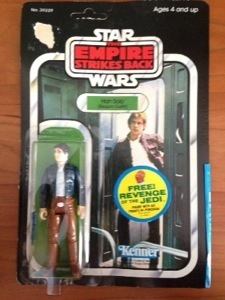 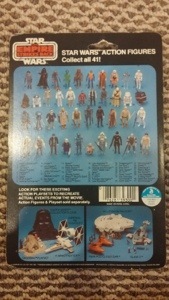 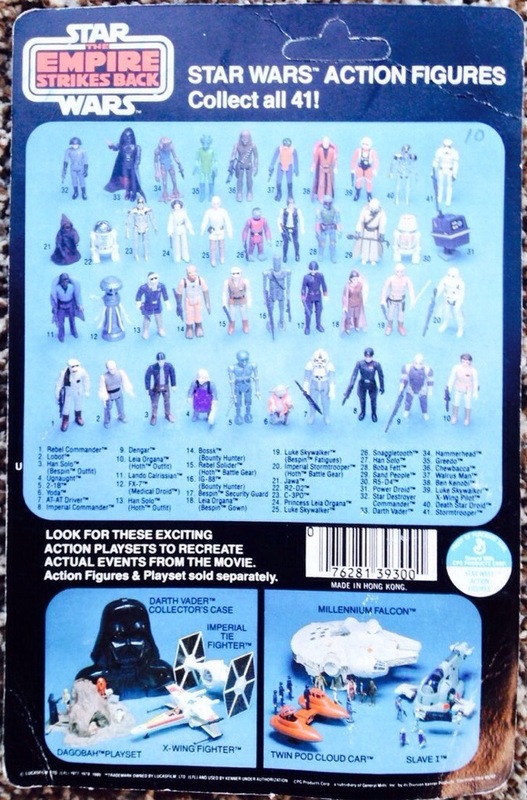 The Die Cast line was a short run continuation of the line that started with Episode 4 and carried on through the ESB line. 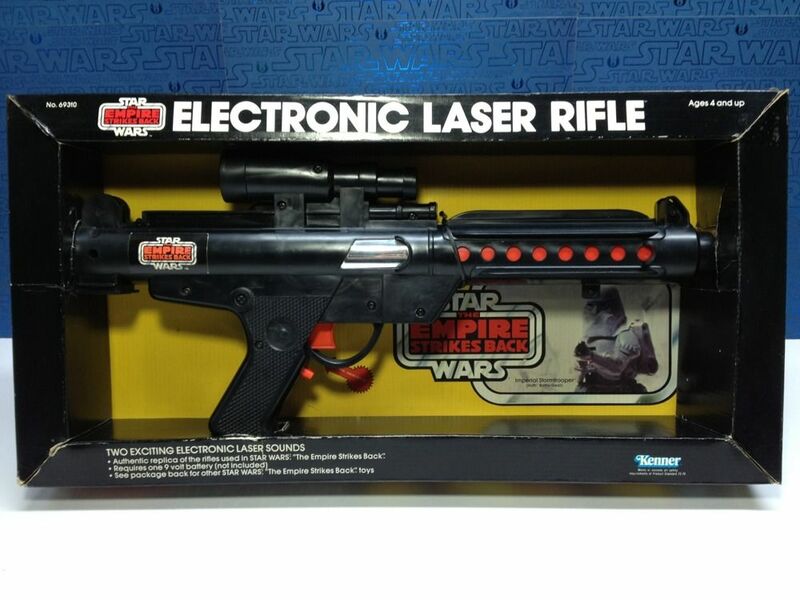 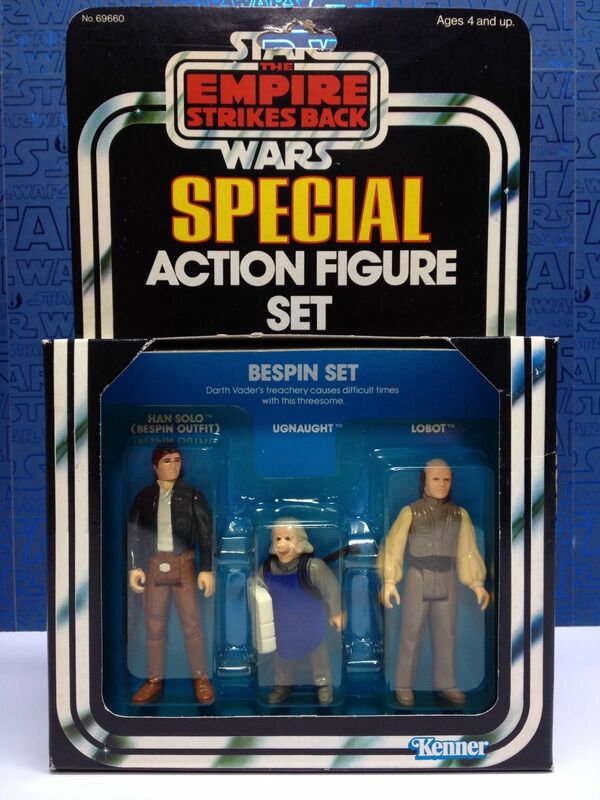 Here we have a quick sampling of some of the key items that were introduced for the ESB line. 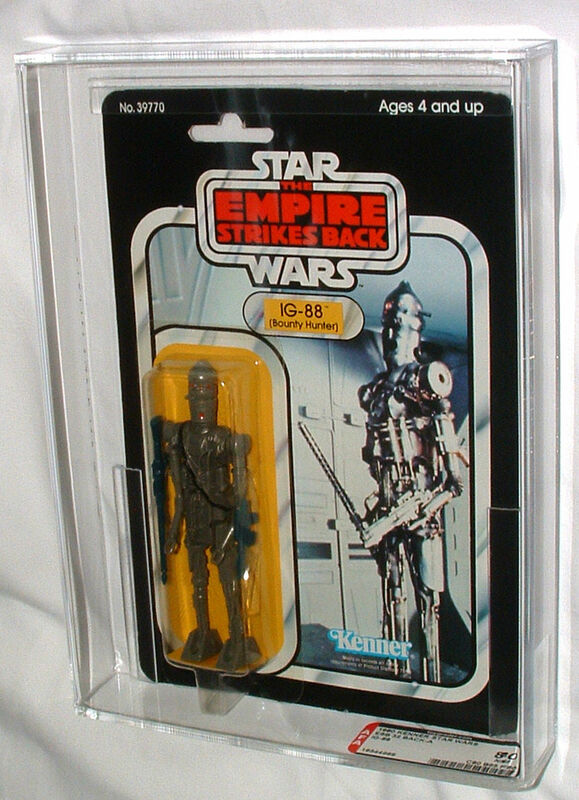 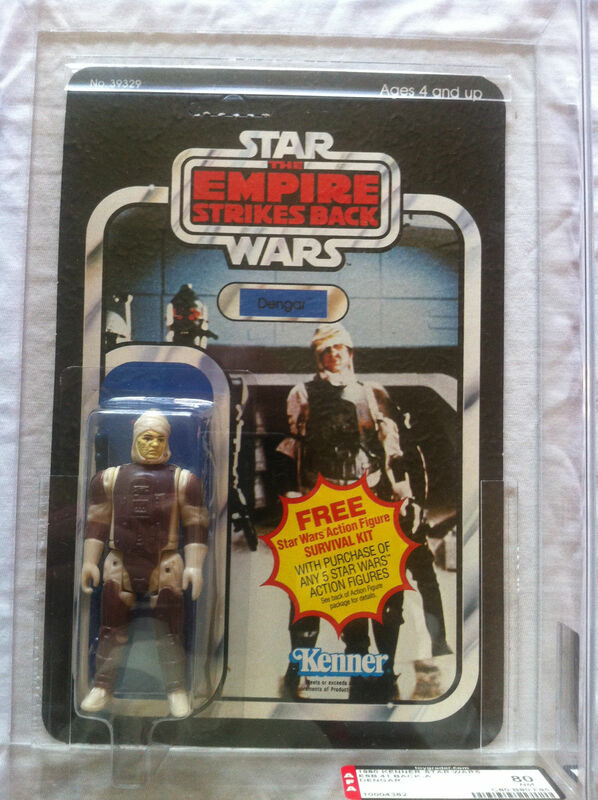 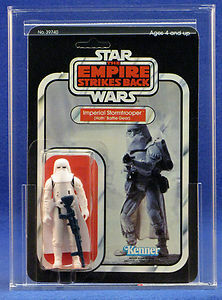 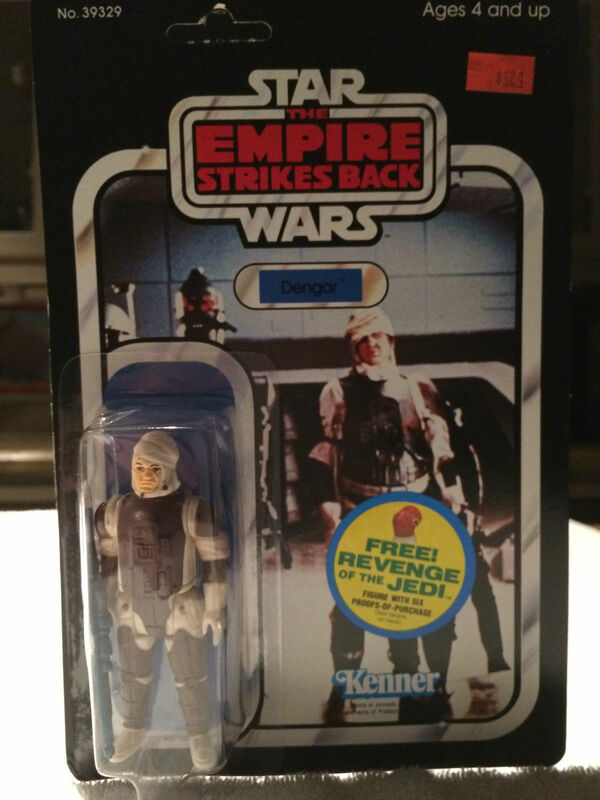 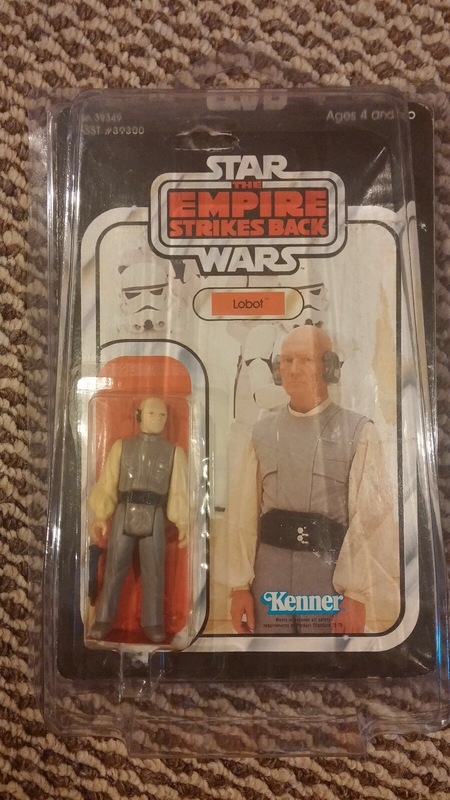 Although the line ended with the ESB release, it still remains a favorite of many collectors and is a great off-shoot for those collecting the main toyline. 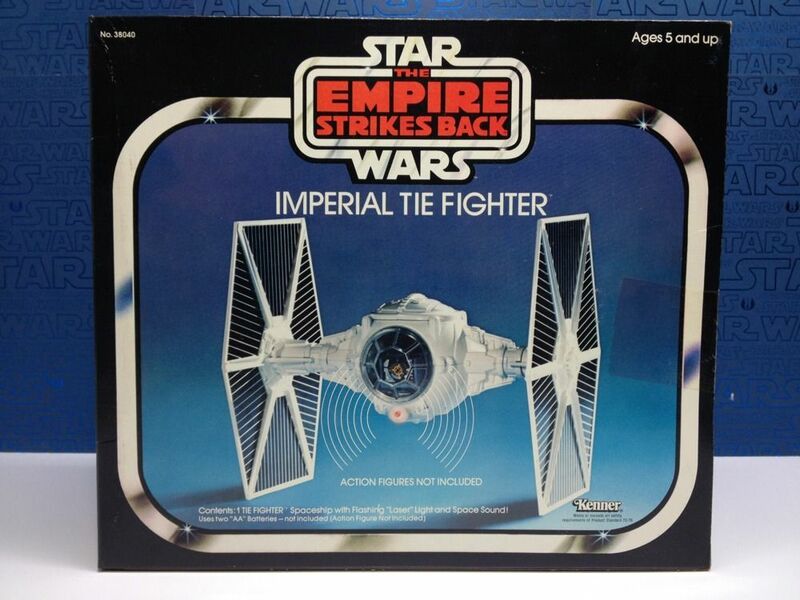 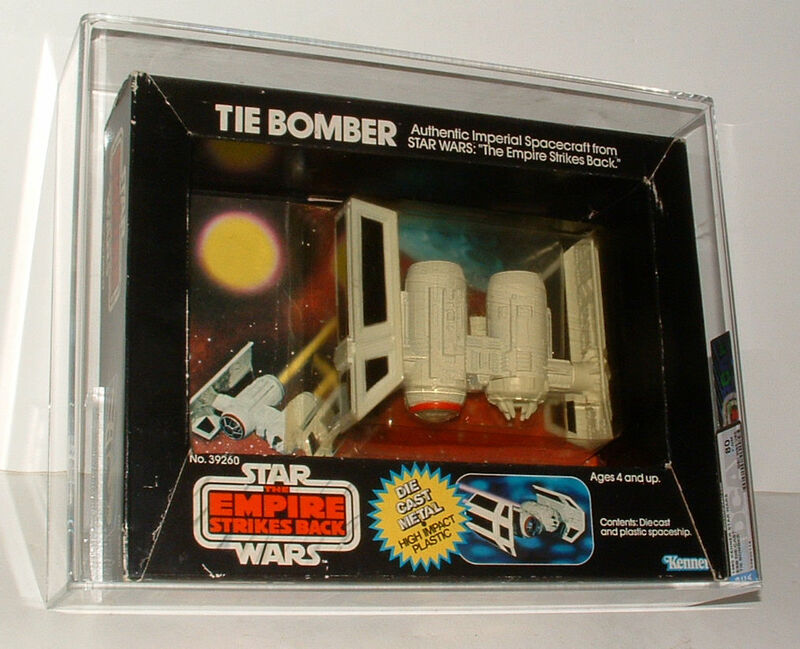 The highlight in our coverage this month is that of the highly sought after Tie Bomber, a vehicle that was limited to only the die cast line, and therefore it remains a key favorite of collectors. 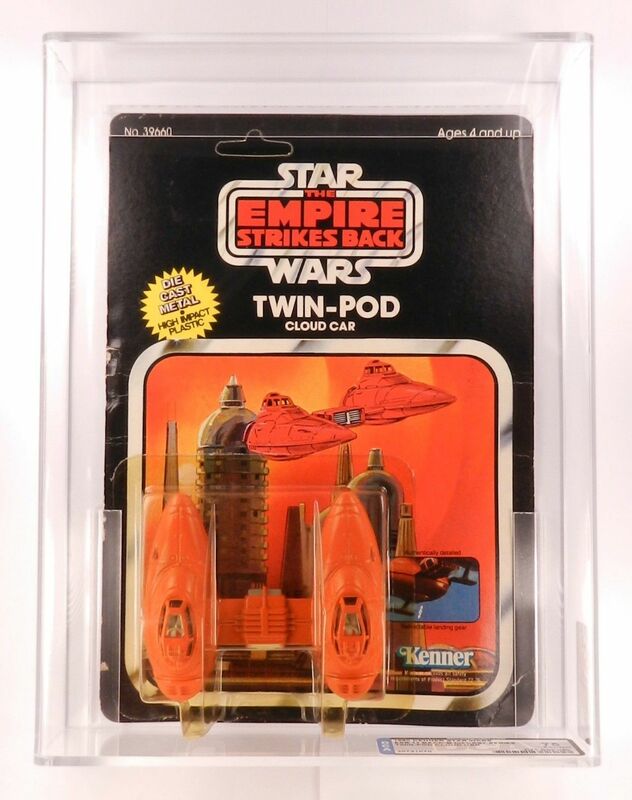 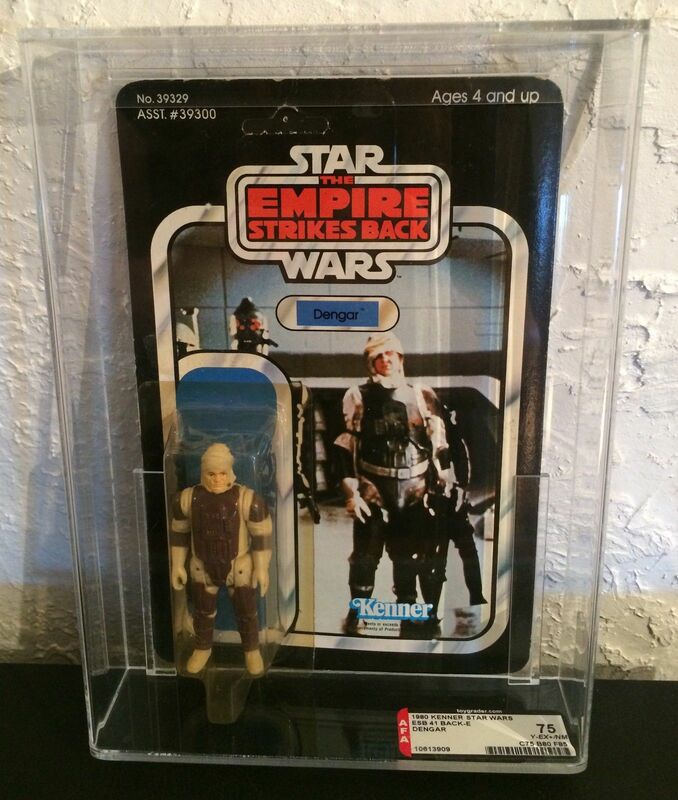 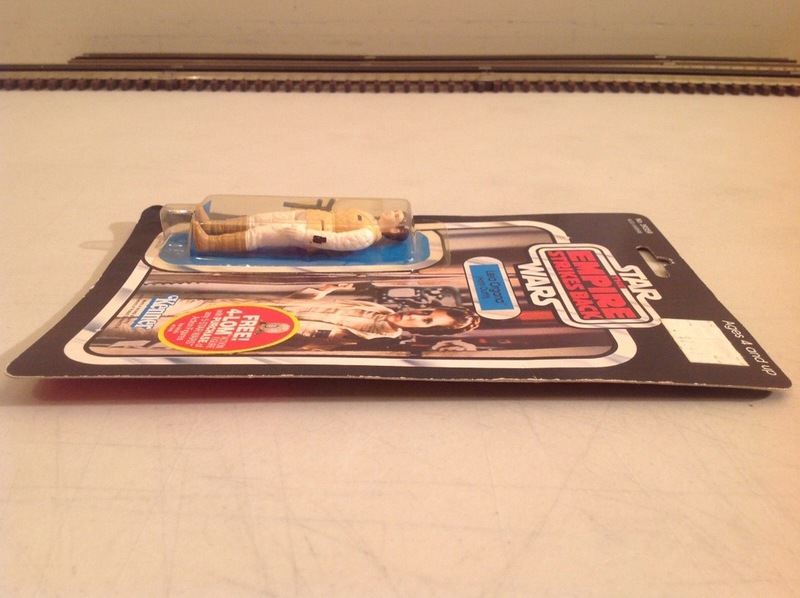 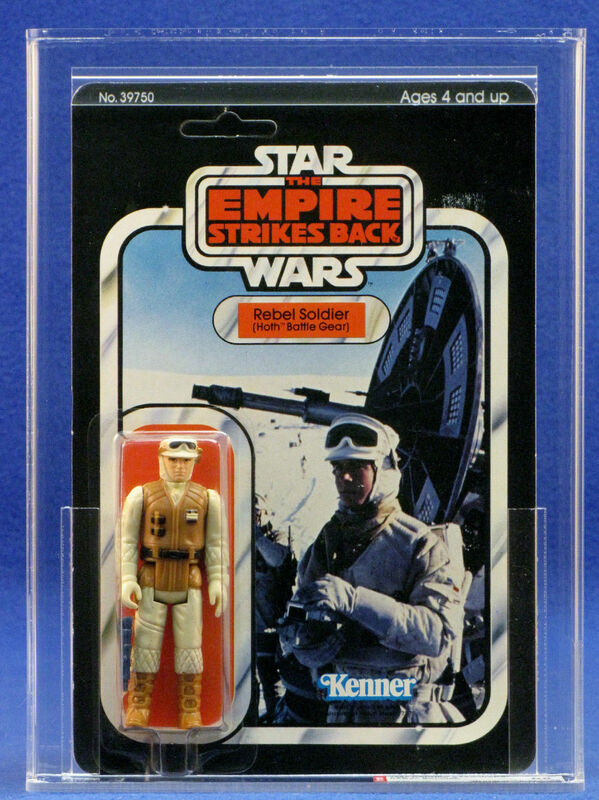 We have a great example listed below both in terms of condition and selling price, showing strong demand in the market, as much like the A-Wing and Tatooine Skiff this particular item bocks the traditional lines of where a collector may stray in their focuses. 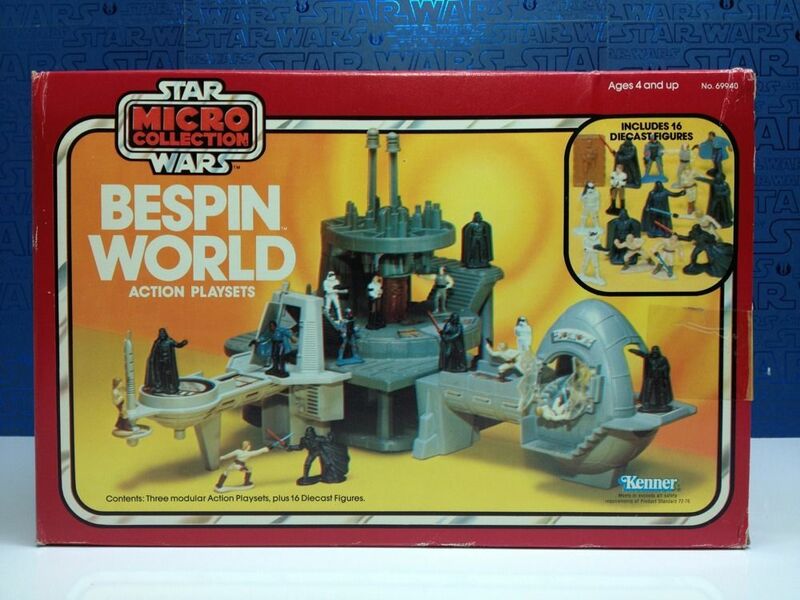 Along the same lines as the Die Cast series we find the Micro Series (The precursor to Micro Machines) was a novel, but ultimately unsuccessful branching out effort for Kenner. 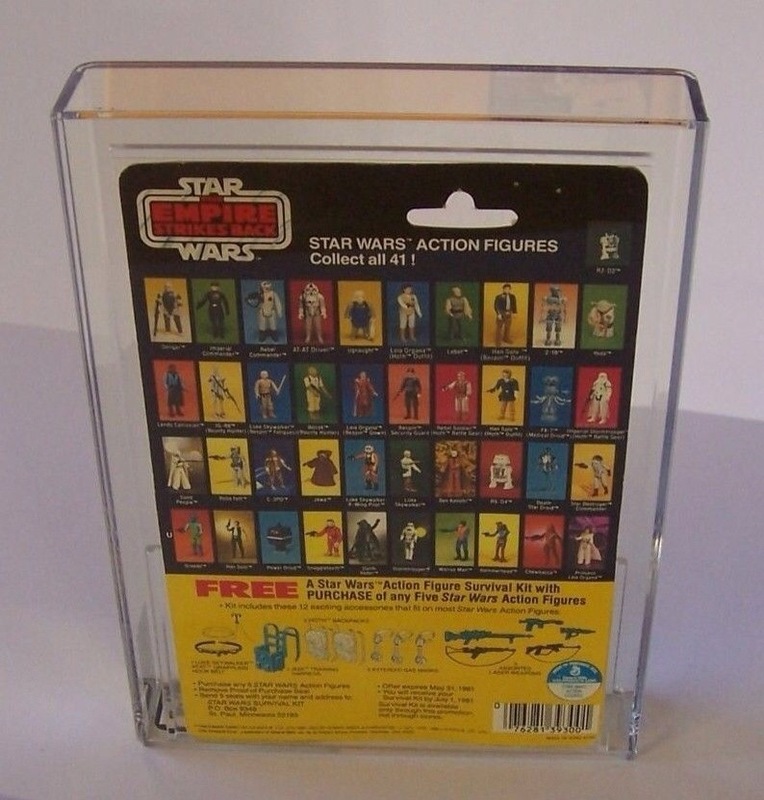 Looking to capture more market share by a new form factor these are the opposite of the way Kenner tried to augment the original Star Wars release with the large scale 12” figures. 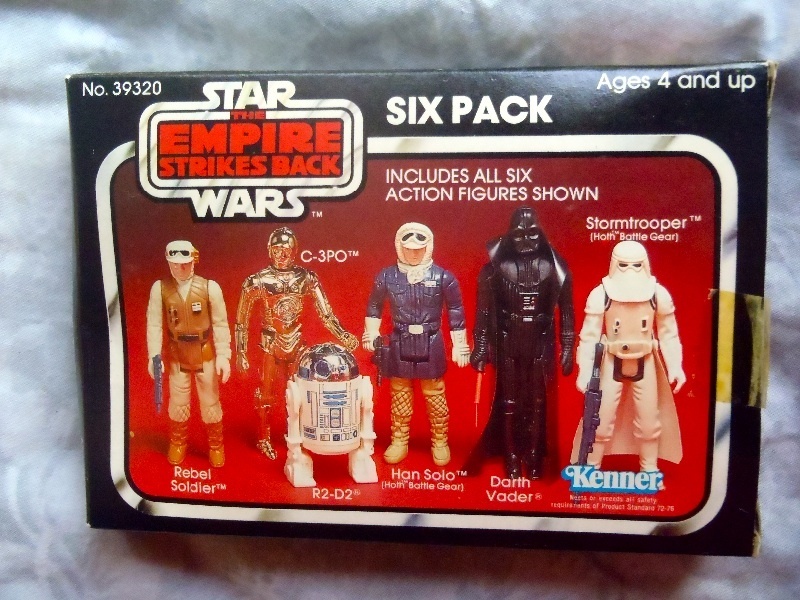 This allowed them to package together a more robust product offering as these sets included backdrops as well as the mini figures. 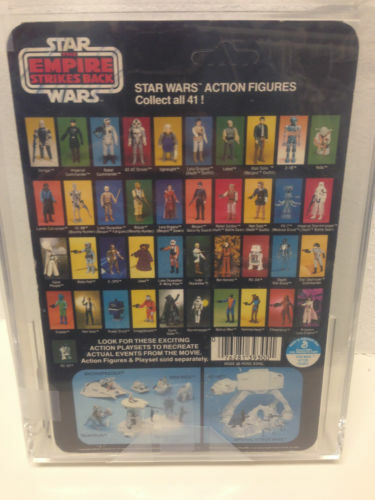 Much like the commercial failure of the line, these items aren’t the rarest birds to find sealed today, which prices for many of the smaller sealed sets very palatable at around $40-50 each today. 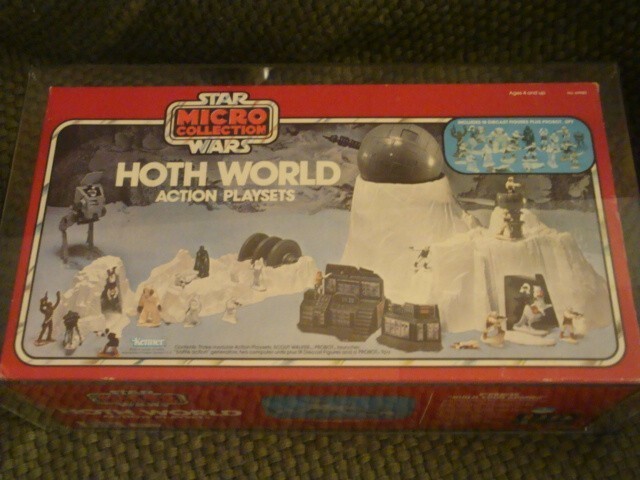 The larger sets including Hoth and Bespin world see a bit of a premium in comparison to the smaller sets but are still very affordable in comparison with items that had similar price points at the time. 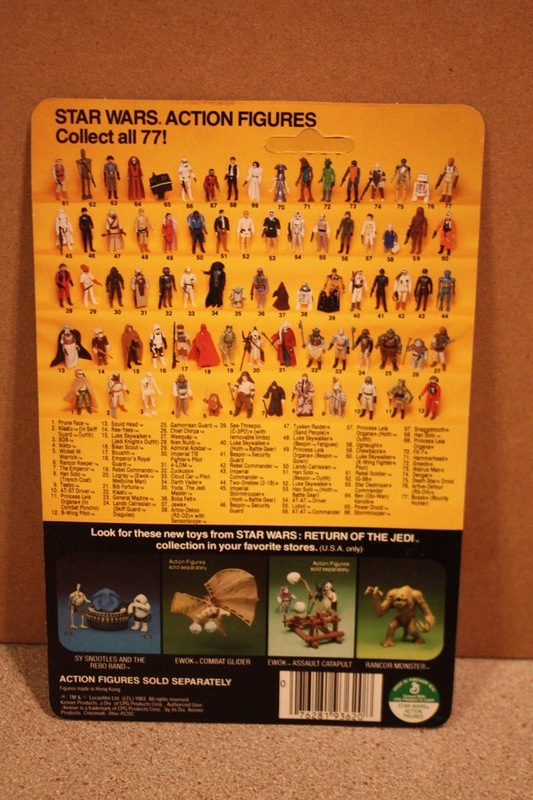 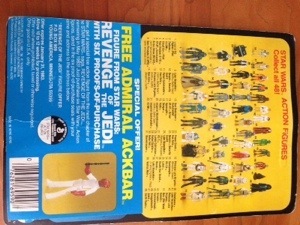 When it comes to figure sets and mailers the ESB release had no shortage of items to choose from. 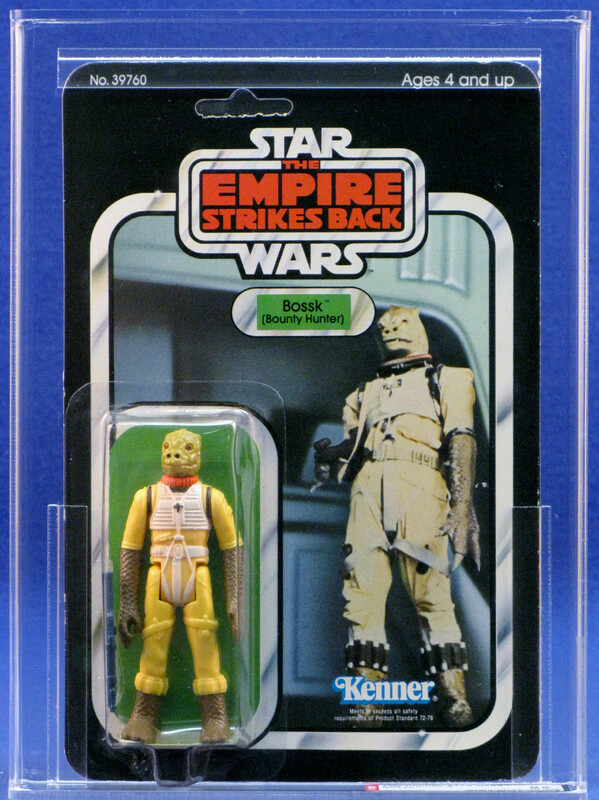 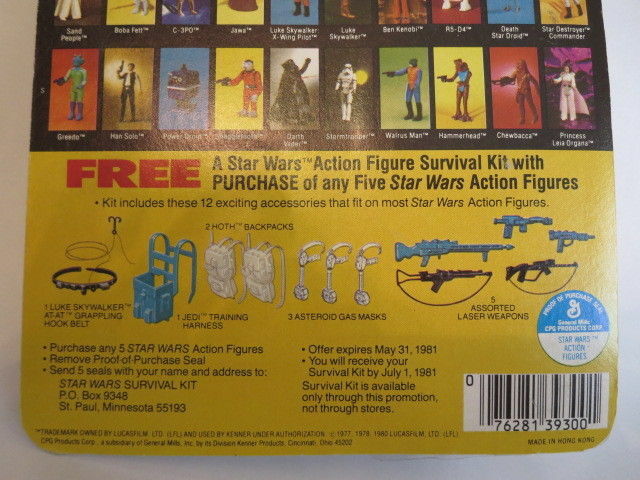 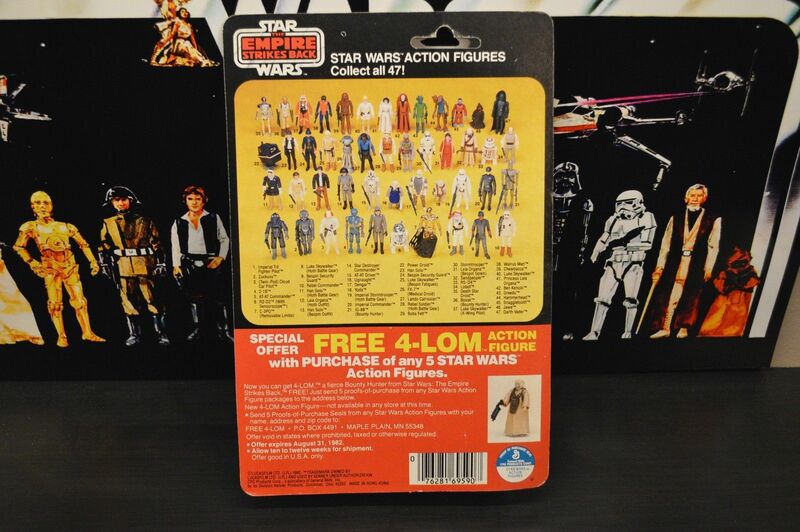 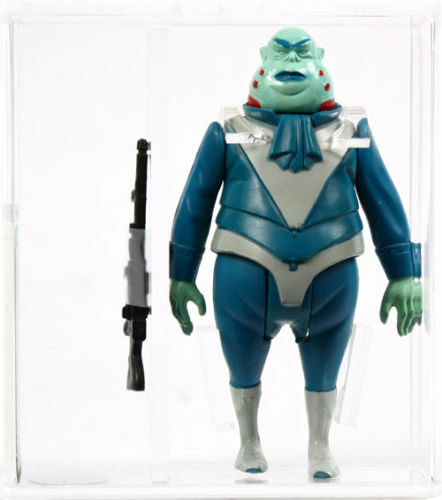 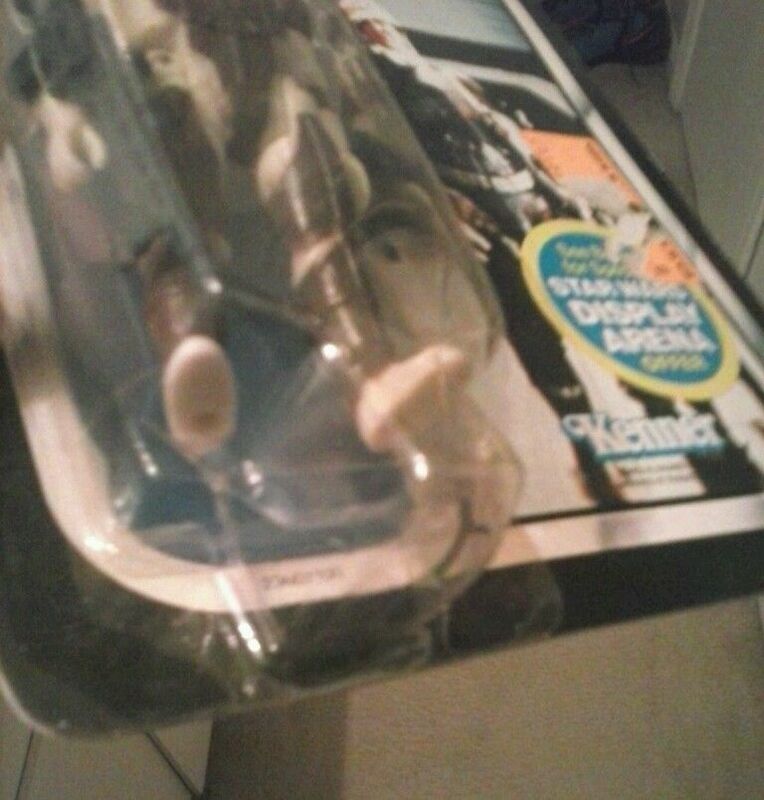 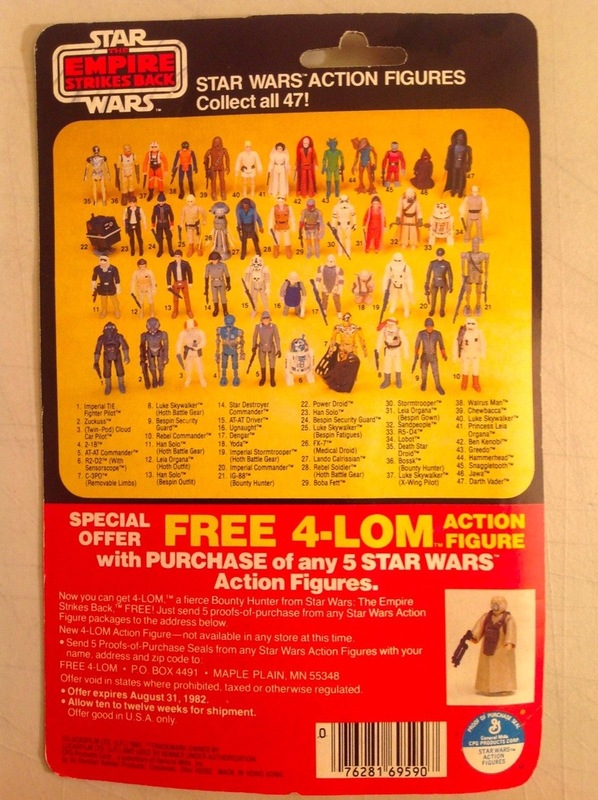 We saw the secret figure offer (Bossk) and 4-Lom released as single figure mailers, the continuation of the 3-pack line, over 15 Catalog mailer sets and of course the two 6-Pack figure releases. 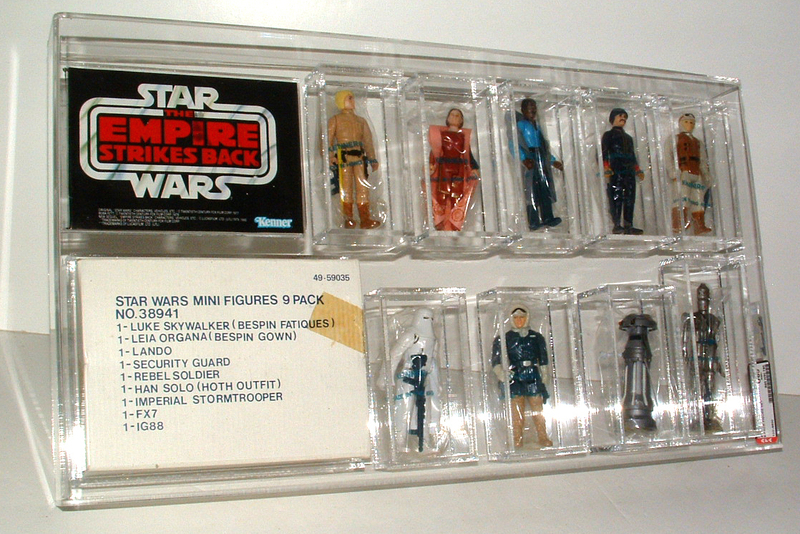 One of my personal favorite parts of the ESB line the mailers included some huge packs of up to 15 figures with a wide array of the traditional and popular 3 packs. 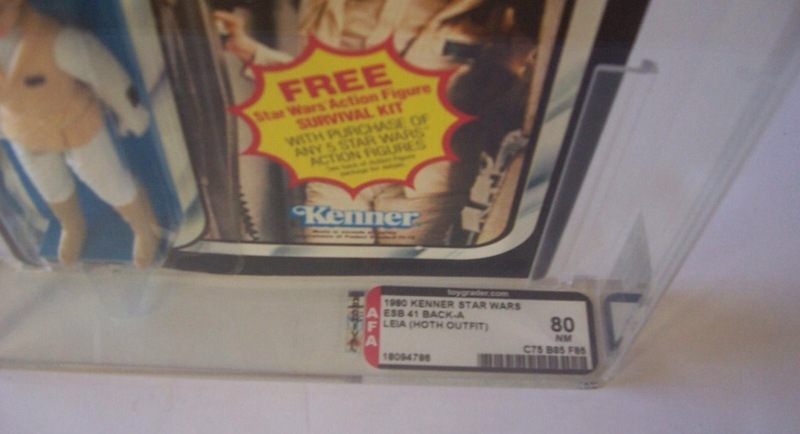 Unortunately we didn’t see a 15 pack – lineart or anything out in left field come along as of late, but we did manage to find a side by side example of a graded and ungraded version of this ESB 9 Pack Mailer. 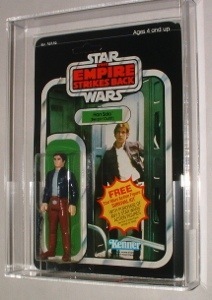 In the weeks leading up to December we had two 3-Packs from the ESB line appear on the open market. 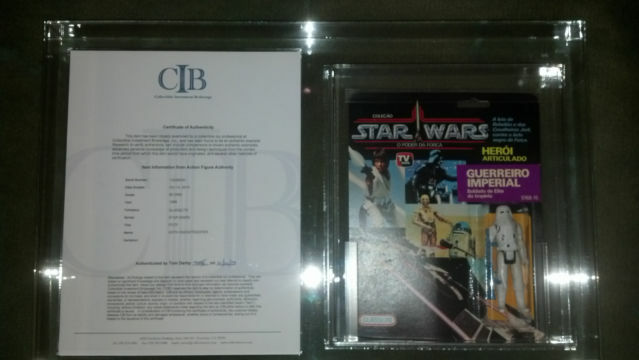 Below are the summaries of both examples. 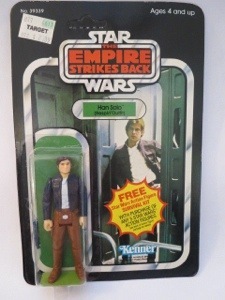 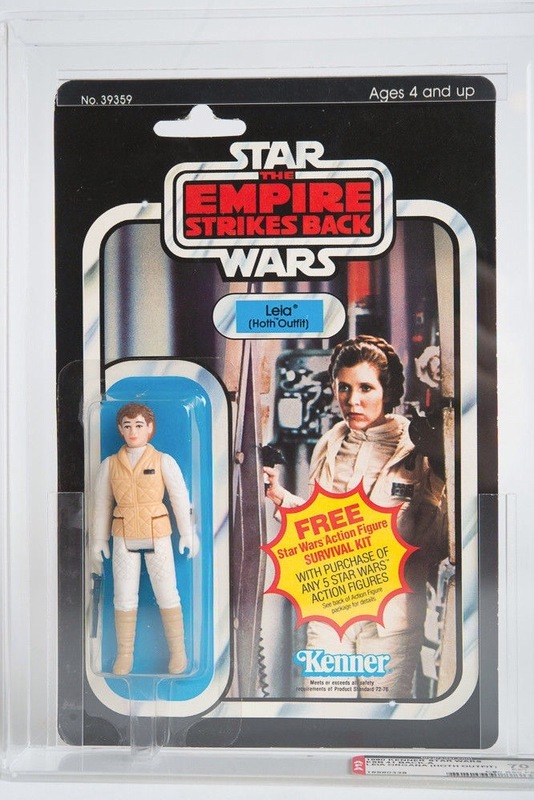 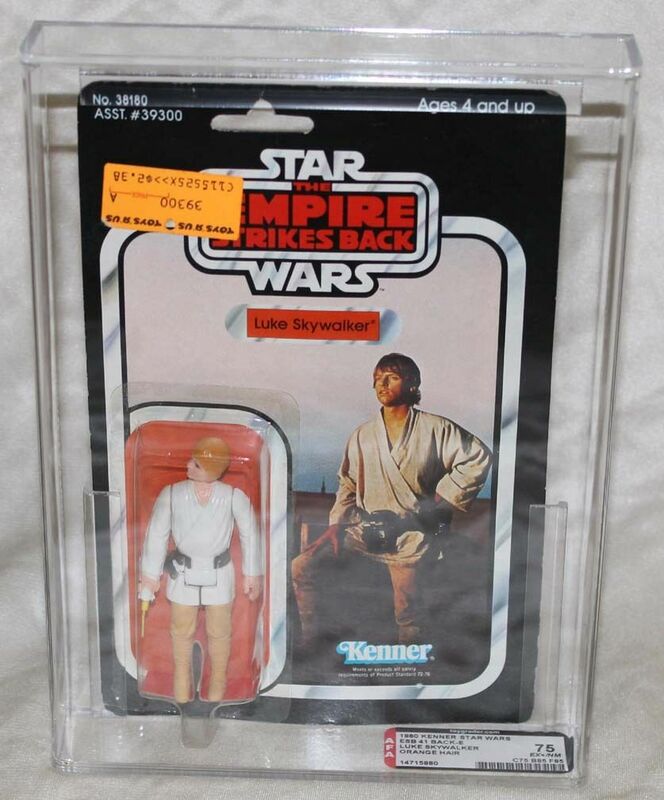 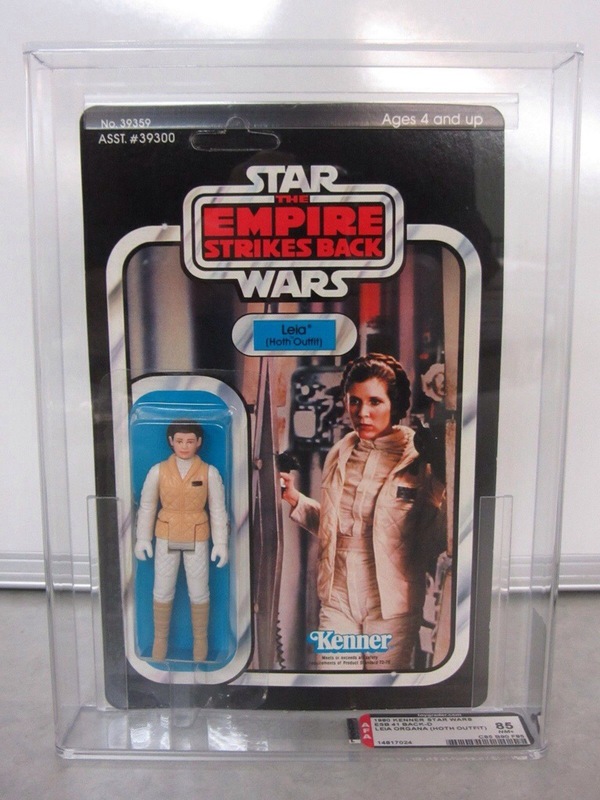 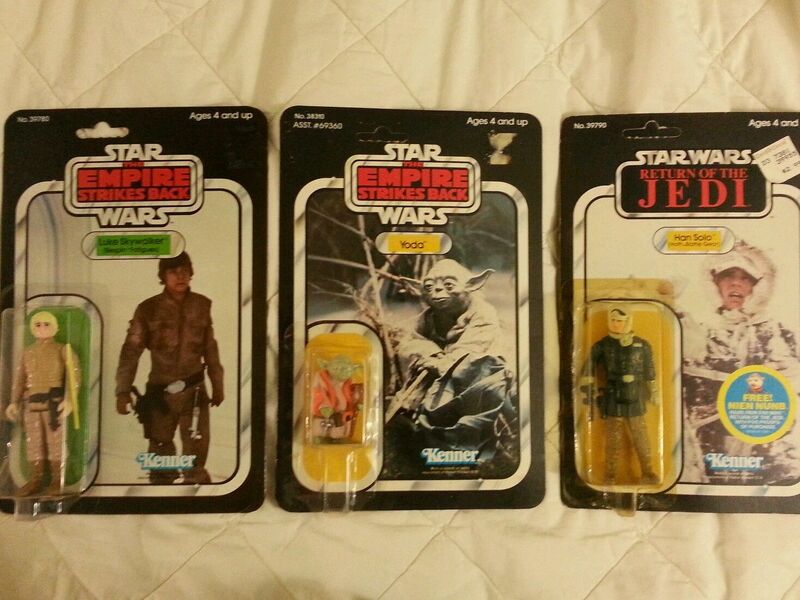 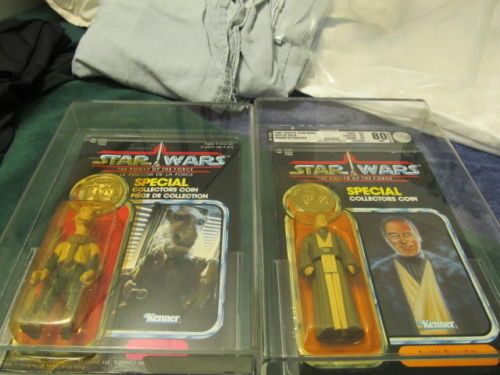 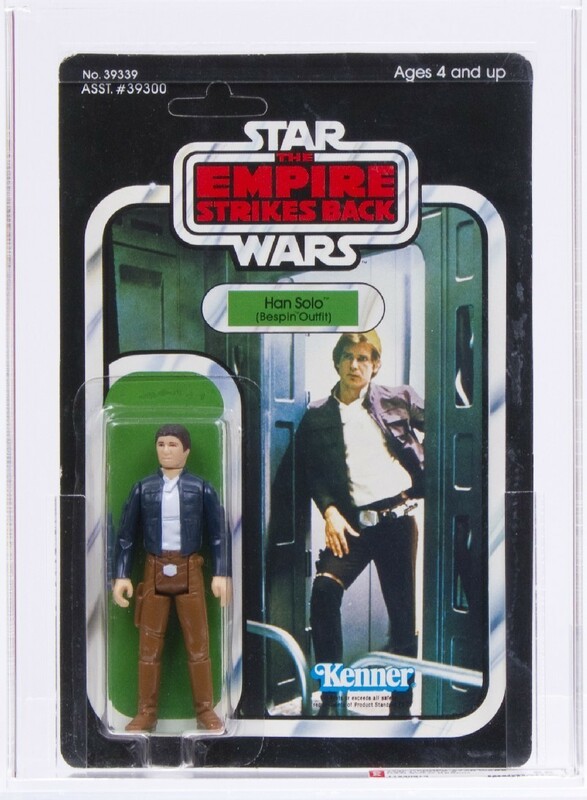 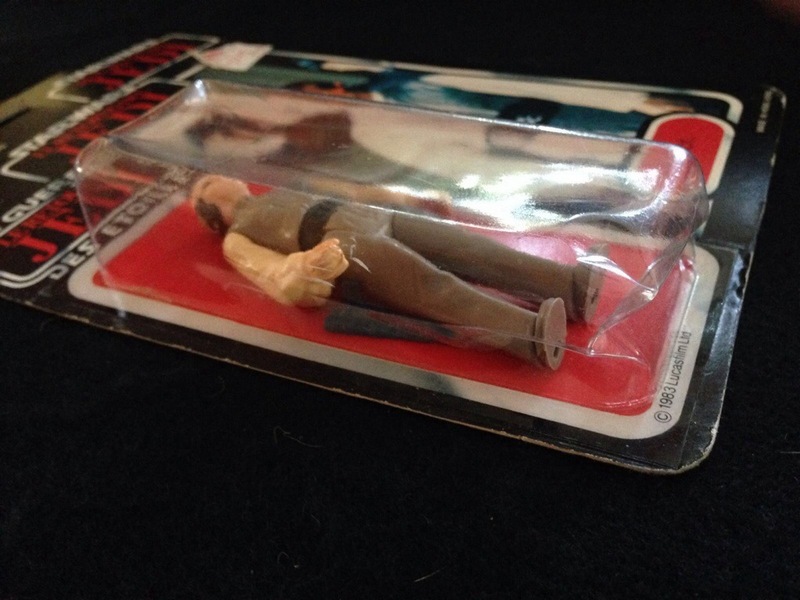 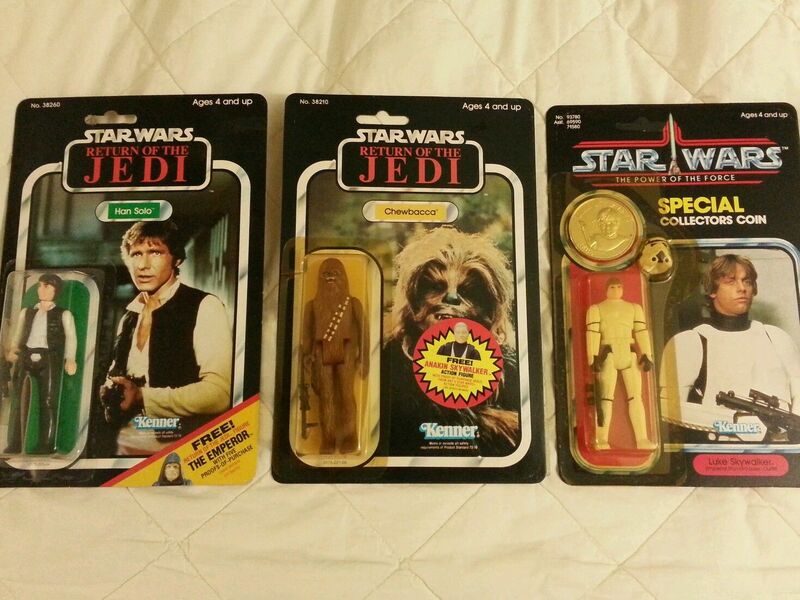 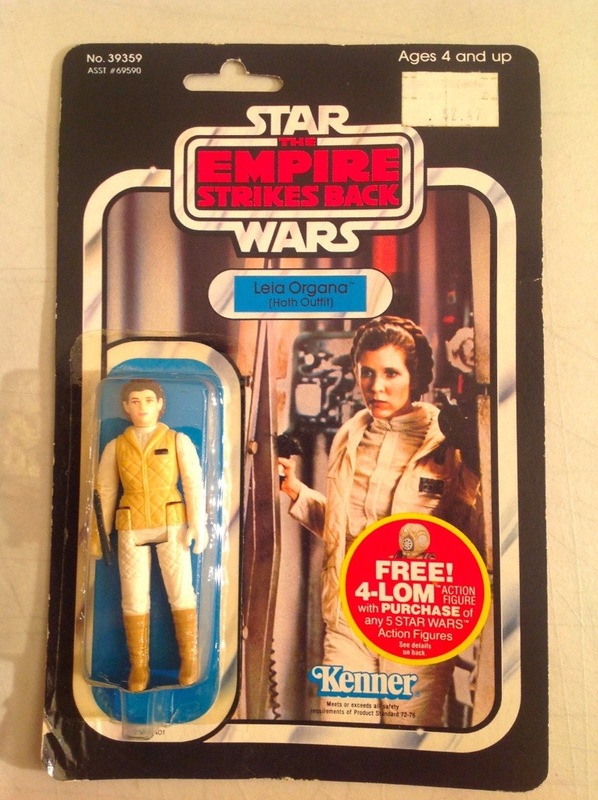 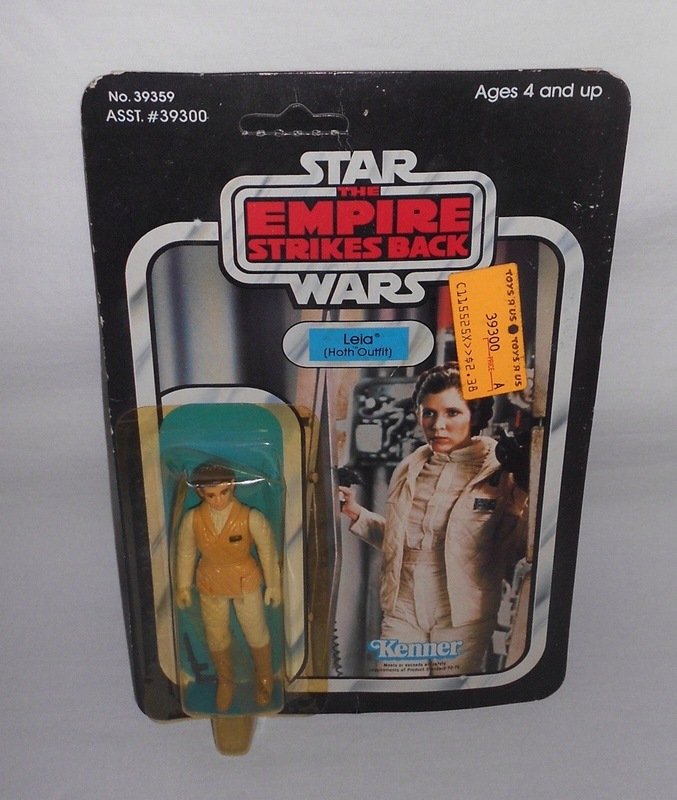 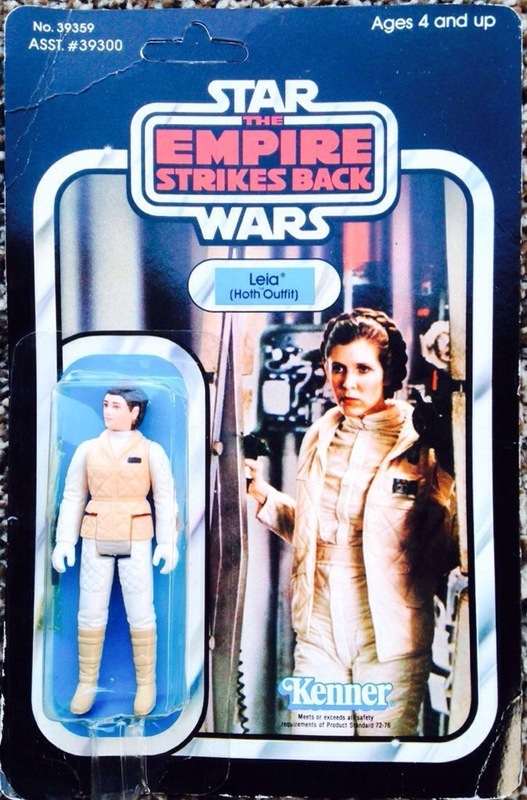 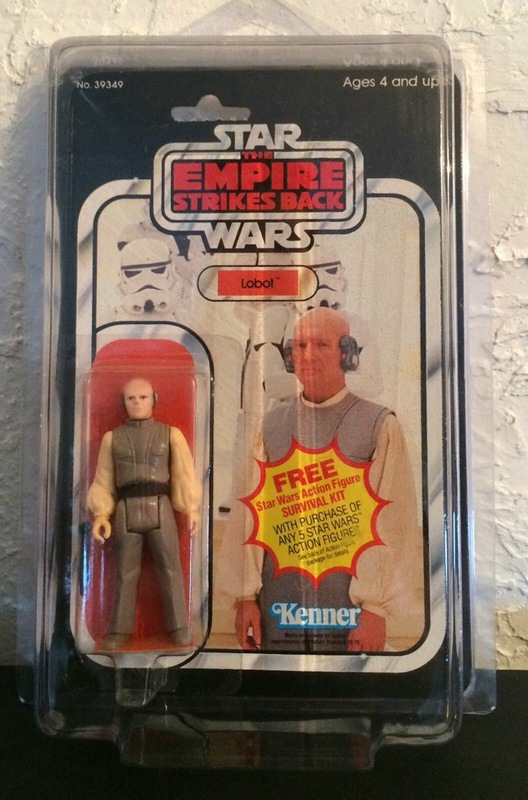 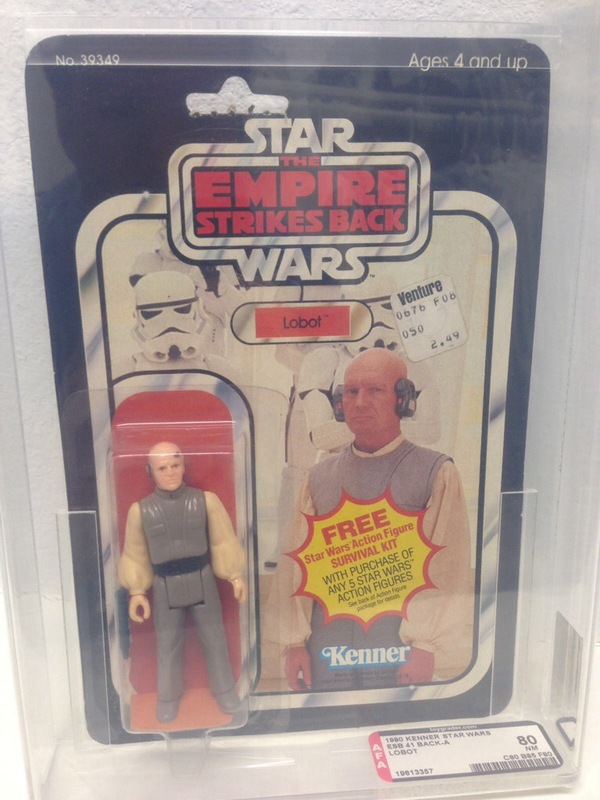 The ESB line of 3 Packs is much like the relationship with the two ESB 12″ Figures that were released, in that they both were short in supply, and thus are the rarest/most expensive of their kind. 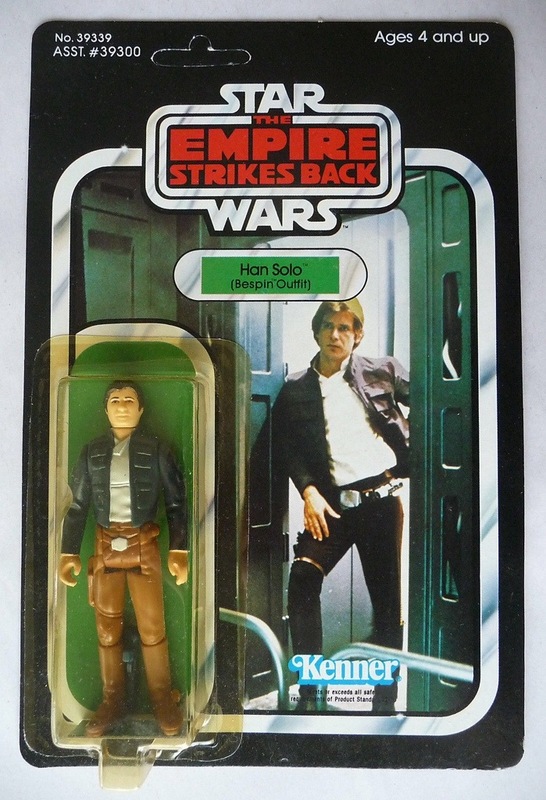 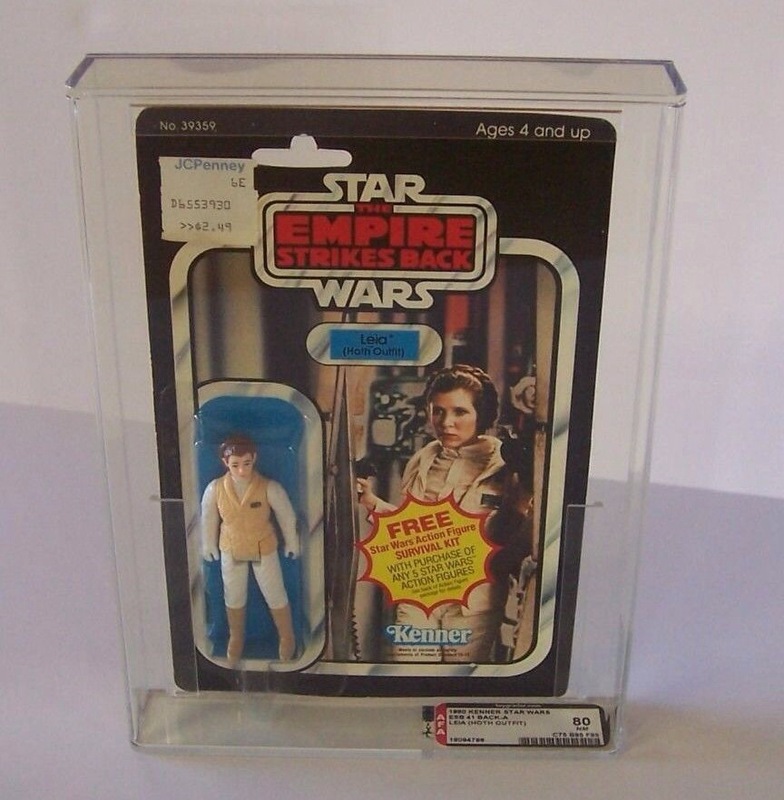 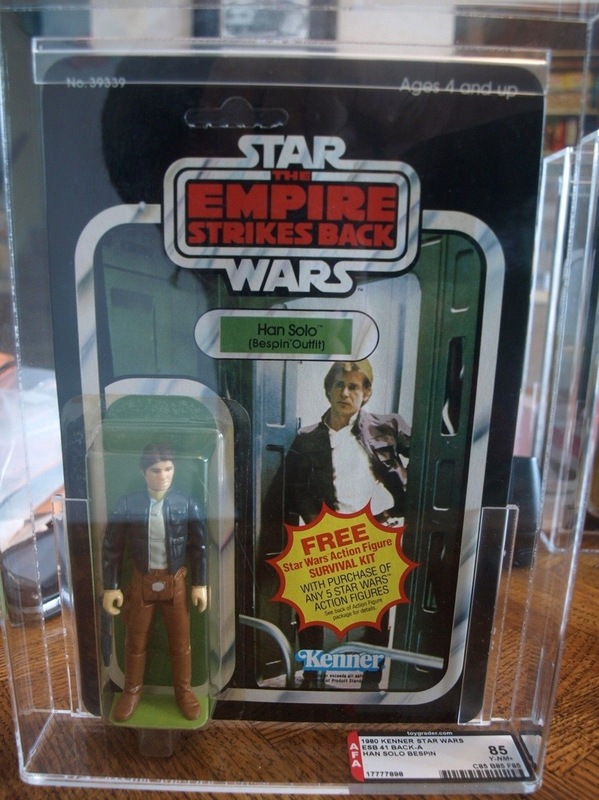 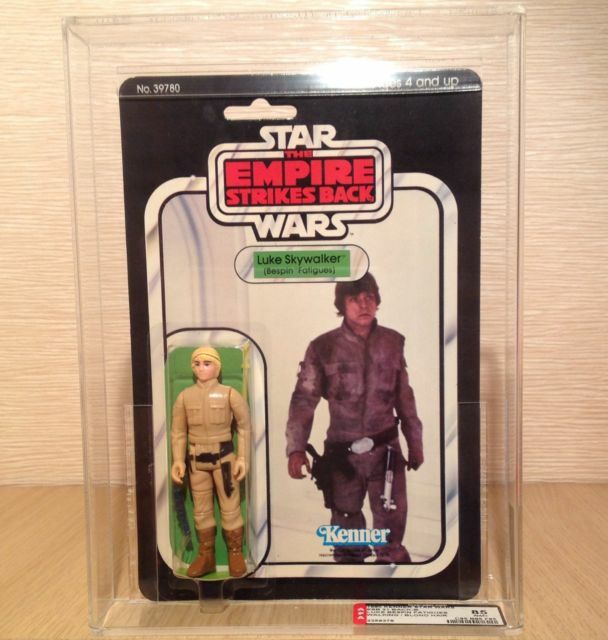 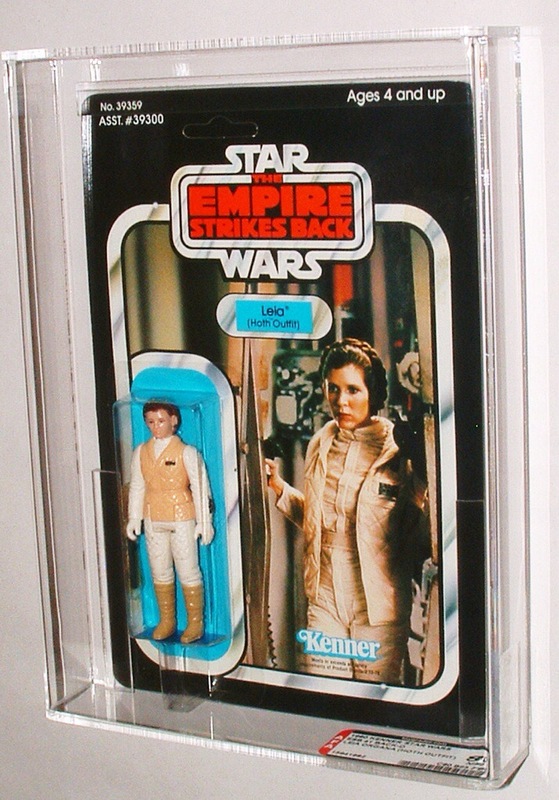 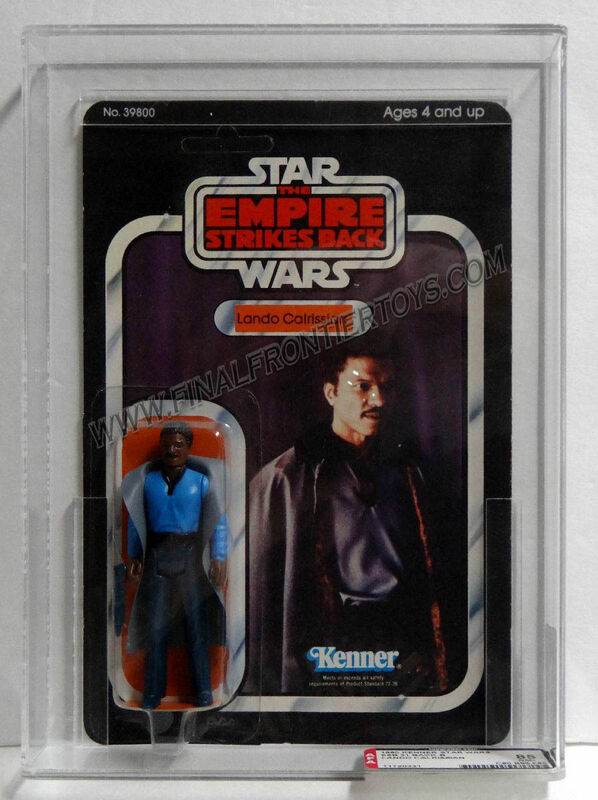 The ESB line also did a few things color wise and from a figure combination perspective that were real drivers of it’s overall popularity with the collecting community. 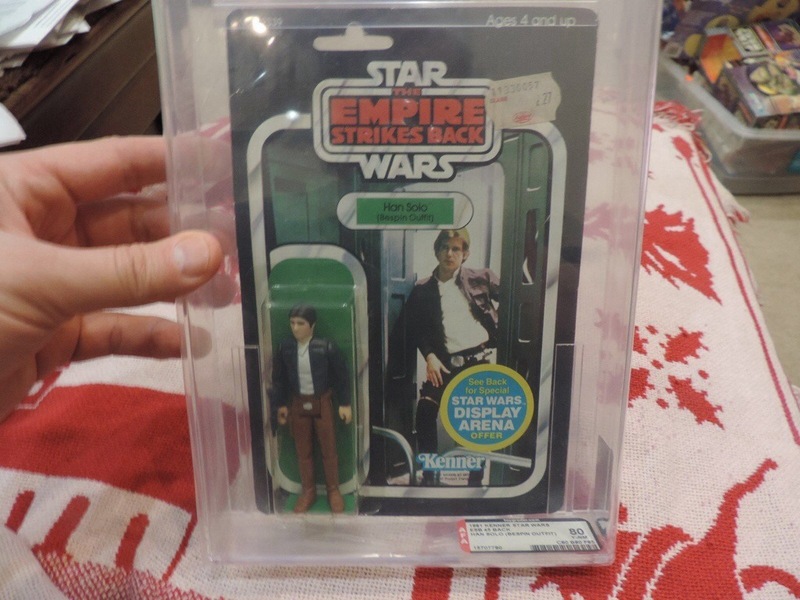 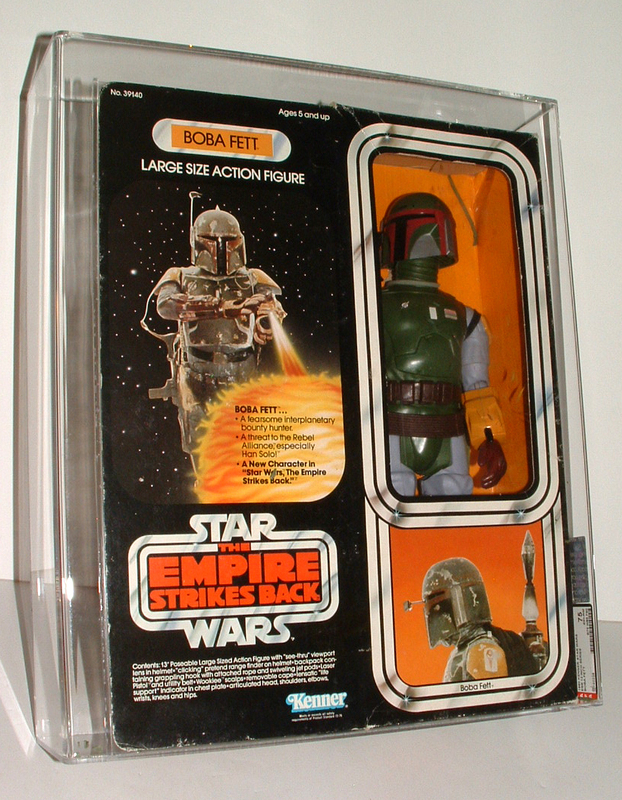 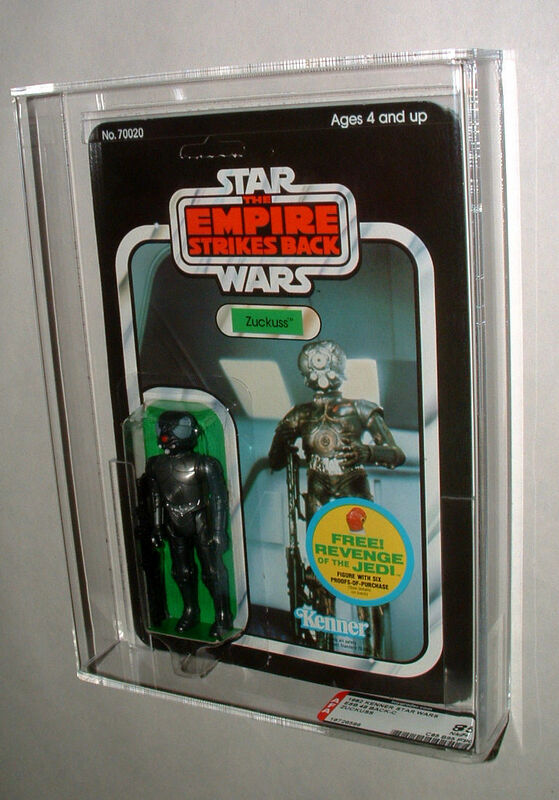 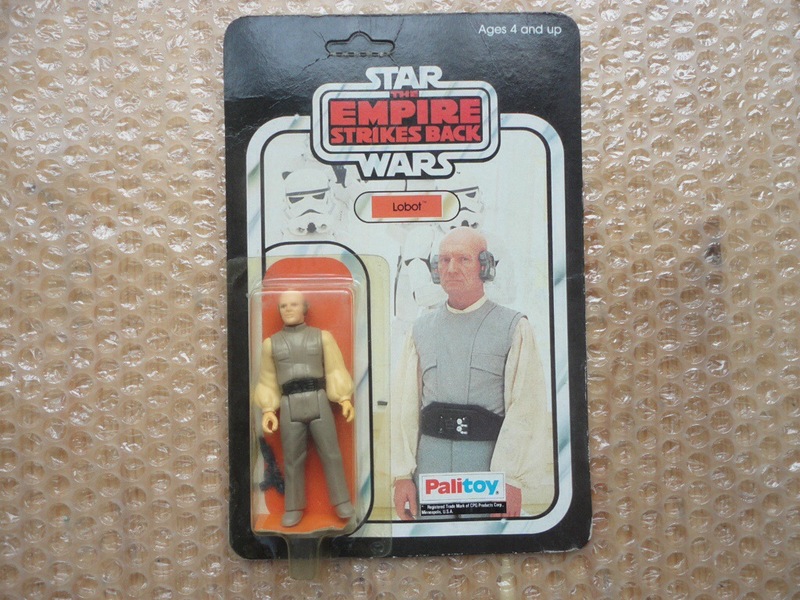 With only two figures released in ESB packaging the 12” line wasn’t as robust as the prior movie and was quick lived in terms of shelf life. 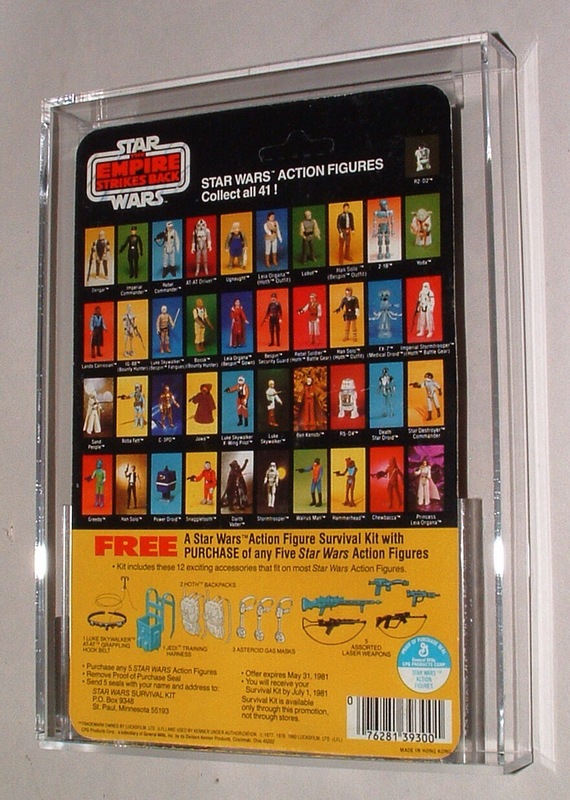 Still the two released figures are two of the most desired pieces in the 12 inch line in total. 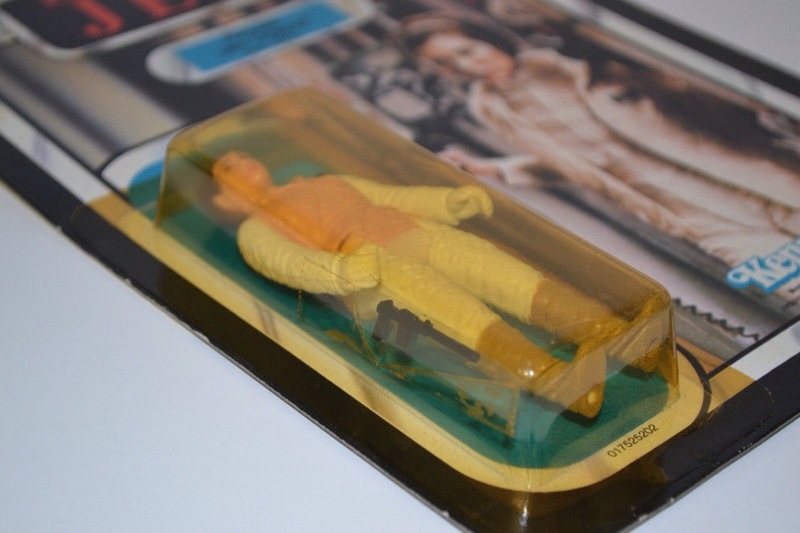 In addition to these being popular released items, the mock ups, prototypes and proofs for the lines continued figures are simply some of the best pieces when it comes to pre-production items from the Vintage line. 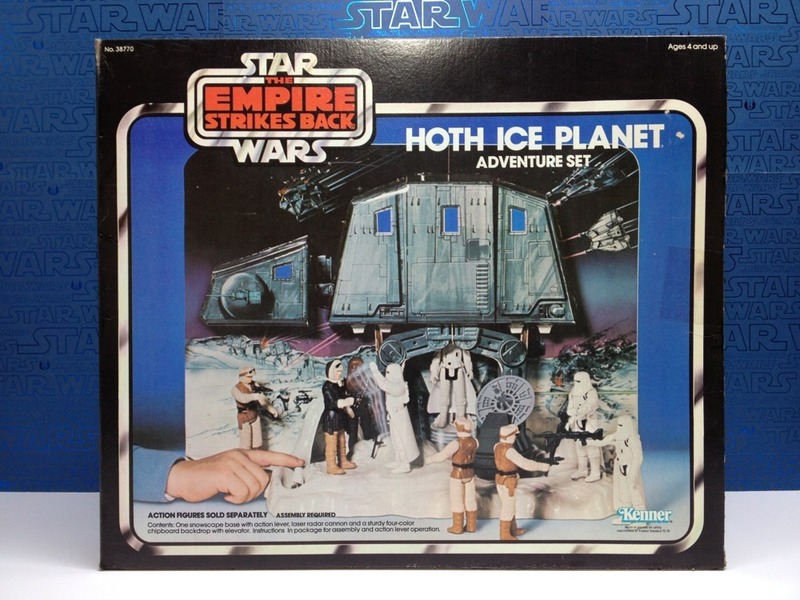 Rounding out the ESB release are the vehicles, playsets, cases and 1 puppet that helped re-make those scenes on Hoth, Dagobah and Bespin. 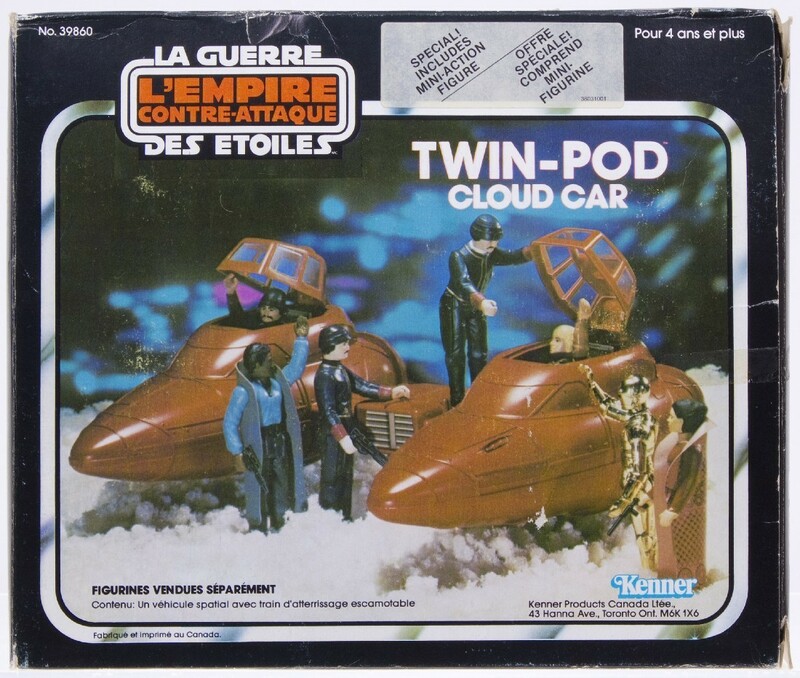 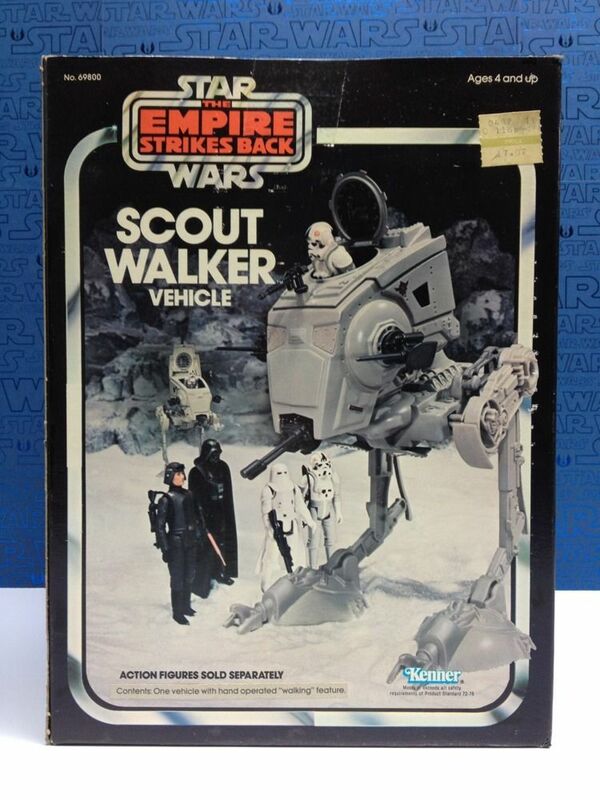 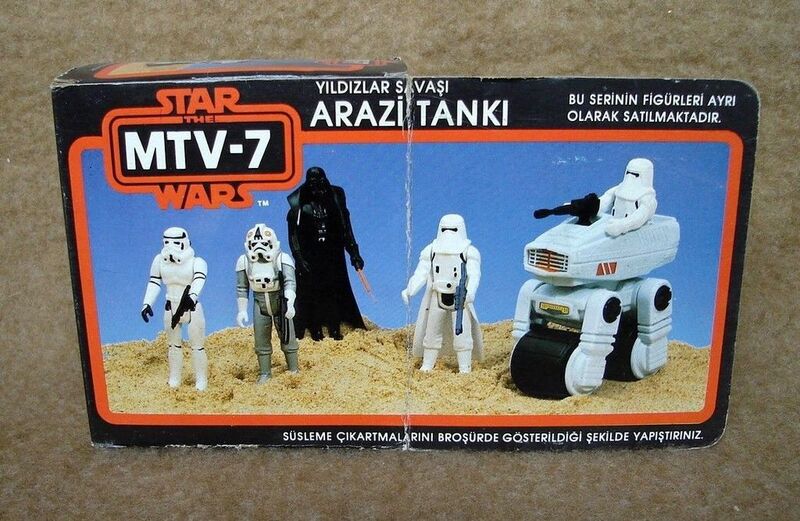 The vehicles from this line are some of the most unique in any toyline ever released, from the giant AT-AT, to Slave 1 and the Cloud Car the toys were as unique and original as anything in the Star Wars universe. 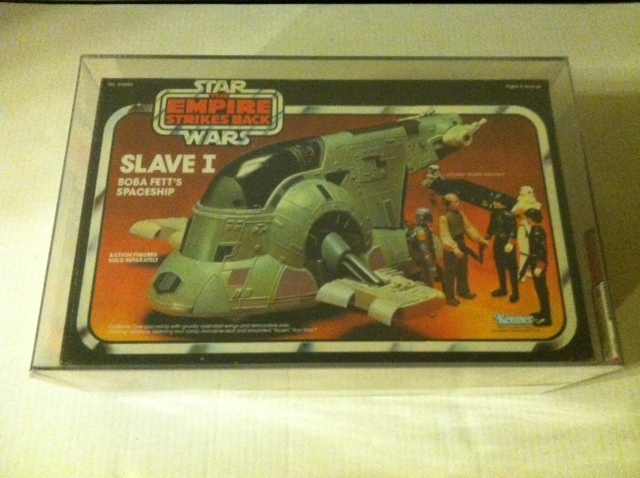 Although we weren’t able to find a sealed AT-AT to review we did track down the remainder of vehicles released in the series, including two examples of Slave 1 that show just how much price can vary auction to auction, even if the items are identical in almost every way. 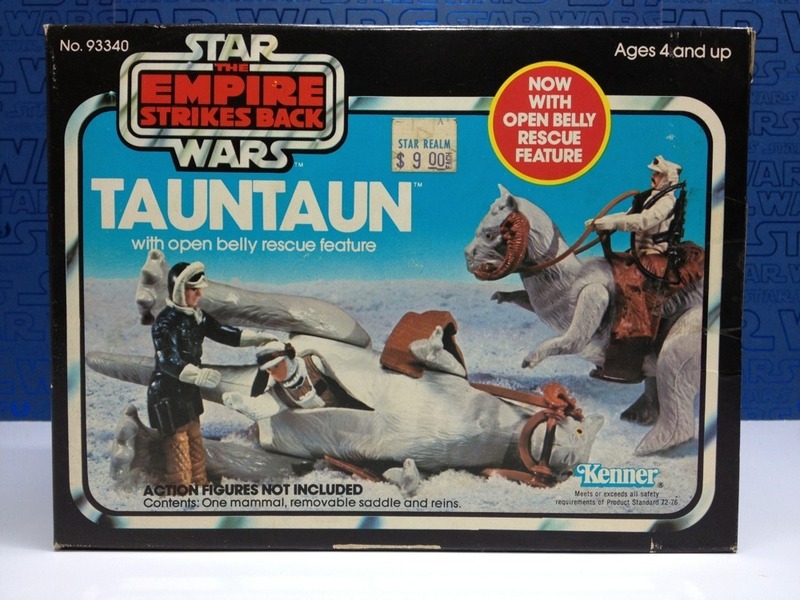 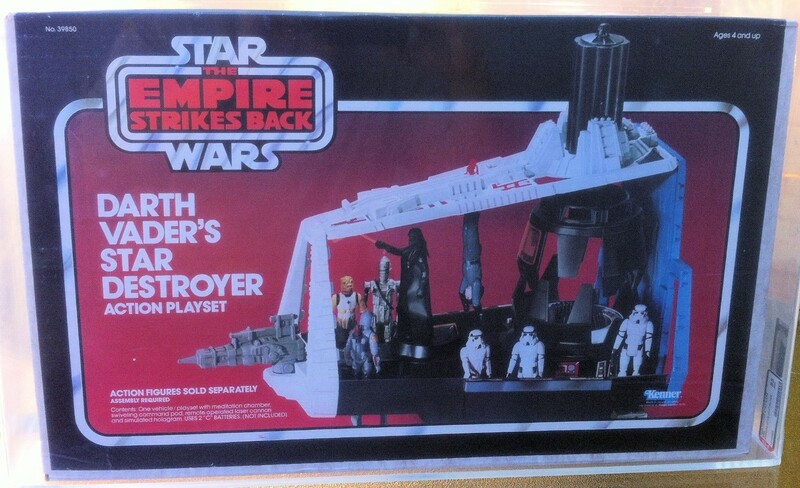 The playsets for the ESB line were unique in their own way as well, the generic white plastic of the Hoth Turret and Attack base sets is simply one of the coolest simple concepts ever made in toys. 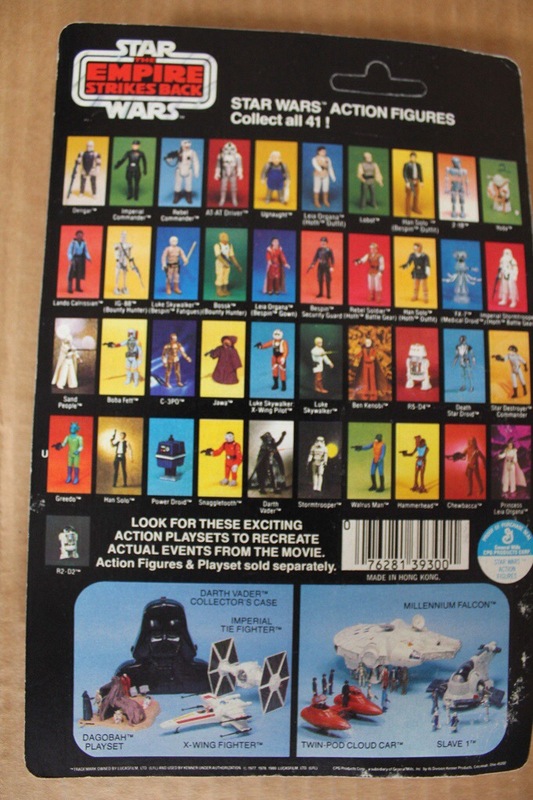 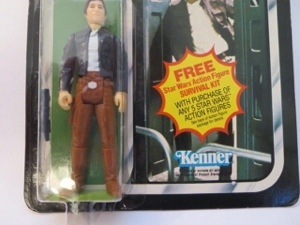 Neither are rare and neither are really well adapted from the movies, but anyone who had these as a kid is usually quick to callout how much they were used to recreate scenes from the movies. 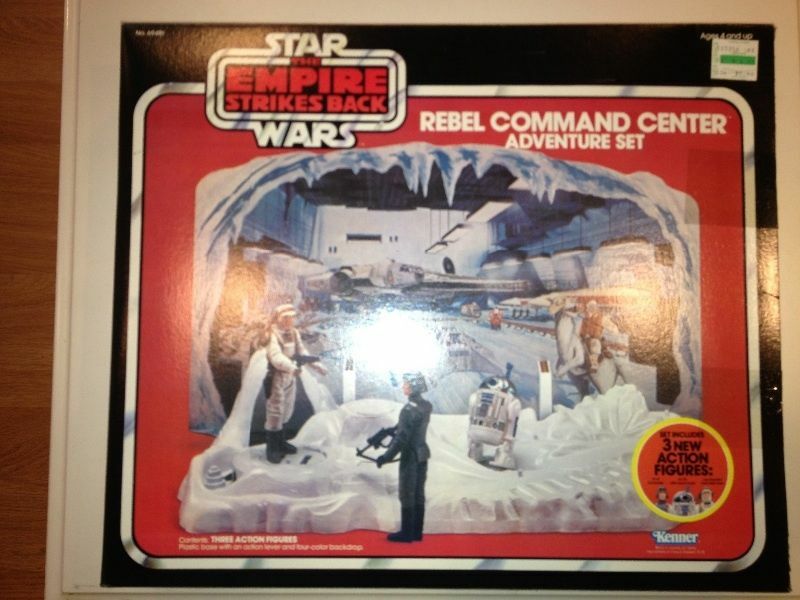 Additionally in this series we saw the release of three cardboard backed scenes in the Rebel Command Center, Cloud City (Sears Exclusive), and the Hoth Ice Planet playset, all takes in some way on the original Land of Jawas concept. 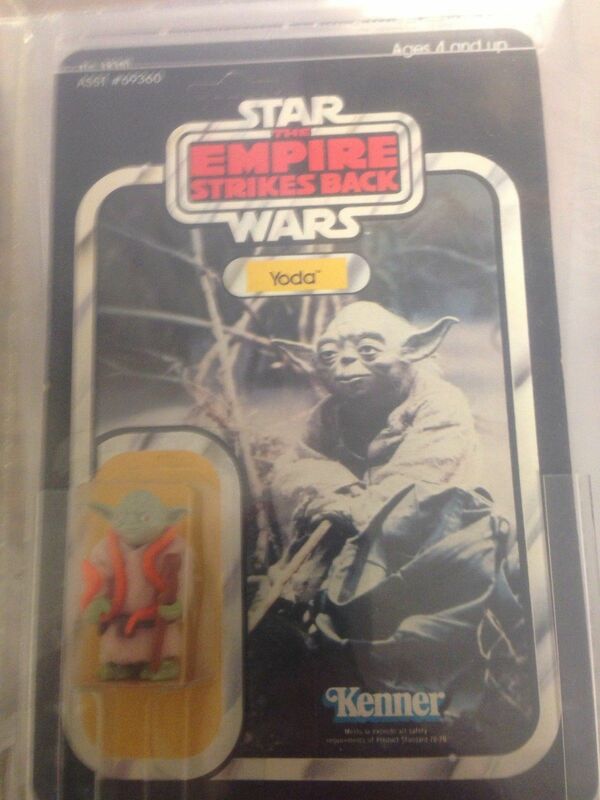 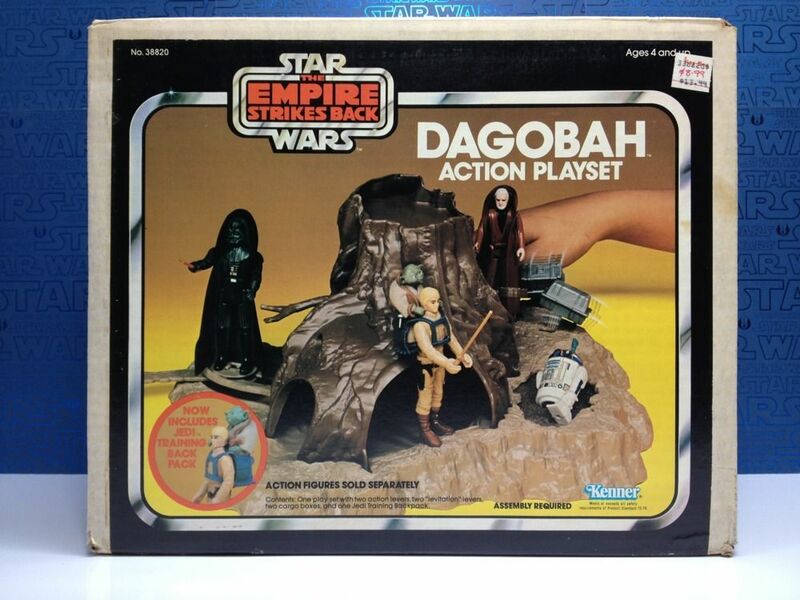 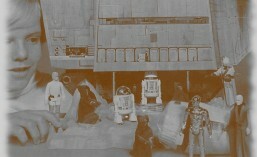 With a full representation of Yoda’s Hovel, via the Dagobah playset all the worlds of Empire Strikes Back were released as a backdrop for the action figures themselves. 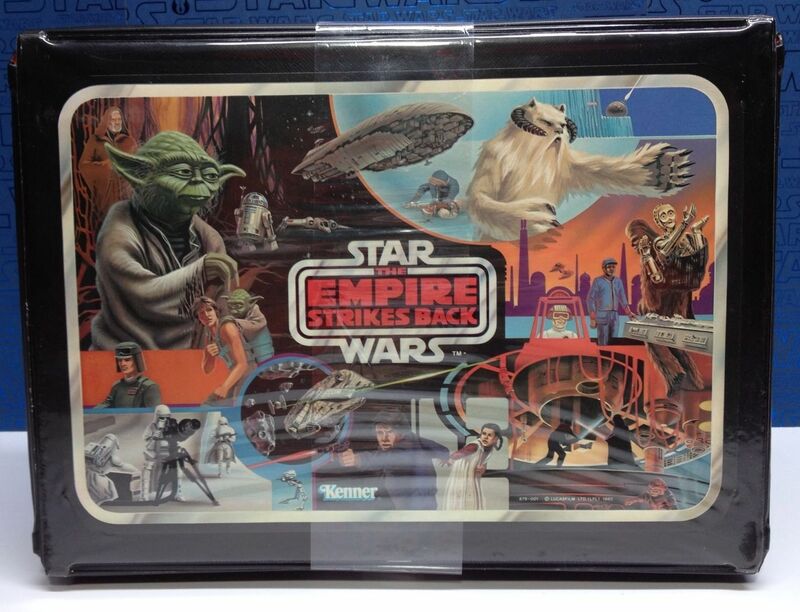 In addition to the playsets and vehicles the ESB release saw the release of a few vinyl carrying cases both with unique and captivating artwork. 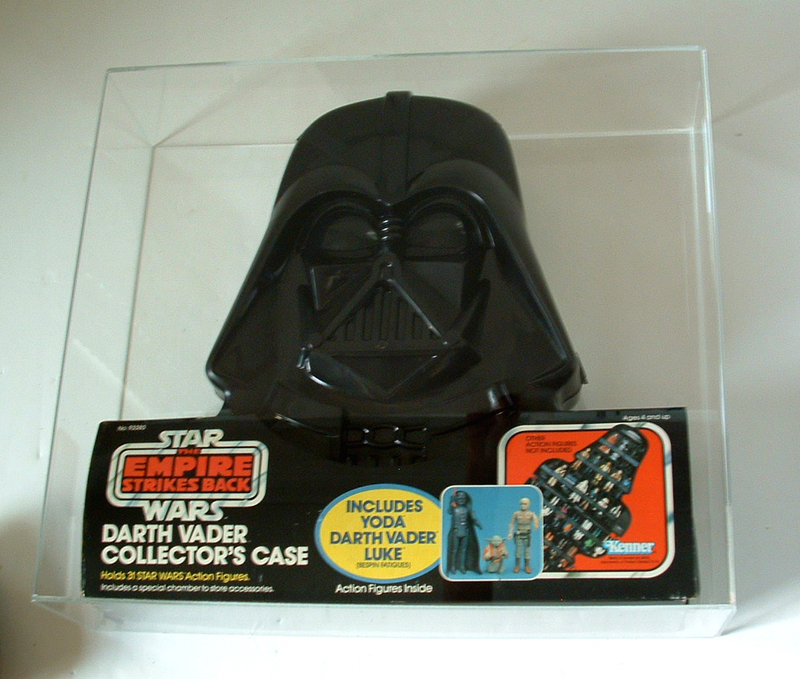 But the most iconic case from the line has to be the release of the Darth Vader carrying case which is one of the most iconic symbols of the vintage toyline as a whole, released with three variations we have two represented below for your review. 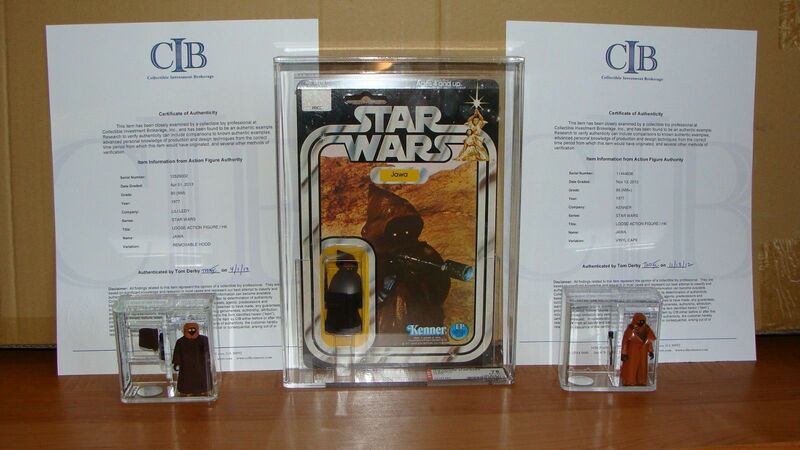 Tough to classify but ultimately key items to discuss we have a few truly rare pieces to round out this month’s review. 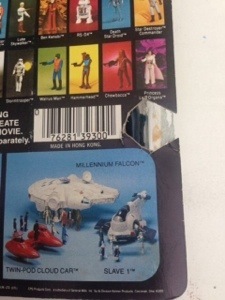 So rare and so unique that we had to pull them out of the rest of the update and give these 3 items a focused section. 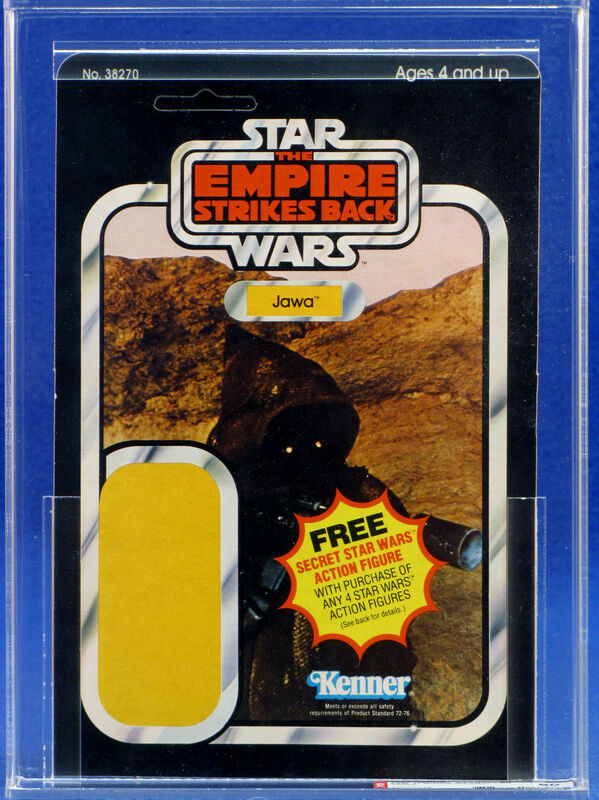 I think this and any ESB proof cards are unique and cool in their own way, there’s an interesting mix of cardback pre-production items available from the series, but with sporadic patterns of demand and price. 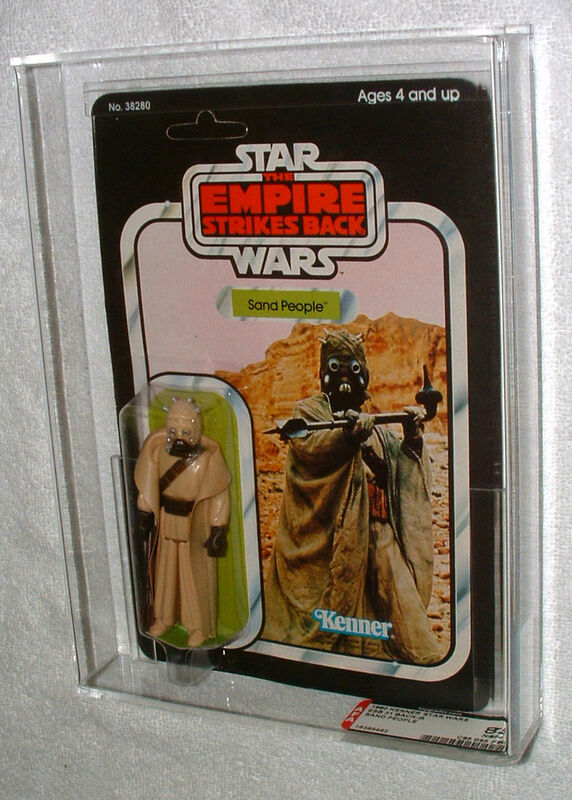 This piece is great as it’s one of the earliest pieces, it’s of a figure from the original 12 and therefore I think this was par for the course or just shy of where it should have been in terms of price. 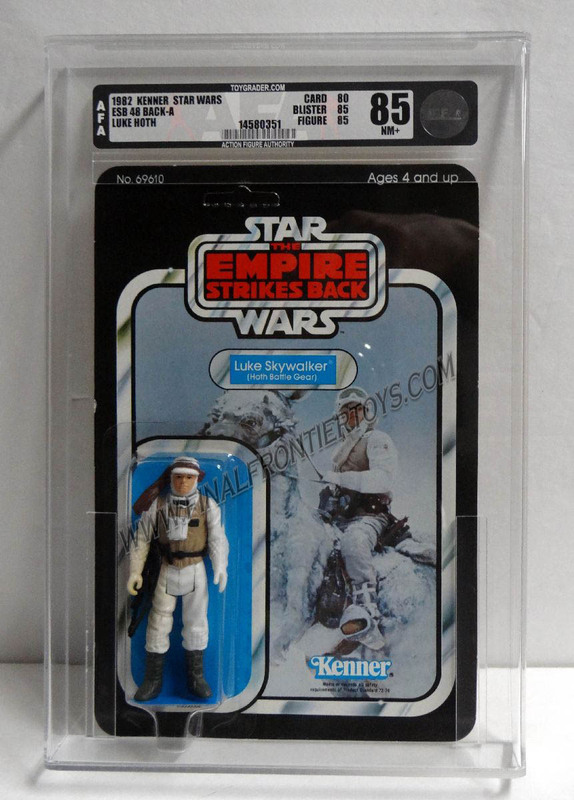 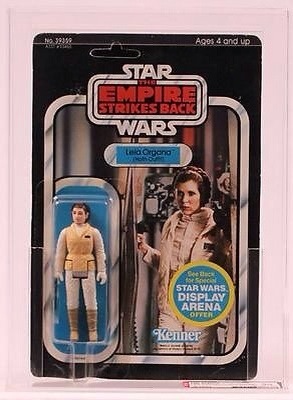 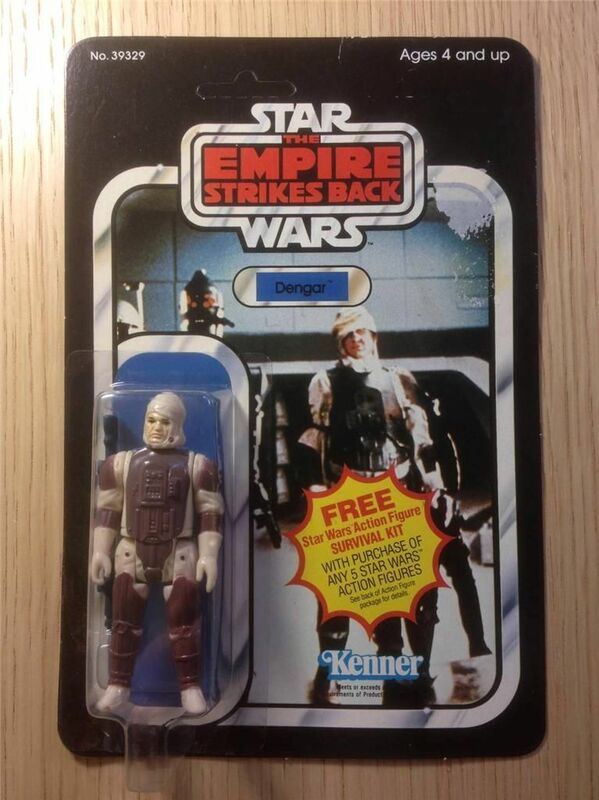 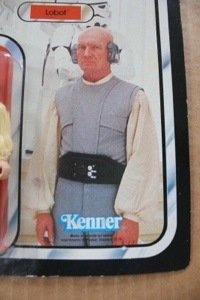 Definitely worth mentioning given the overall rarity of ESB pre-production on the open market these days. 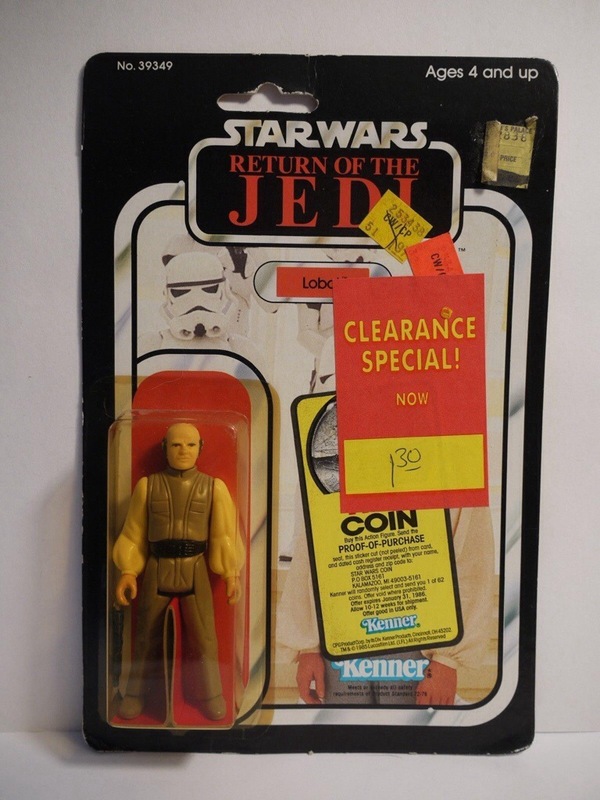 Here we have a truly rare piece by any measure of the word. 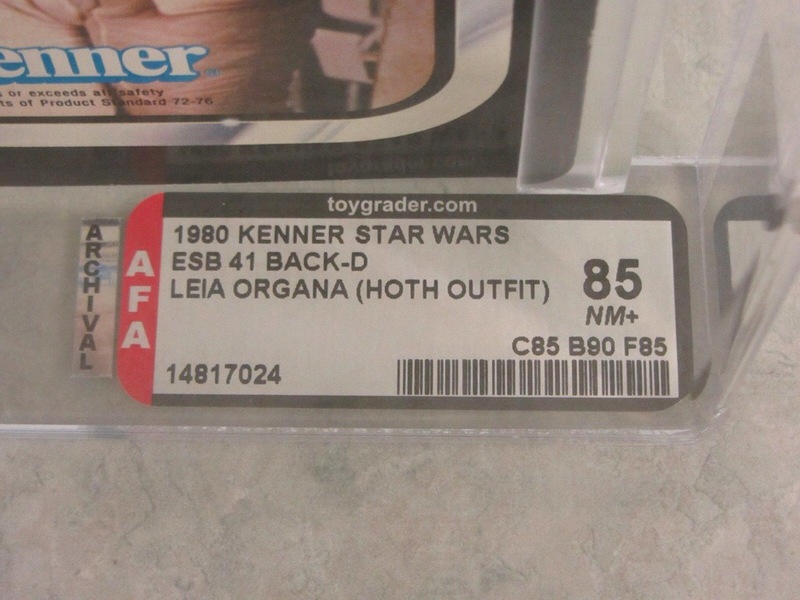 This is simply a once in a long while item to find in the market, and is therefore the first item in our highlights section. 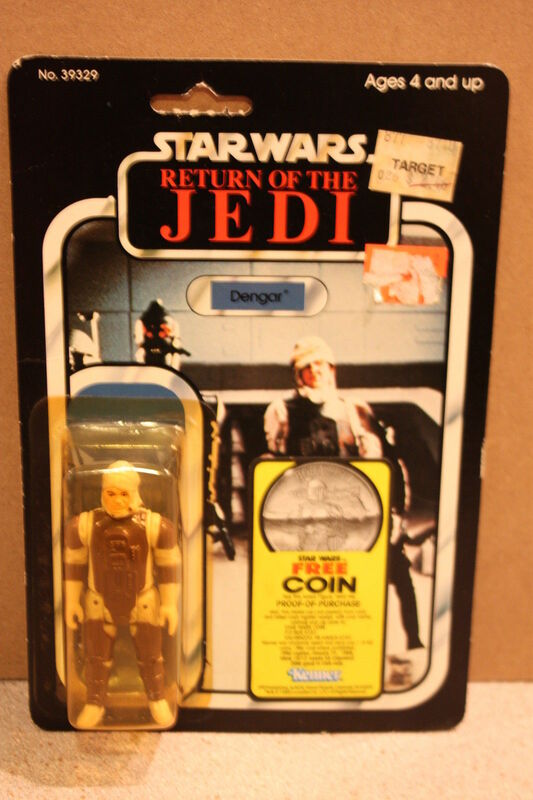 Very basic but very high demand, this piece had a very short existence as it was shortly produced but not distributed, and thus has extremely high demand amongst hard-core collectors. 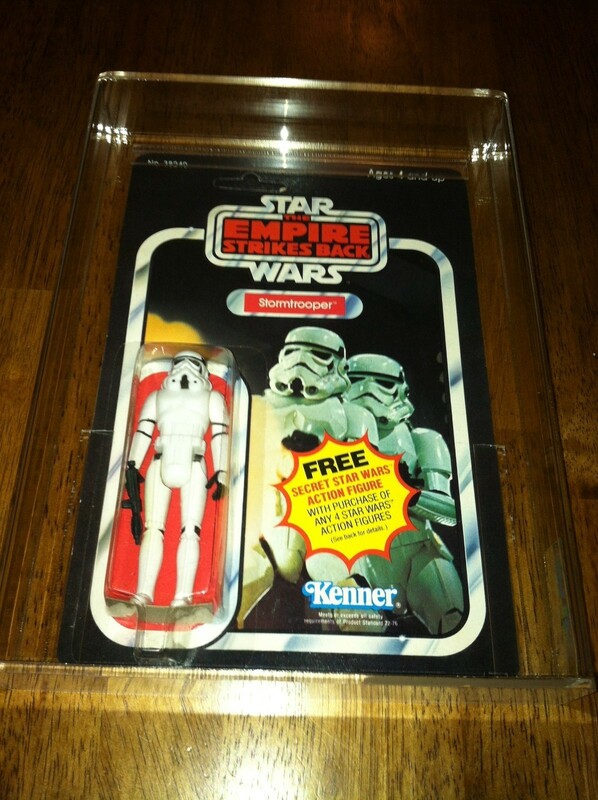 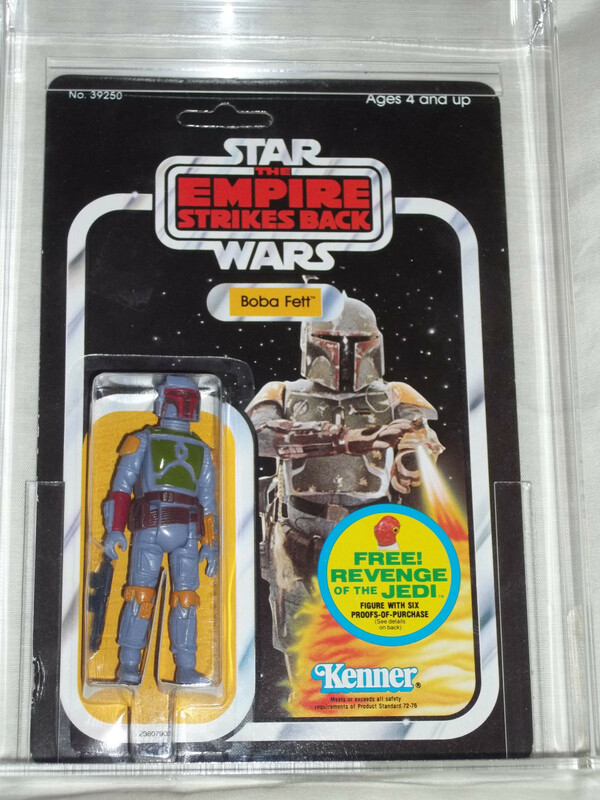 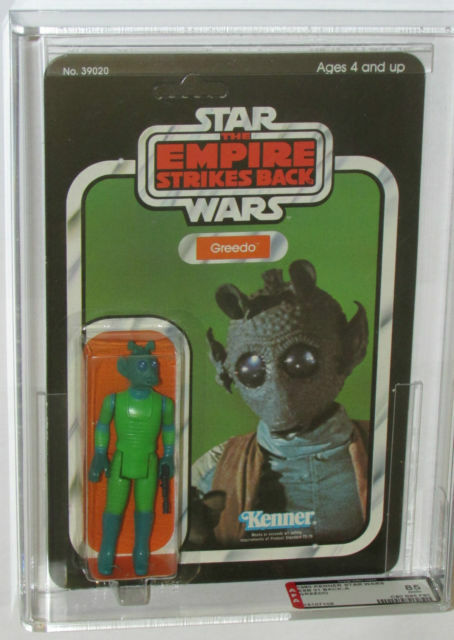 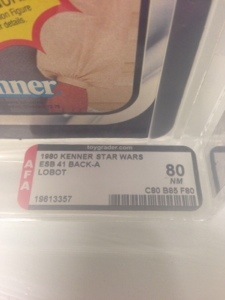 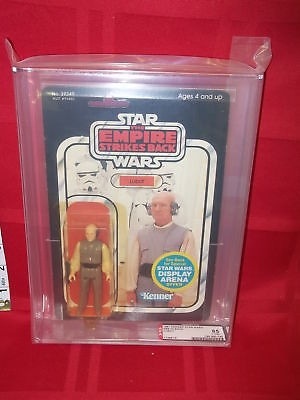 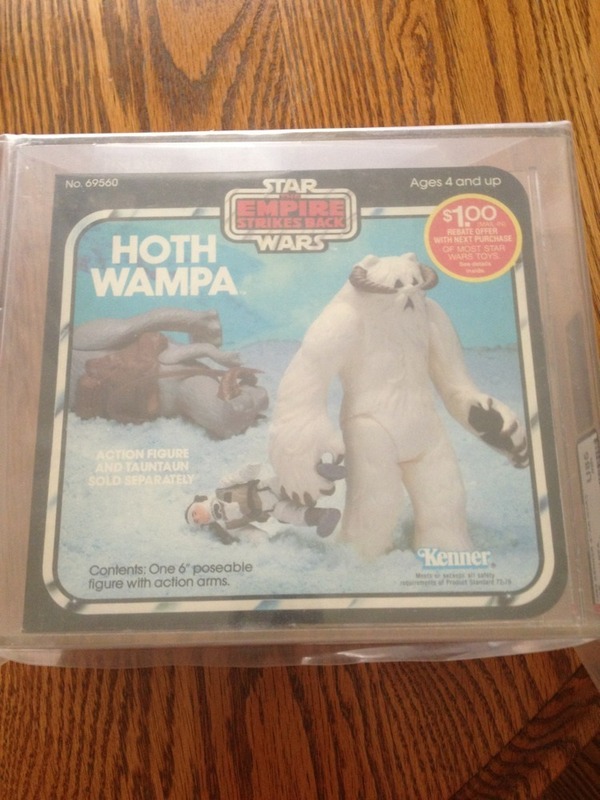 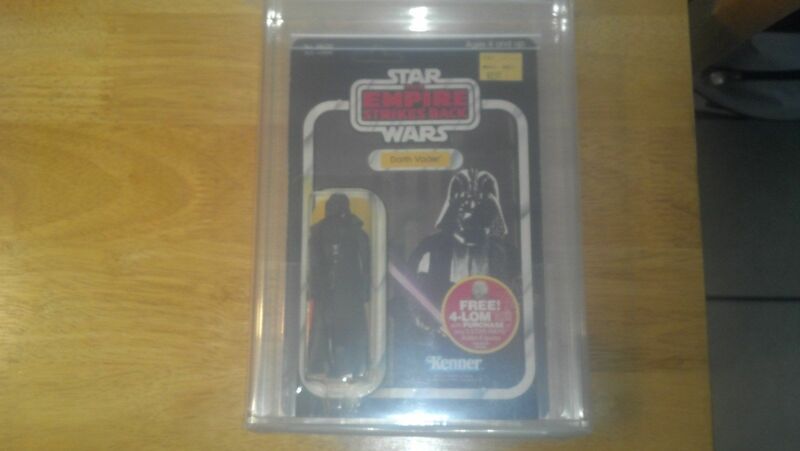 Based on AFA data there only appears to be one sealed graded example and one Q-Graded example, making this one of rarest from the Star Wars line period. 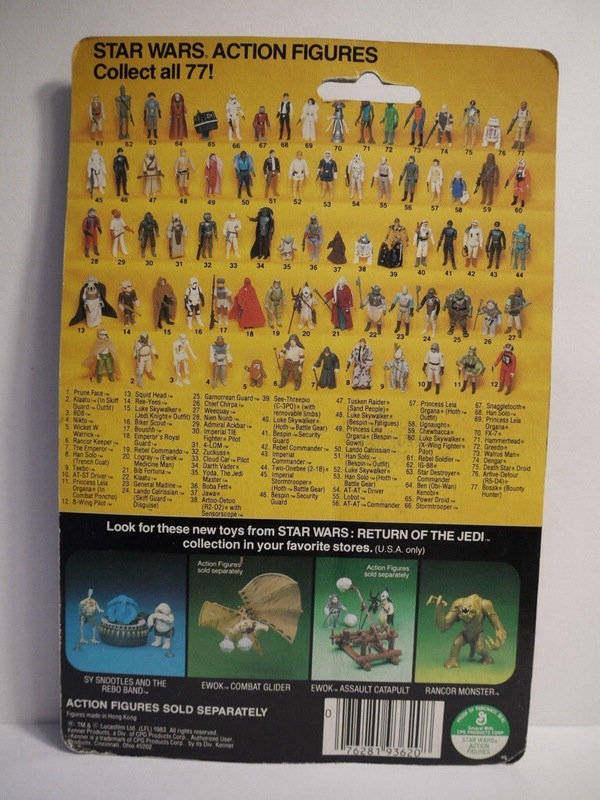 This data isn’t all encompassing as there are loose examples that have surfaced in addition to what we see here. 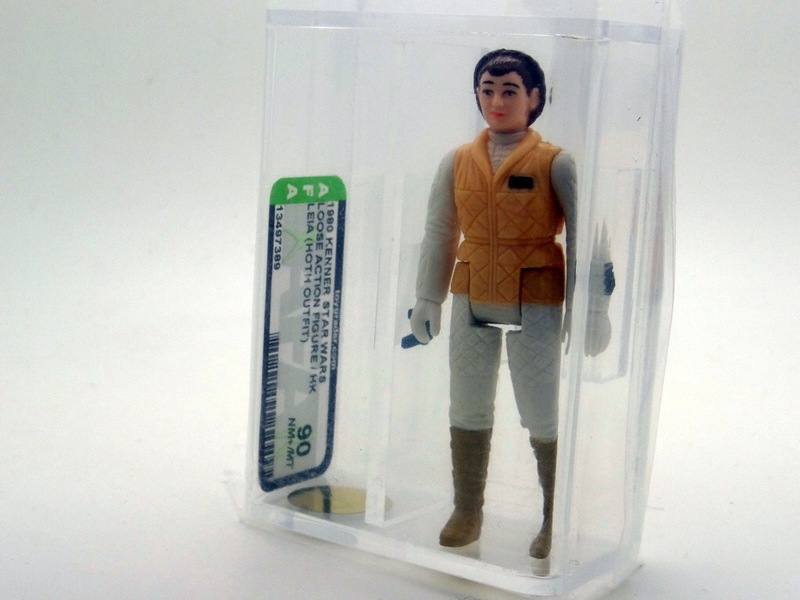 A very cool item overall given the array of popular figures, and with it’s lack of distribution it’s simply not discussed in great magnitude, but nonetheless it’s one of the best sales we’ve seen on eBay in the past few years. 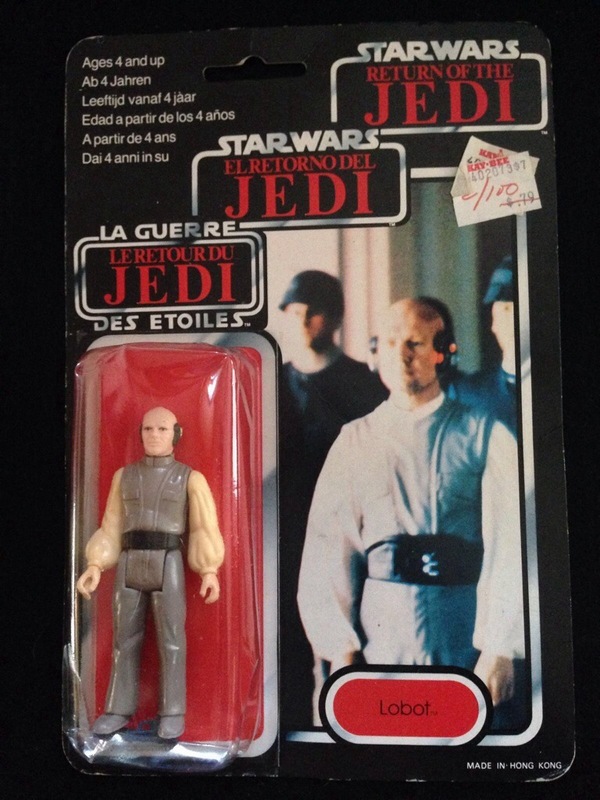 As usual we have a very rare foreign release figure to look at this month, this one from one of our favorite series, the Harbert Line. 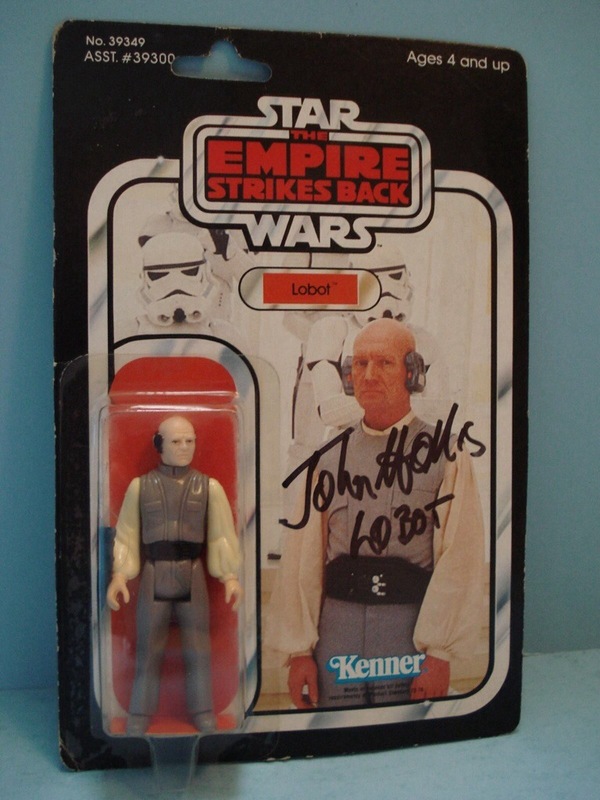 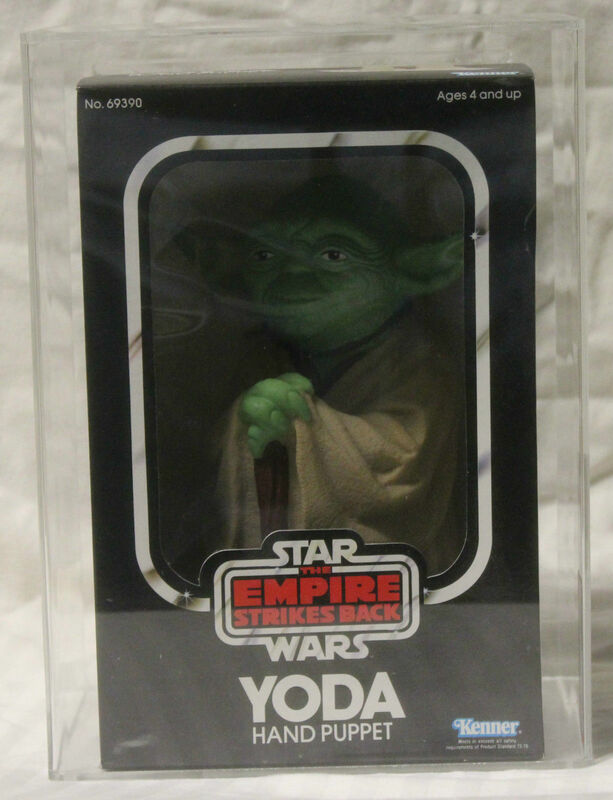 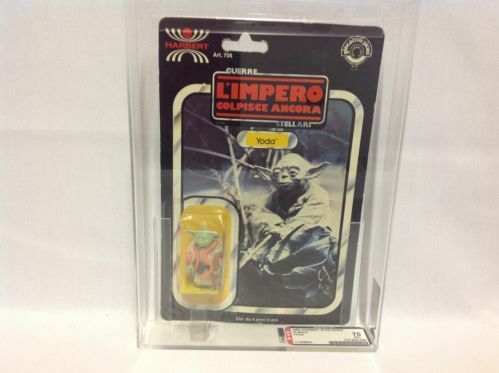 Yoda himself is a high demand figure for the ESB line, but coupled with the rarity and high demand of the Harbert series this particular item is off the chart, really when have you ever seen anything AFA70 go for nearly $8000 on eBay? 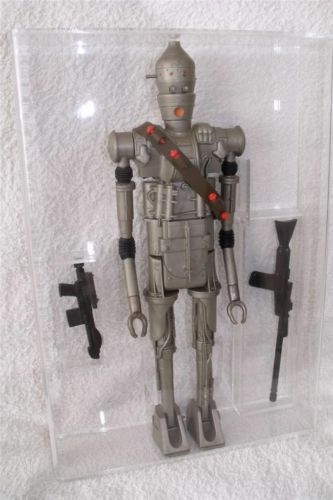 Underrated in terms of price this is my personal favorite this month, as these unpainted prototypes continue to grow in value due to the finite amount in the market and the fact that pre-production collectors gravitate towards actual toy prototypes more so than even proofs. 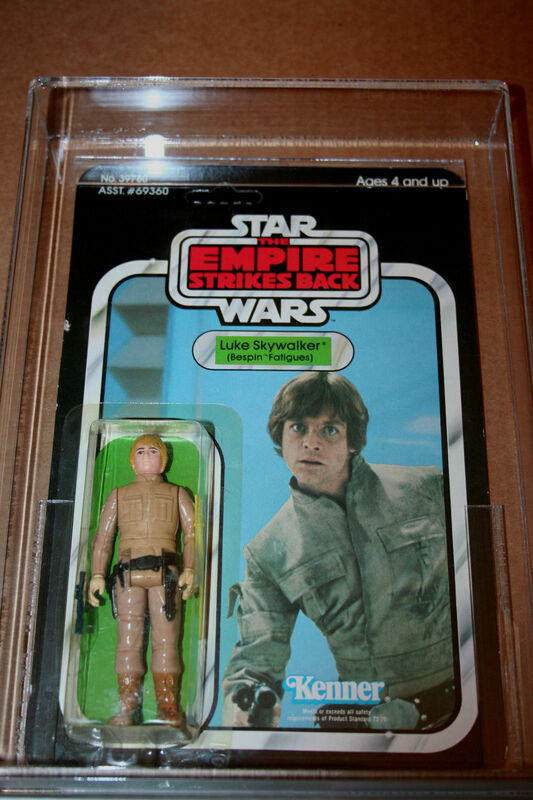 Luke Hoth being a favorite of many collectors it’s difficult to figure out why this particular item didn’t fare better in the market, with my assessment being that this could have been perceived a risk due to the lack of documentation, and for all intensive purposes a relatively new seller on eBay. 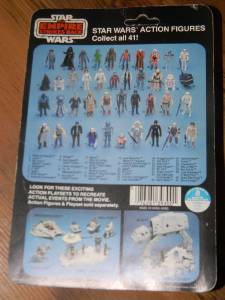 December – Star Wars Episode 4 Series Review.